Loving your RR, thanks for sharing your great pics and entertaining story line. 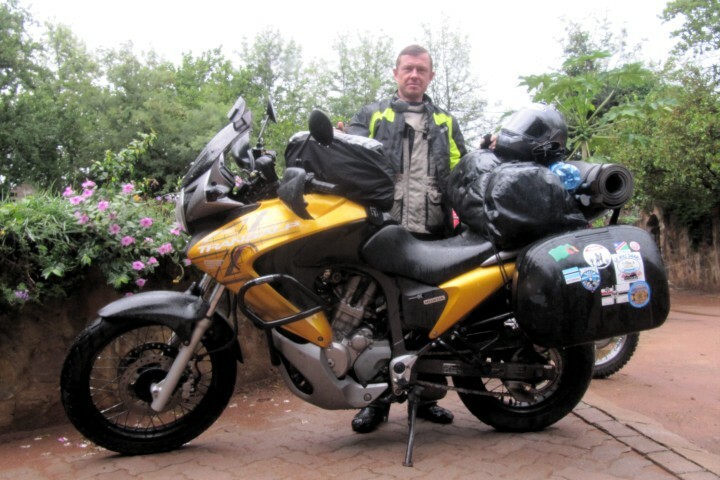 Brilliant that more and more people are touring on smaller bikes, not that I have anything against bigger bikes but as I'm touring on the little brother of your bike (CT110) I really appreciate seeing how others cope. Cool man, Thanks for tuning in :) I have a quote for you : "You only need 12 horse power to travel the world. The rest is just wheel spin." I have been on your thread too and had a read. Great stuff! I spent a few more days at the backpackers before heading to Francistown as there was a lot of rain. I needed time to setup my new laptop anyway as my old one had broken. A new one (Lenovo G500) cost me 3500 Pula which wasn't bad and I needed it for my work. I'm still lugging the old one around and need to ditch it somewhere. After the weather cleared I set off on the long boring drive to Francistown. The only thing of interest that happened was when a lorry tire went straight over a cow pat and splatted me all over with cow dung. Cheers! Arriving late in the afternoon I found some accommodation at a random "Luxury" guest house that actually wasn't so luxury and cost 350 Pula per night. I went out and ate a burger a Spurs for dinner. Nice! my first time in one of those joints. I have to admit that I was unsure how the border would be. Half the people I spoke to told me how dangerous Zim was and they always had a story to tell of a friend of a friend who ended up in jail and had to pay big bribes etc... The other half told me what a beautiful country it was. My gut told me that all would be fine. I usually find countries that are the poorest or have had some issues in the past (Colombia for example) are the friendliest. The visa and fee's process was very efficient and fast. I paid $55 for a 30 day single entry visa and about $36 for the bike stuff. I got given receipts for all payments and even had a laugh with the guys and girls who worked behind the counters. The whole process took 30 minutes. I was relieved and happy everything was fine and I made it into Zim!. I stopped off at Plumtree town to buy a EcoNet sim card for my phone. It cost $1 and the guy also enabled the 3G and put a 500mb data bundle on there for $20. Internet sorted. Next I stopped for lunch. Chicken, rice and cabbage for $3.20 and very good too. All the rangers seemed to have guns here which was a bit odd considering how little game there is. A few leopards and Rhino and some eagles. The ranger told me most people came here for the scenery. She also said motorbikes were not allowed. Very disappointing I think she took pity on me or got sick of my questions because she made a phone call and the manager was prepared to make an exception and let me stay for one night provided I didn't tour the place and just went straight to the camp site via the Rhodes grave. Result! It cost $15 for me $10 for the bike and $8 to camp. 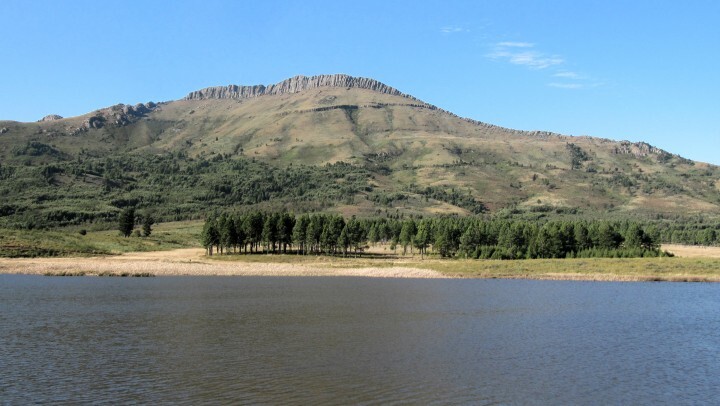 The sun was starting to go down so I drove down to the Maleme dam rest camp and set up. There were some horses around and later that night one of them woke me up rifling through my food bag! Three Austrians (Charlie, Bruno and Fritz) were also at the camp site in a 4x4 and they kindly offered me a beer and we had a nice chat and a good laugh in the evening. 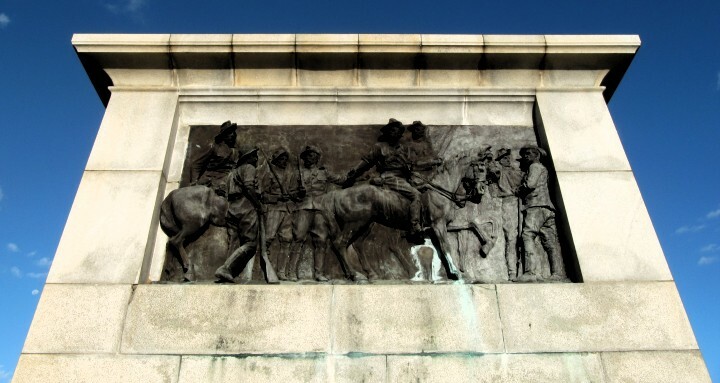 So I'm staying a couple of nights and my plans are to go to the museums in Bulawayo today and then head to Masvingo tomorrow to visit Greater Zimbabwe for a couple of nights. After that I shall probably head up to Harare then to Lake Kariba. 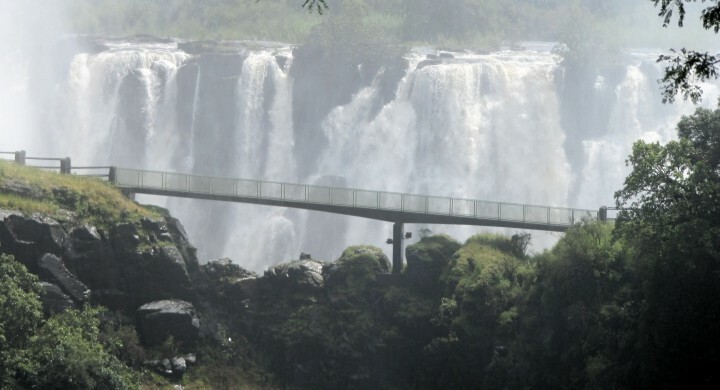 I hope to get the 24 hour ferry down the lake and then visit Vic Falls. 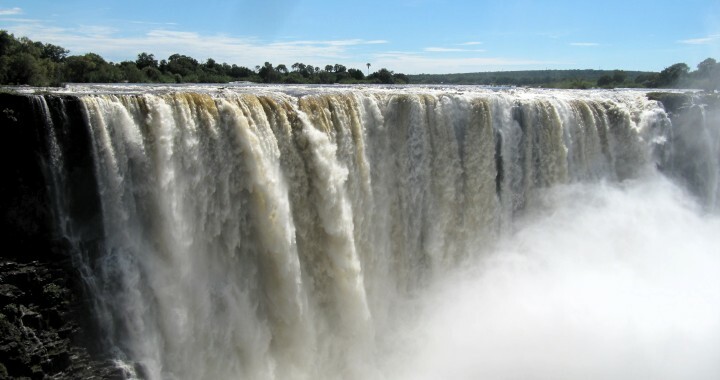 I feel that's a pretty good tour of Zim and much better than just going to Vic falls like most other visitors. I'm interested to know anyone's thoughts or suggestions ? Just checking in..... Keep up the RR great to be able to follow along! Hey man :) Good to hear from you! Hope you are well ? 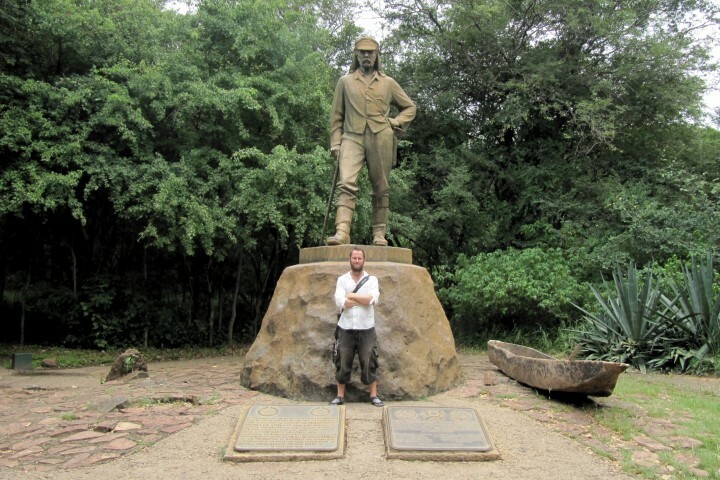 I visited the Natural History Museum in Bulawayo. Entrance was $5 and well worth spending an hour or two. Next I visited the National Art Gallery and got chatting to some local artists for a few hours. *Very interesting conversation and we went for a couple of beers at the roof top Horizon bar in town. Nice place with a pool overlooking Bulawayo. Beers were $1.50. Not bad at all! I also got chatting to the girl who worked at the art gallery cafe and mentioned how I was interested in obtaining some Zim dollars as a souvenir and she kindly brought some in the next day including a 10 trillion dollar note. 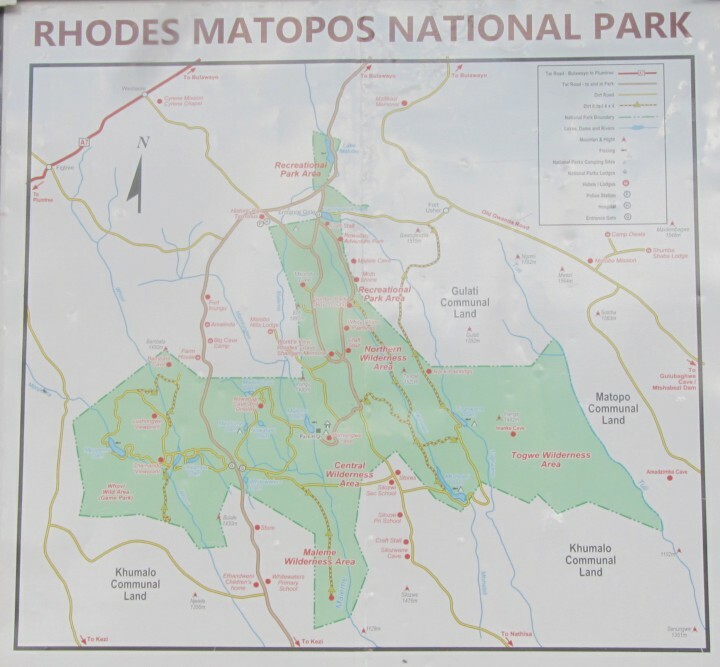 After having some coffee and early lunch I headed off to Masvingo. After about 33 km's I was checking my speedo and it suddenly zeroed out my speed. Something to fix when I got some time. 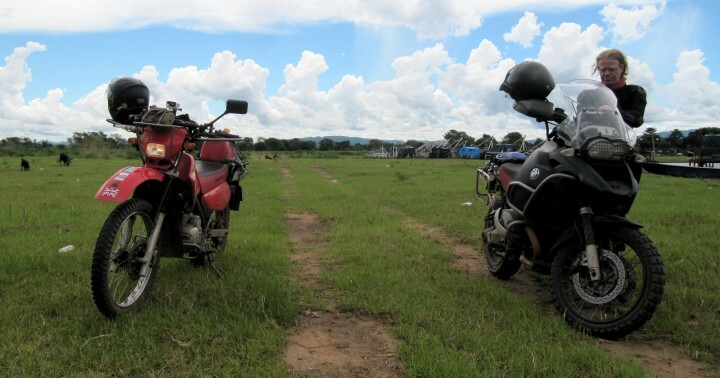 300 km's or so later I arrived in Masvingo where I checked into the Backpackers rest. It's not even really a backpackers but more of a crappy hotel. Its a dirty nasty place so stay at the ruins themselves as it's cheaper and better in almost every way. Anyway I paid $25 for a poor excuse of a room and couldn't wait to check out. 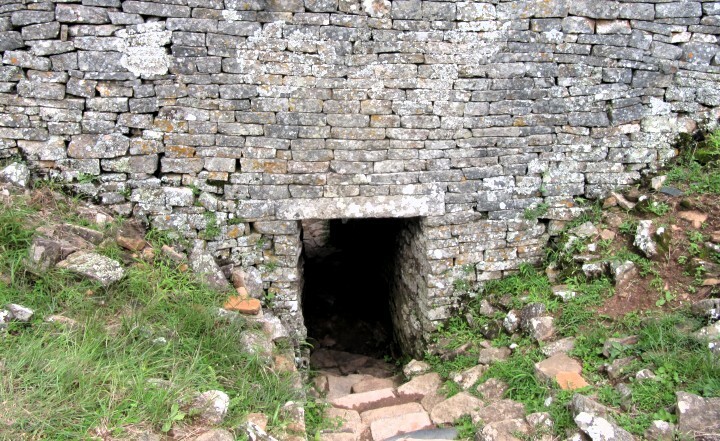 About 30 km's south of Masvingo are the Great Zimbabwe ruins. On the way I came across yet another burned out car. There seems to be a lot of these littering the sides of the roads. I paid $10 to get into the park and started to make my way up towards the Hill Complex. I kept coming across these weird creatures. No idea what they are ? Here's whats on the top. 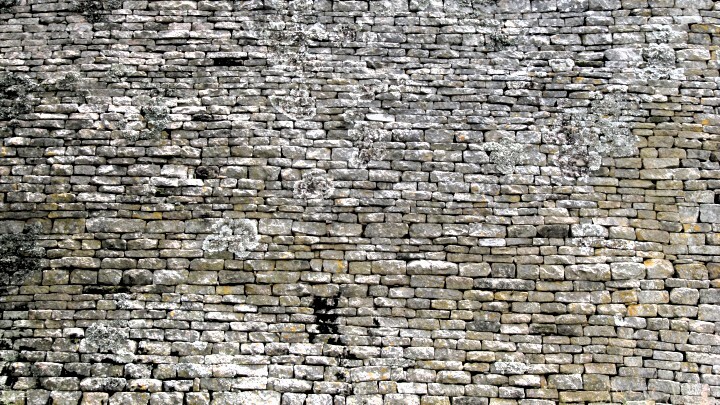 The walls were up to 5 meters tall and have used no mortar. Here's one taken with my GoPro looking out in the other direction. Also the lake in the distance. 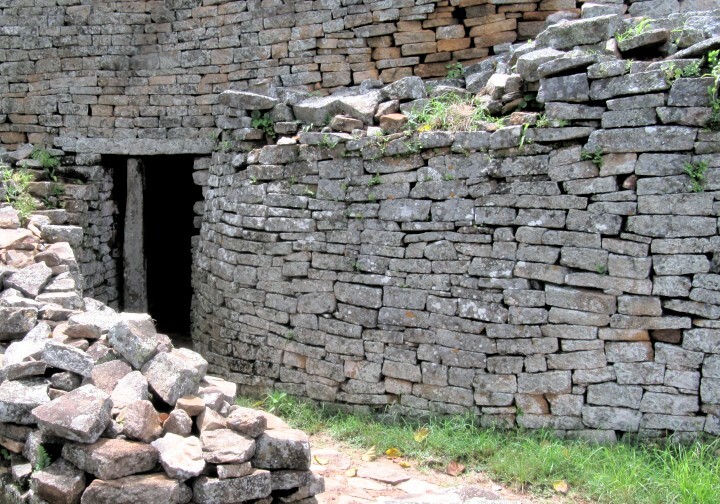 I took a walk down to the great enclosure and the Shona village. 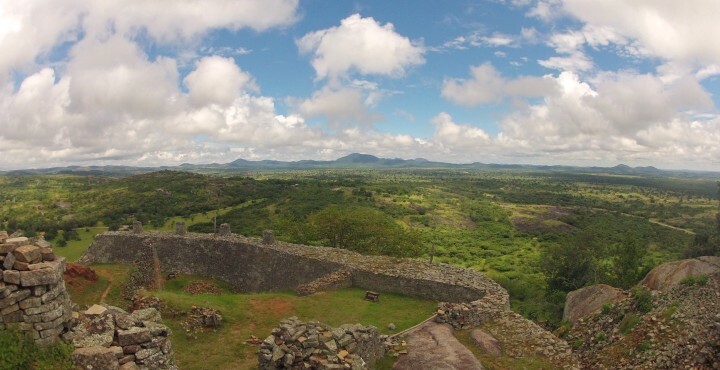 I spent roughly two hours exploring the ruins and wish I had stayed there rather than in the crappy Backpackers Rest in Masvingo. I think I remember the price of accommodation being about $20 for a single chalet at the ruins. 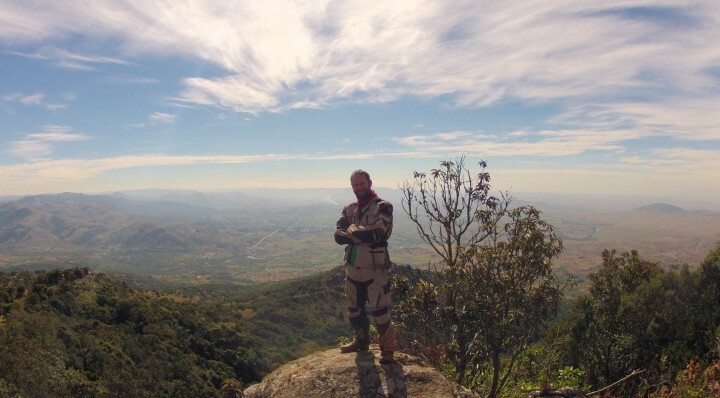 After leaving the ruins I headed towards Mutare after the recommendation from Chris (1up4adv). At about the halfway point I crossed the old Birchenough bridge. 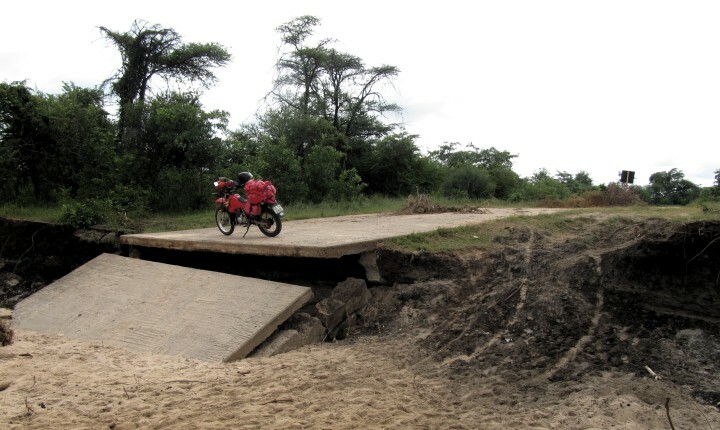 They have banned heavy vehicles as I think the bridge is a bit worse for wear. 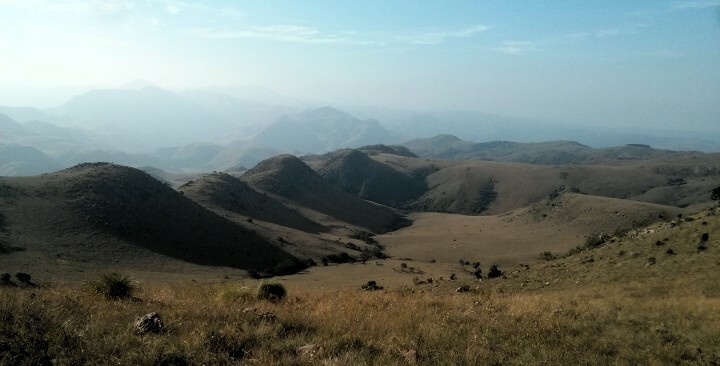 Zimbabwe's eastern highlands have some awesome scenery. A real nice change from the flat lands of Namibia and Botswana. Lots of nice twisty roads and peaks with awesome views. Perfect biking country. The photo's and video I took doesn't really do it justice. When I arrived in Mutare I went straight to Ann Bruce Backpackers. I was welcomed by Ann who has been running the place forever it seems. 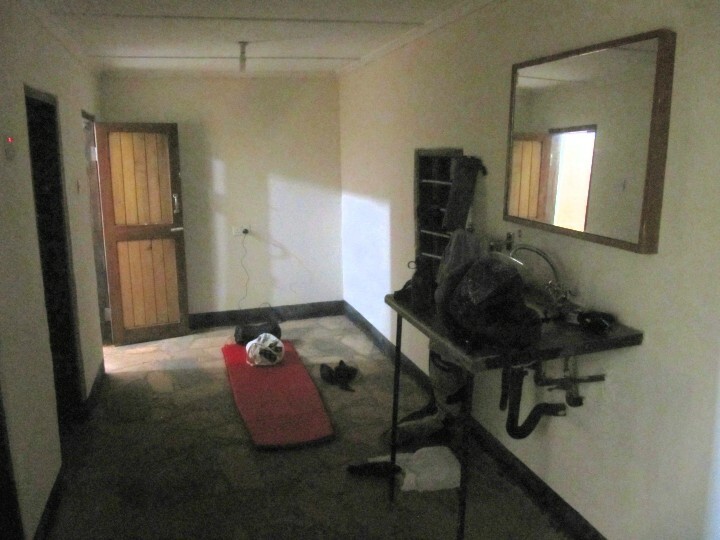 Its her residential house right in town with 4-5 rooms converted into doubles triples and dorms from $15 per night. A very comfortable and chilled out place to be. Ann is very sociable and full of stories and advice. A great place to get some down time. In fact I spent the last 6 nights there! Now I had some time I started to look at the speedo problem and soon figured out I had snapped my speedo cable. It had rusted. Probably from the Makadikadi pans crossing. I headed off into town and found two! bike shops. I managed to pick up a replacement for $18. 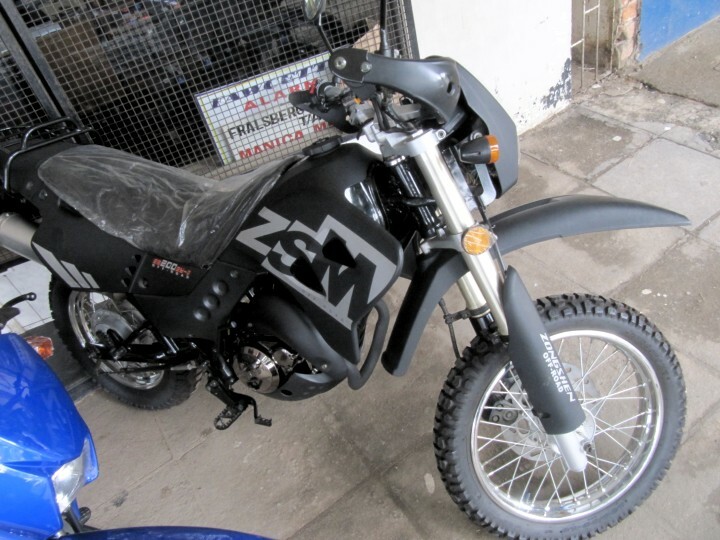 Whilst in the bike shop I came across these Chinese GY3 bikes. This 200cc was $2250. I wonder what the quality is like on these bikes... I would be interested to see a long trip done on one of these. 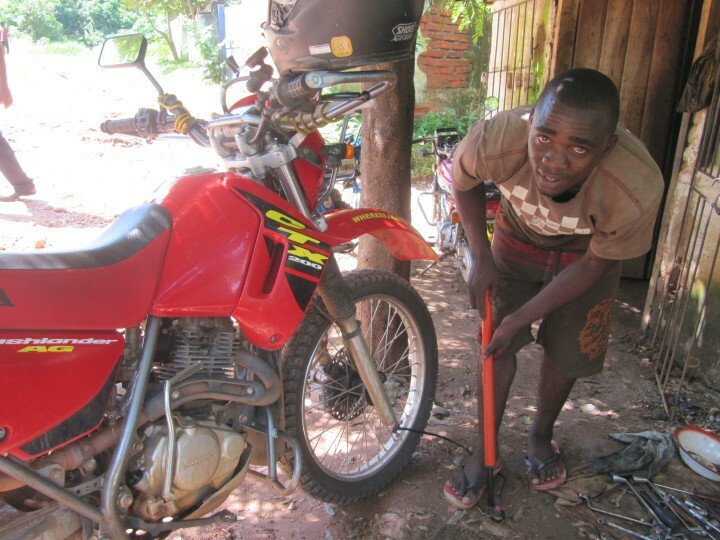 The second bike shop offered repairs and services. 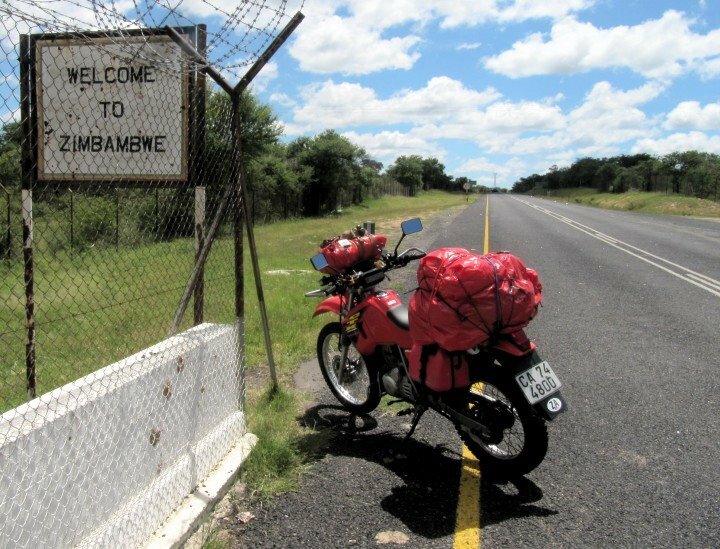 Its nice to see that bikes are more popular in Zimbabwe than they have been in Botswana and Namibia. I had a chat with the guys and they offer a full service for $80. I'm not in need of one for another couple of thousand km's so I didn't bother. They had 3 XL 200's in for work which is essentially what the CTX 200 is but with less protection and racks. Whilst staying at Ann's I met a really interesting guy called Steve who used to live in Mutare and he was back meeting up with old school friends and generally being nostalgic about the place. 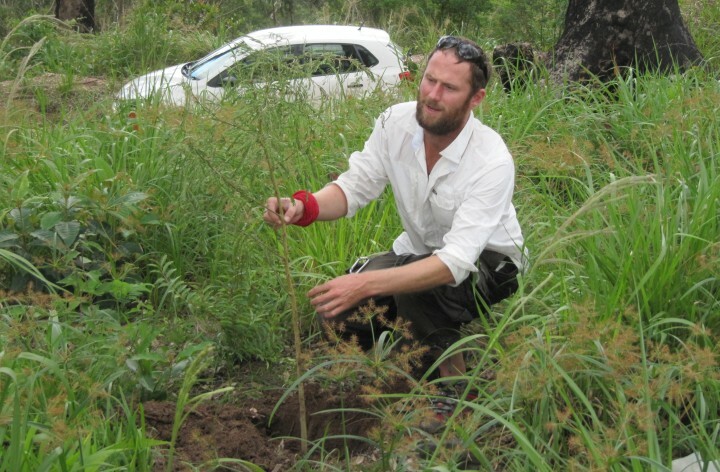 He offered to give me and a backpacker called Emily a lift with him up to Bvumba as he was planting a tree on behalf of another ex-Rhodesian. We thought this was a nice idea so Emily and I bought tree's too. First we visited the Ornamental gardens ($10 entry) which were still open but not the Tea rooms. After a wrong turn we managed to backtrack and visit Leopards Rock Hotel. According to Steve the semi-circular balcony was built especially for the Queen and mother. We had some tea and lunch on the other balcony for a very reasonable price. 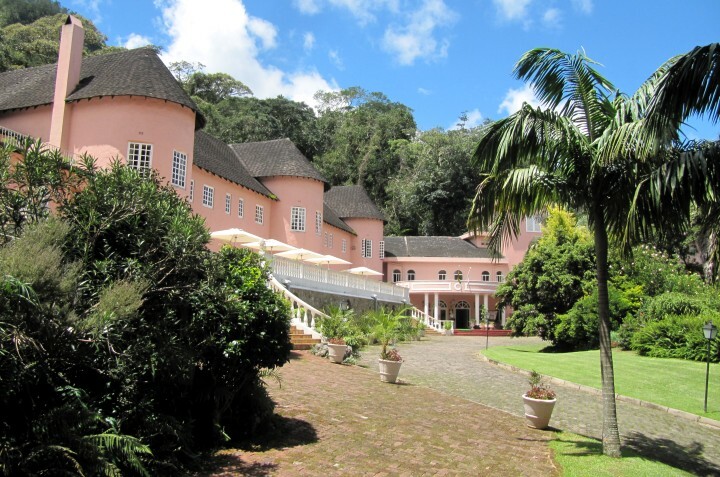 This is the residence of the former owners which was up on the hill overlooking the hotel. Apparently it was fire bombed during the fighting. Finally we got round to planting our tree's. We found a nice place near a school that had a good view and wasn't to enclosed by other plants. I have the exact GPS location so it would be interesting to see if they took hold in 10 years or so. 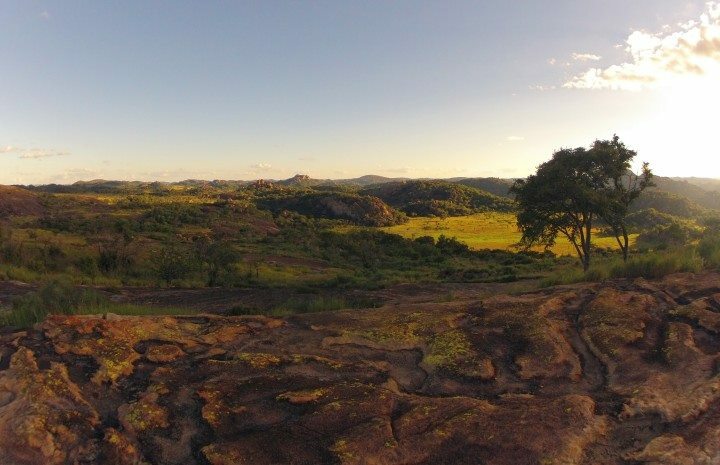 We carried on down a dirt track closer to the school and there was an amazing view point overlooking Mozambique. Steve was asked by a another friend back in the UK *to get a photo as this was the place she got engaged. I finally got round to installing the new cable. 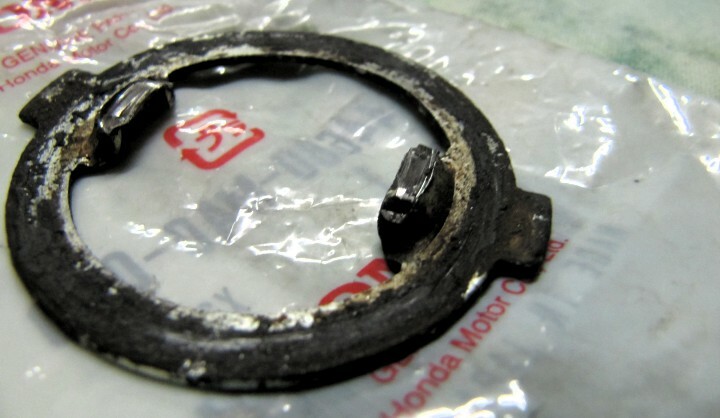 I imagine that had I been near a Honda dealership it should still be under warranty. Hopefully when I get back to SA I will get a proper Honda one installed. The aftermarket one I used is about 15 cms longer and isn't so water tight but I made it so with some duct tape. I did take the speedo apart to see if I could add on the 700 or so Km's that were missing since it broke but its all pretty well locked in which is understandable as it should't be easy to manipulate the mileage. I will see if Honda can do it for me as i liked being able to see and show people my total km's so far without having to add 700 on each time. 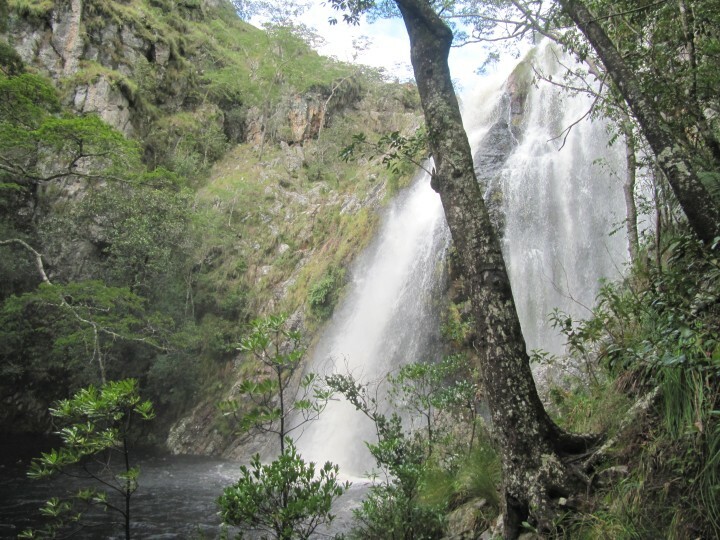 A couple of days later I decided to take a day trip to Nyanga national park via the Honde valley. Beautiful rock formations on the way. 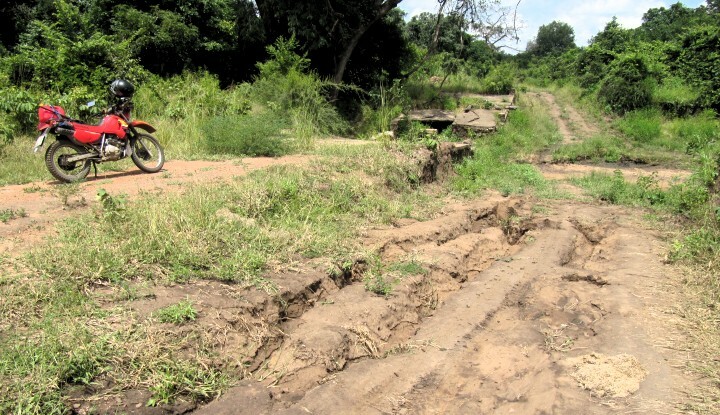 I took the non tar roads into the Honde Valley and fortunatelt it hadn't been raining too much as this mud was still quite slippery in places. I passed lots of home steads as the valley began to come into view. 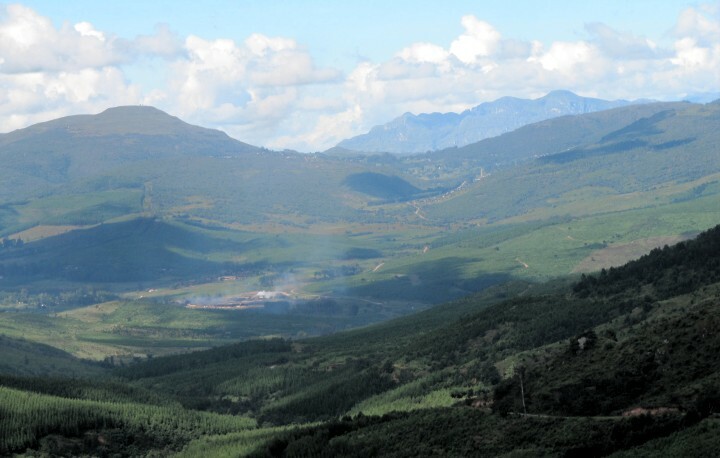 The Honde Valley. The photo's don't really do the view justice. 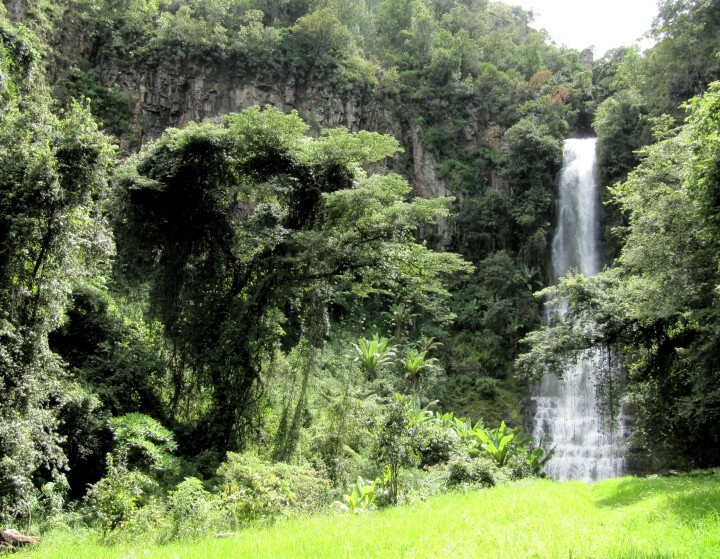 You can see the road on the right and the two waterfalls on the left. An awesome twisty drive. 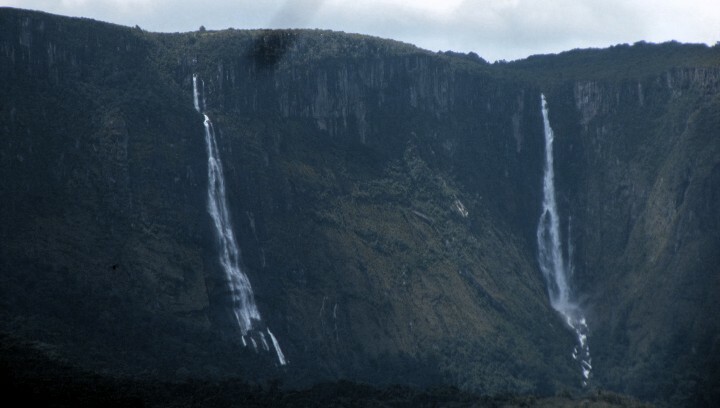 A zoom in on the waterfalls. 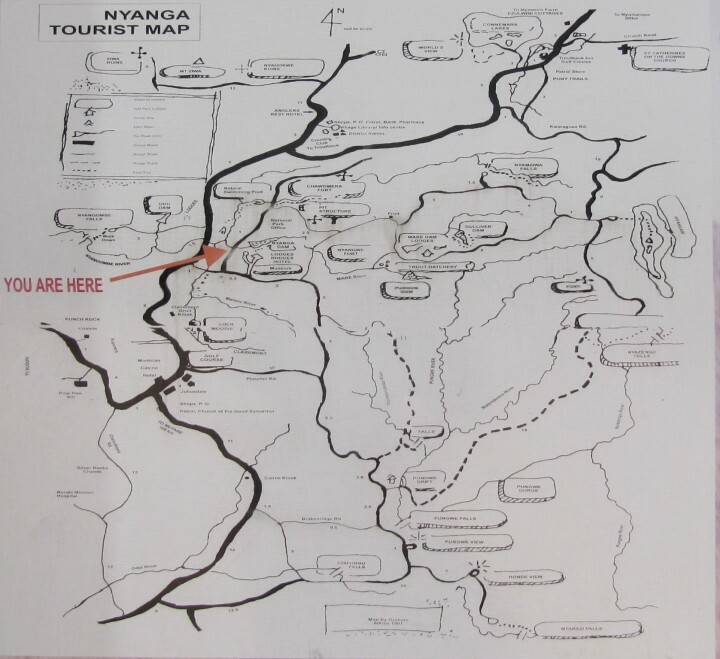 I finally made it to Nyanga National Park a bit later than I had hoped and paid my $10 entrance fee. Below is possible one of the worst maps I've come across. Its so vague, and looking at my GPS trace of the trip, not much like the actual shape or distance of the roads. 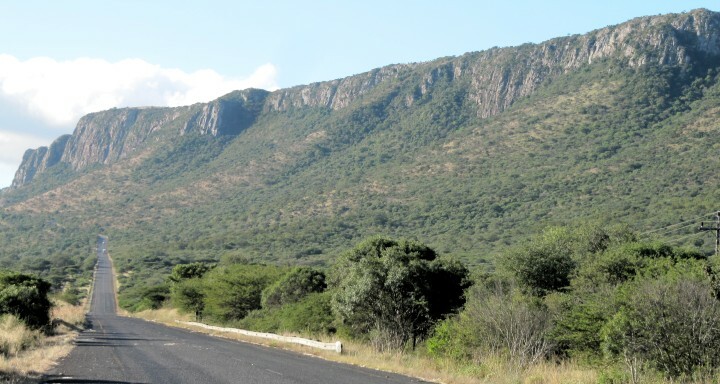 I was on the circular drive around the park and at its farthest point is Mount Nyangani which is*highest peak in Zimbabwe. 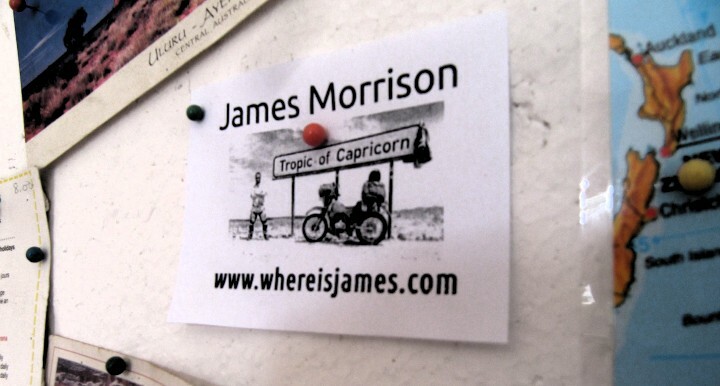 A visitor went missing up there last month*and still hasn't been found. 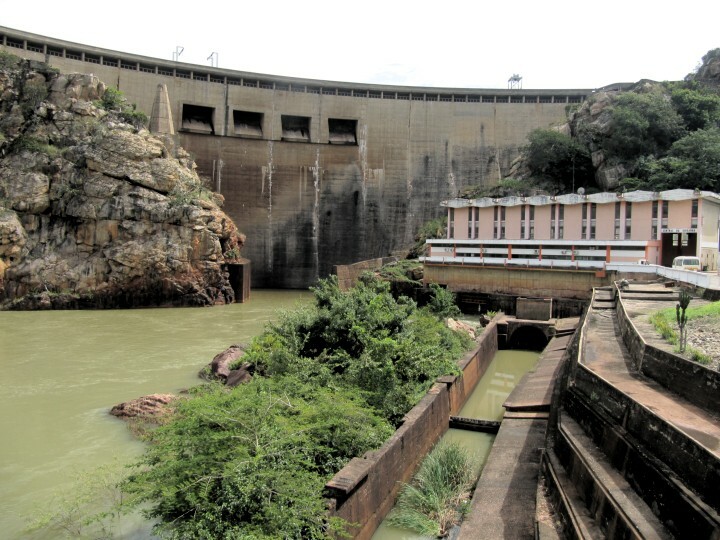 Towards the end of the circular drive is Udu Dam. There's a guy fishing in the middle. Lots of trout I expect. Here's a picture of Emma, her daughter Deborah and an Angolan student also staying at Ann Bruce Backpackers. Whilst in Mutare I noticed a vinyl graphics shop around the corner of the backpackers. Its the place that all the mini van's get their bizarre graphics done. 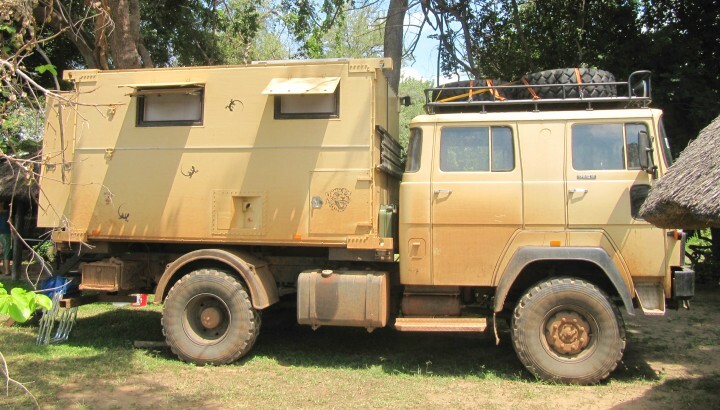 Things like "2 Bad 2 Fail" or "4WD OVERDRIVE" or whatever put on the side of their buses. I was chatting to Costa the Cypriot owner and he got one of his girls to make a union jack flag and my "whereisjames.com" website address. Only cost $5 and looks pretty cool I thought! 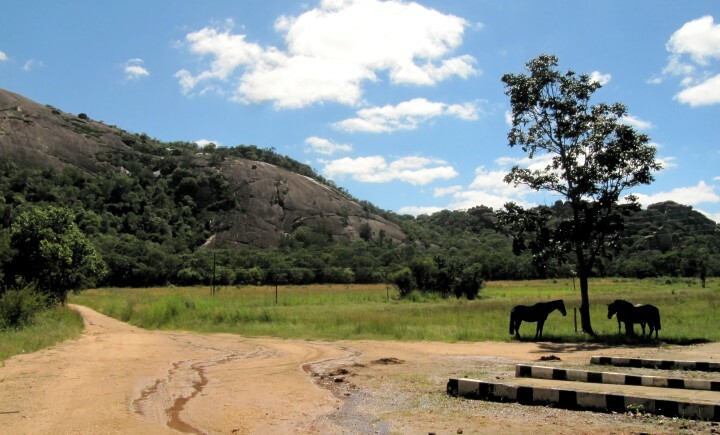 After being in Mutare for 6 days I decided to head to Chimanemane as I had heard from several people how nice it is. 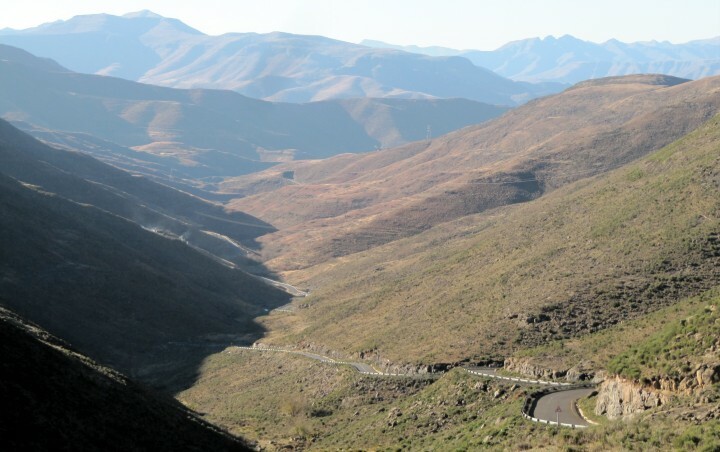 It's an awesome 150 km ride of great twisty roads and impressive vista's over the valleys. 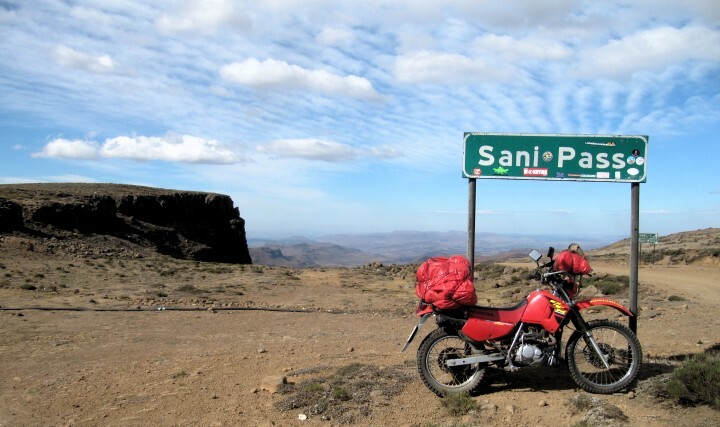 Great motorbiking country. I'm currently staying at The Farmhouse for $20 a night. 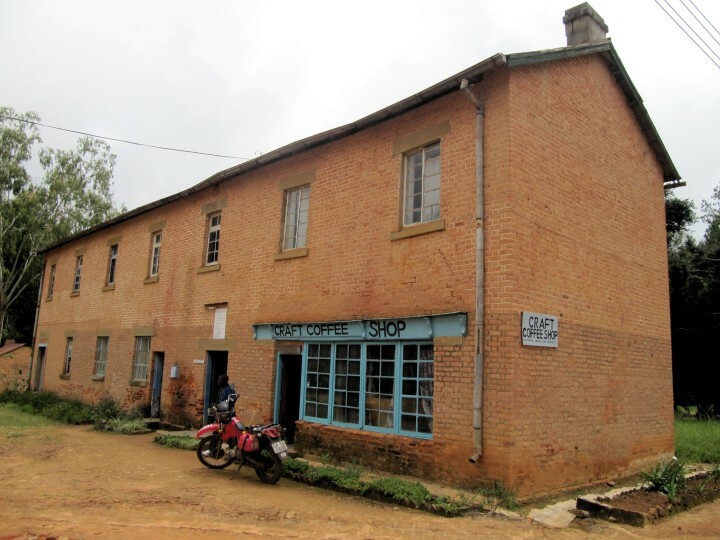 Its one of the oldest buildings still standing in Chimanimani. 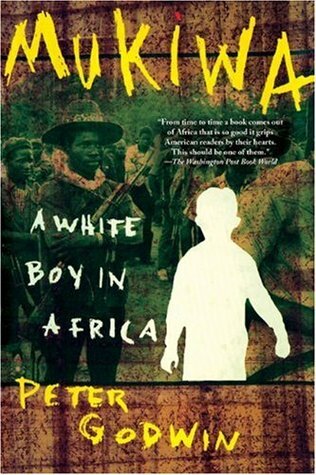 Ann Bruce from the back packers recommended I read*Mukiwa: A White Boy in Africa. Its a great book with an interesting insight into Zimbabwe. Kindle's are essential for travel in my opinion. 1000 books in your pocket and when you get a recommendation you don't have to hunt round book shops and pay crazy prices. 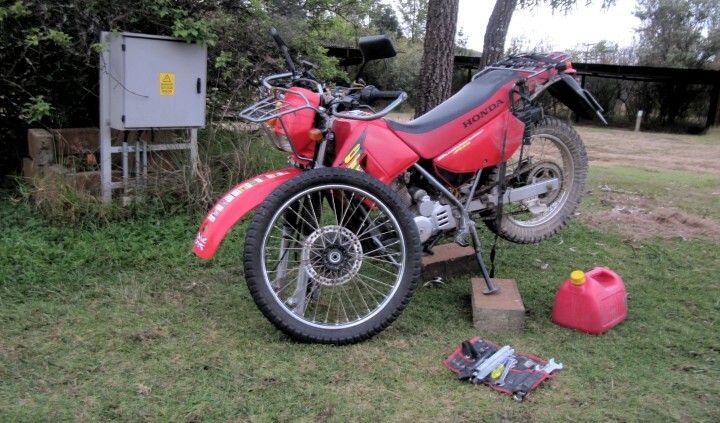 I even have the Honda XL 200 workshop manual on it along with phrase and guide books. Handy! After staying a night at The Farmhouse*they had some guests who booked the whole house so the other guest Stefano (from Italy) and I moved up the hill to a new place that was being managed by Tempe the Farmhouse owner. We had the whole house to ourselves and all for $20 a night! 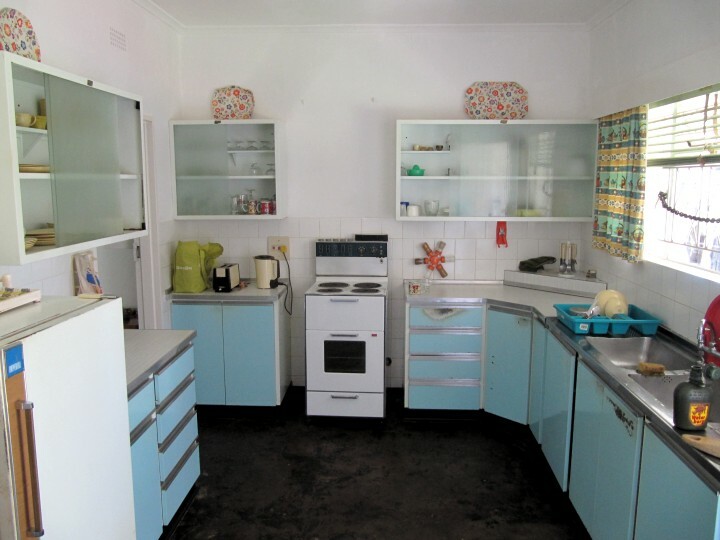 The house seemed like it had been furnished in the 70's and then never lived in since. Apparently the owners moved to South Africa and the house has been used by their children and the occasional guests like us. 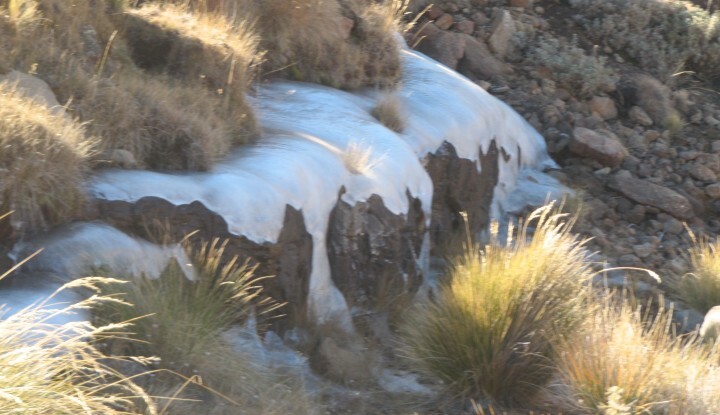 The weather was very temperamental this time of year in Chimanimani and so I added my waterproof layer to my jacket and trousers just in case. When I spoke to the national parks guys he told me that normally bikes weren't normally allowed but he didn't seem too bothered so I paid $10 for my permit (no charge for the bike!, cars pay an extra $10), filled up with fuel and set off exploring. My first stop was the Bridal Veil falls which were impressive. There's a nice camp site right next to it where you can stay for about $8 per night. 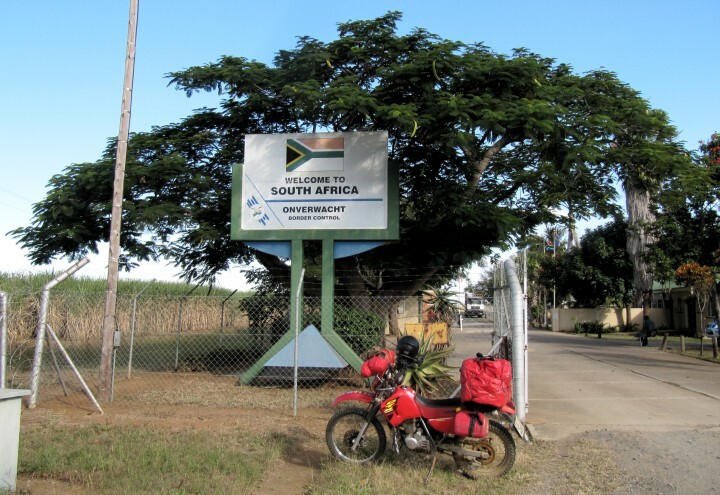 Next I headed to a place called "The Corner" which I think is named because it protrudes towards Mozambique kind of in the shape of a corner. Not sure! 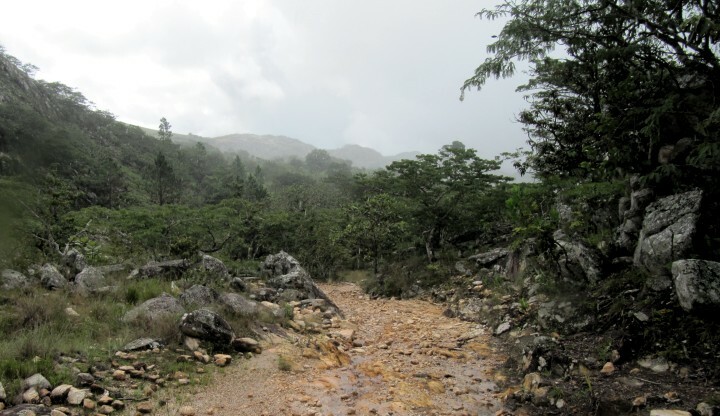 You head out of Chimanimani along "Scenic Dr" which soon becomes mud. It began to rain lightly for the first 10 km's but soon the sun came out again. 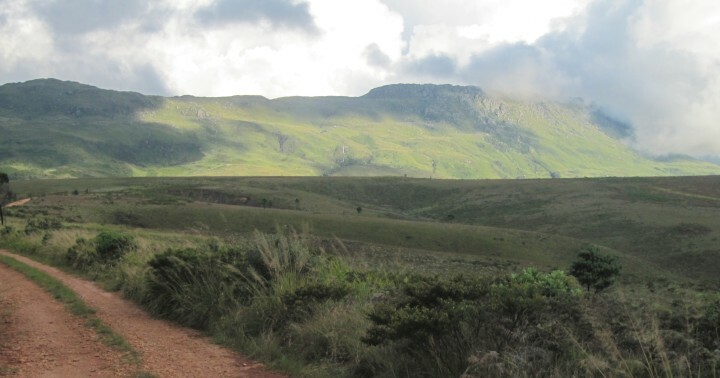 The area around Chimanimani has stunning valley views that are hard to do justice with a photo. 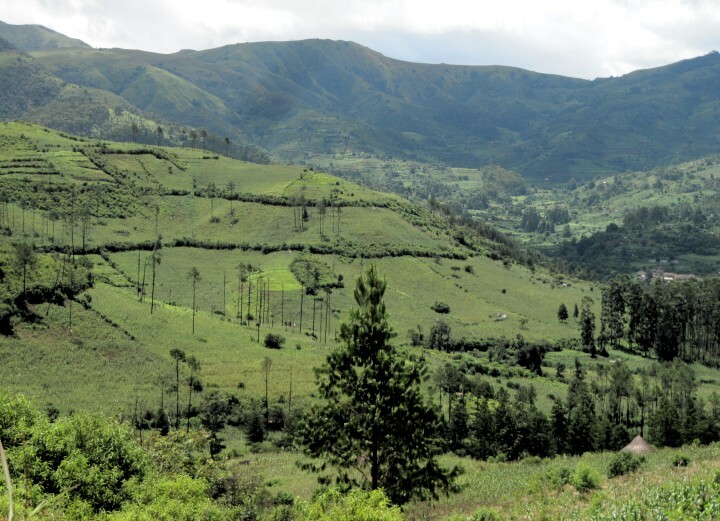 This view reminds me of my time hiking around Salento, Colombia *two years ago. Obligatory bike pics. Its amazing how many pictures you take of the bike when you travel by yourself! Still videoing too. I think I have around 60 GB of footage so far. All filmed at 720p High Def. Its going to take some editing! I had quite an odd experience when I got a bit lost after some lady on the side of the road waved me down and told me to go in the wrong direction. If I had carried on the way I was going I would have been fine. Anyway, I ended up in a small village and started asking around for some directions and was sent over to a man carrying a 4-5 year old. At the sight of me the child started screaming and desperately trying to escape. It was very odd and I wonder why he reacted this way. Had he not seen any white people before ? I was off a track off the beaten path so its possible I guess. Or perhaps his parents had threatened him when he was naughty that the Mukiwa (Shona for "white person") would come and take him away if he didn't behave! I found my way again and followed an increasingly narrower dirt track that rose over the top of the hills. 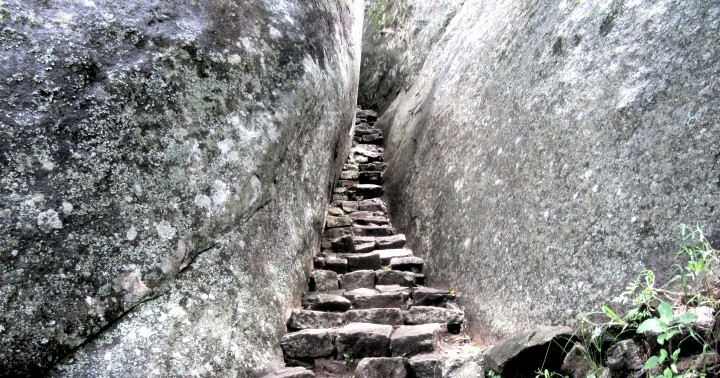 The weather was worsening the higher I got and the path became loose rocks like below. 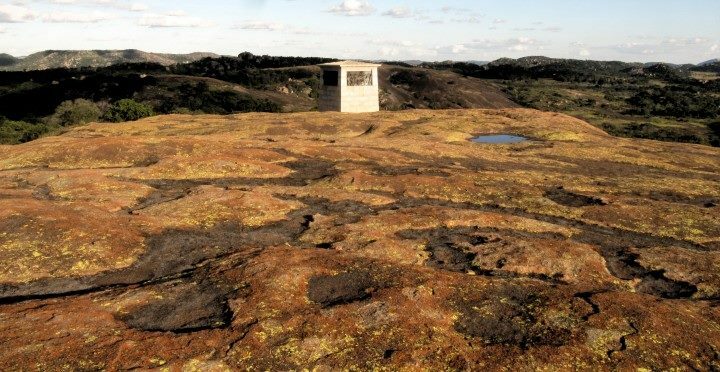 There was a camp site there and i was literately 400 meters from the border with Mozambique. I made my way back and the weather was still sunny. Lots of small homesteads growing maize meal can be seen from the track. 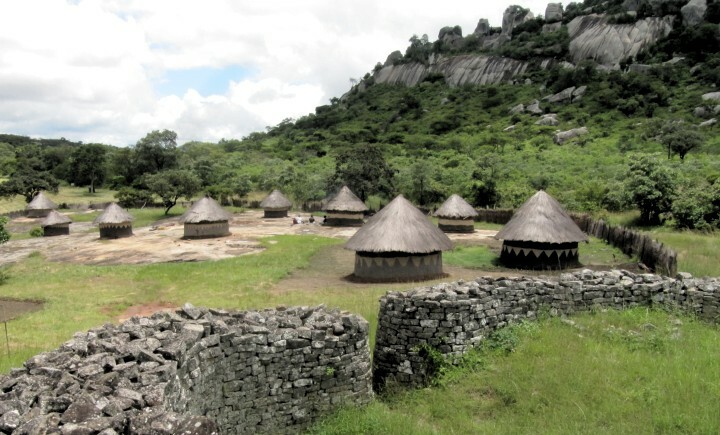 I notice that generally the rural Zimbabweans seem like very tidy and self sufficient people. 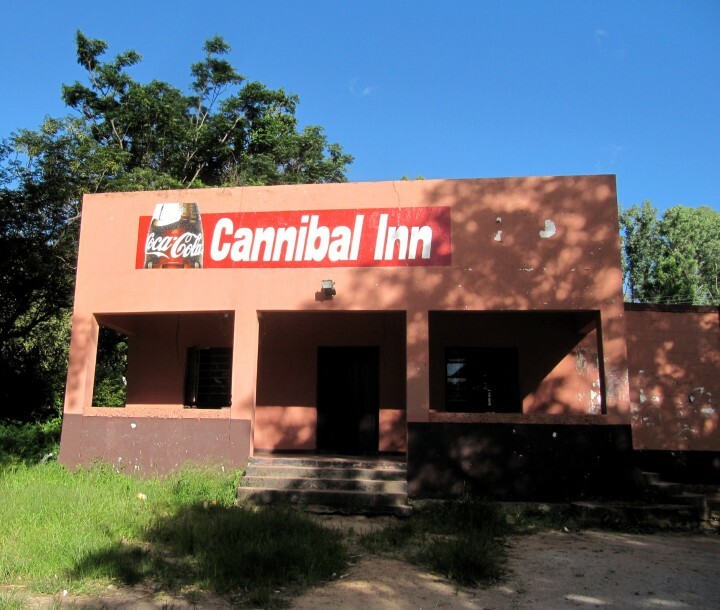 About 5km's outside Mutare I came across this fine eating establishment... I decided to wait until Mutare and had a Nando's instead! 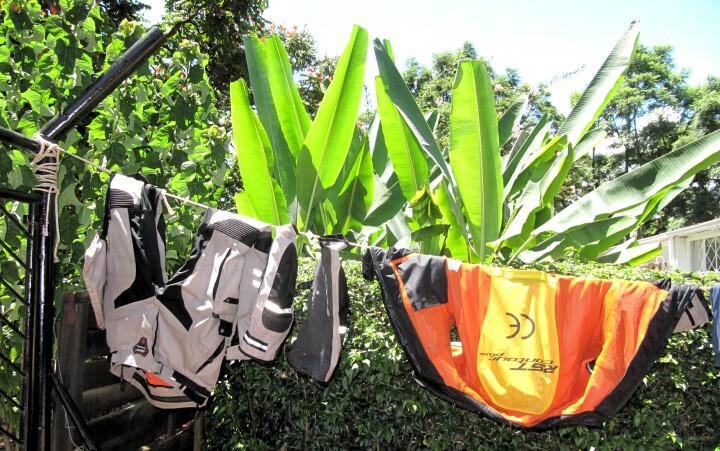 I spent 2 more nights in Mutare and gave my gear a good clean as 4 months in they were beginning to stink! This RST adventure pro gear has been pretty good although I have to wear it without the waterproof layer as its just way too hot otherwise even with all the good venting. This means that every once in a while I get a good soaking but fortunately the Africa sun and the wind dries me out pretty quickly. The next morning I drove from Mutare to Harare which was only 250 km's. I arrived mid afternoon and headed straight for the Small World Backpackers*which is a good backpackers to stay in. 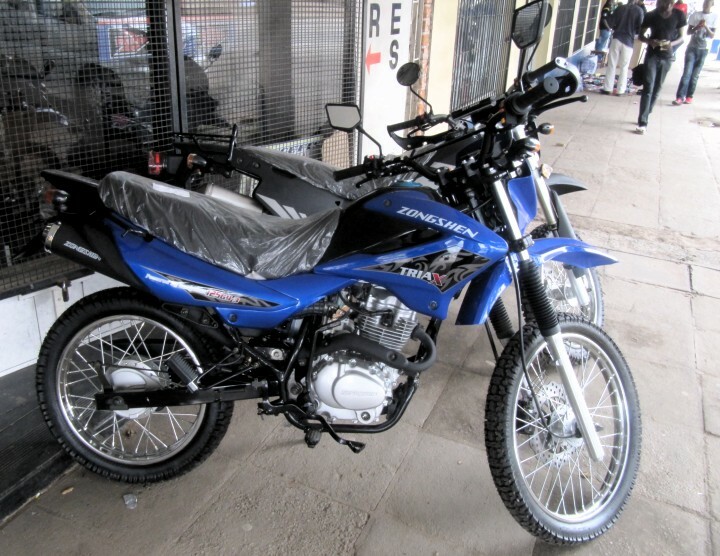 I got on the phone and called Honda Harare to see if they had a service center for the bike which they did and they even managed to book me in for the next morning. Perfect timing! Back at the hostel I met some nice people including a fellow British guy called Andrew who is doing some sort of medical volunteer work in Harare. He told me a story of how he spent a night in a cell after being accused of interfering with the presidential motorcade! A big misunderstanding of course but pretty scary stuff I imagine. Especially when you are being told by fellow inmates that endangering the life of the president carries a 20 year sentence! We all played a dice game called Dudo that evening which as good fun. The next morning I headed towards Vic Falls. Being over 800km's away I knew I would need to take two days to get there and decided to go through the midlands versus the normal highway route via Bulawayo. On the way I stopped at a Chicken Inn for some quick lunch and met some nice locals who asked about the trip. About 2 km's out of town I felt for my passport, check, then my camera's. NO! I had that horrible sinking feeling and immediately thought that I had been pick pocketed in the Chicken Inn as my coat was on the back of my chair and possibly pickpocket-able. I spent a few seconds swearing and contemplating driving back when I remembered I had put them in my waterproof bag as it was raining earlier. Phew! I drove on and came to Kwekwe where I headed west to take my short cut. 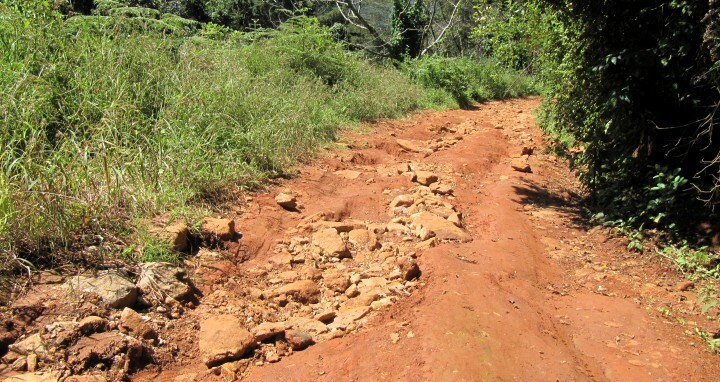 The road started out fine then it went to a single track then gravel then sand. I was kind of regretting my decision but the road soon became firmer to my relief. After a while I came to a road closed sign where the bridge had been washed away. 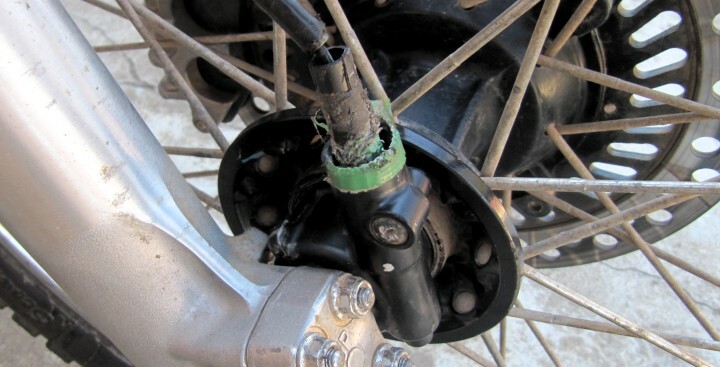 As you can see its not too much of an issue for my bike . 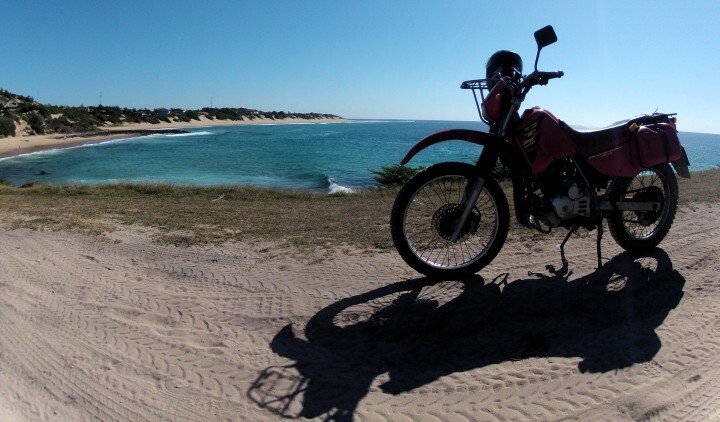 As I had all my luggage I got off and pushed the bike to lower its weight in this deep sand. I made it across with ease. According to my GPS there was a town in the middle called Nkayi with a petrol pump and therefore hopefully some accommodation. I filled up with fuel and came across the Panke lodge which was $15 per bed. Sorted! I was unsure whether I would need to bush camp that night. To be fair there were plenty of places you could. 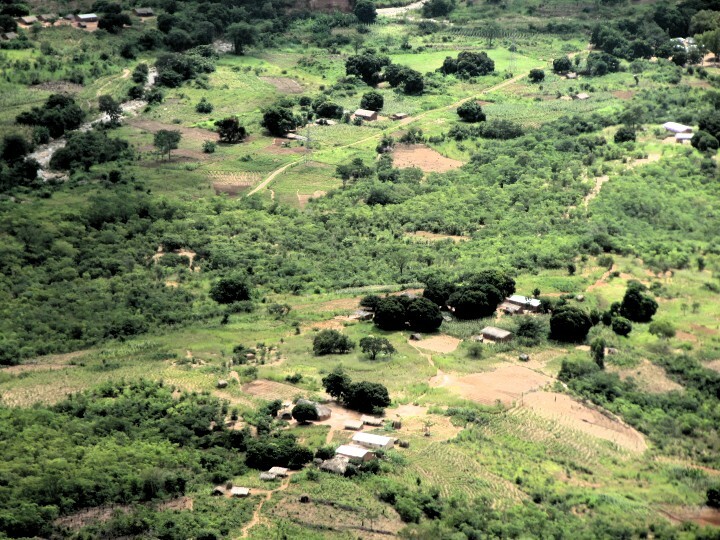 Nyaki is a small town with a large green square in the middle. At least a quarter of the establishments were bar's. This seems to be the case in most small towns. I ate my standard beans and pilchards that evening and watched some TV shows on my laptop. 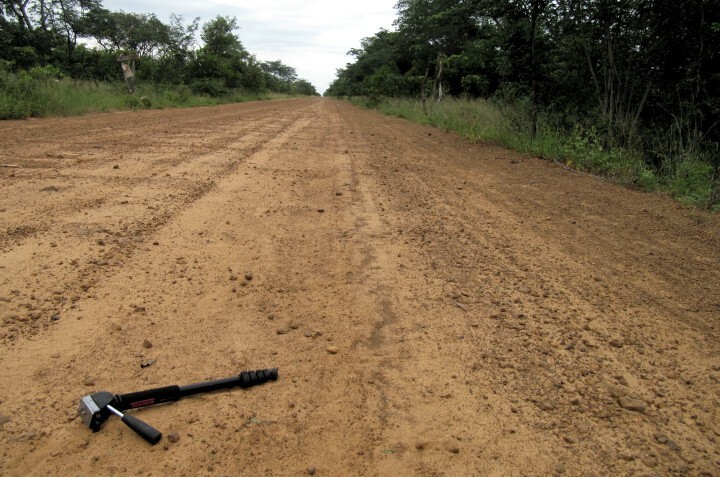 The next morning I headed towards Lupane. Stopping for a water break I noticed my monopod was missing off the back! After loosing my last two tool kits and going back to look with no avail I was tempted just to drive on but decided I would drive 10 km's back and if I didn't find it then it was lost. Fortunately it was 2 km's back. Result! 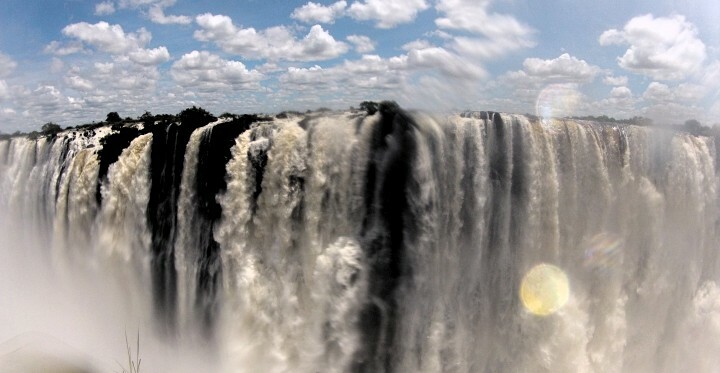 I arrived in Victoria Falls mid-afternoon and checked into Shoestring Backpackers for two nights. Cost $10 per night. Its a rowdy place with a big party atmosphere but not the best hostel so i moved to VicFalls Backpackers where I'm currently staying. Cost $15. Its much nicer here but a little out of town. 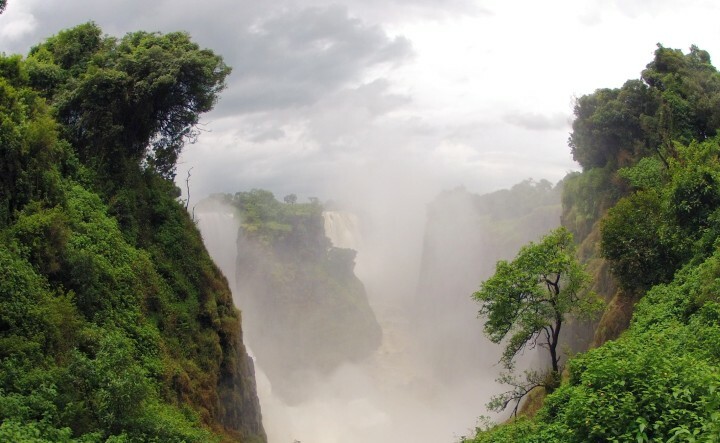 I headed to see the Victoria Falls on a cloudy (but not raining) day. I paid the $30 entrance fee and spent a few hours wandering around the view points taking photos. 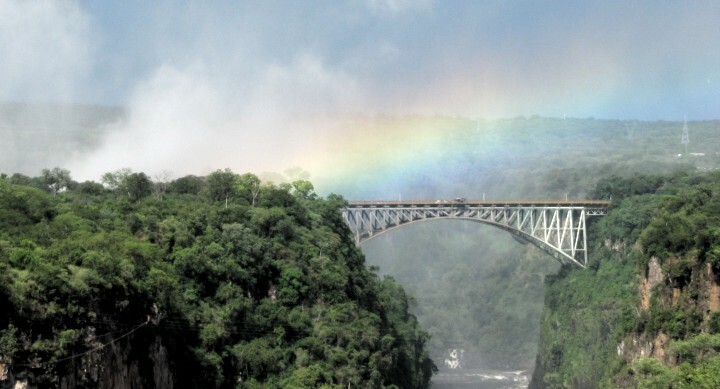 At the end is the Victoria Falls bridge which I will be crossing when I head into Zambia soon. The weather had been really sunny in the mornings here and I'm tempted to visit again (and pay another $30) to see if i can get a better view and some better pictures. 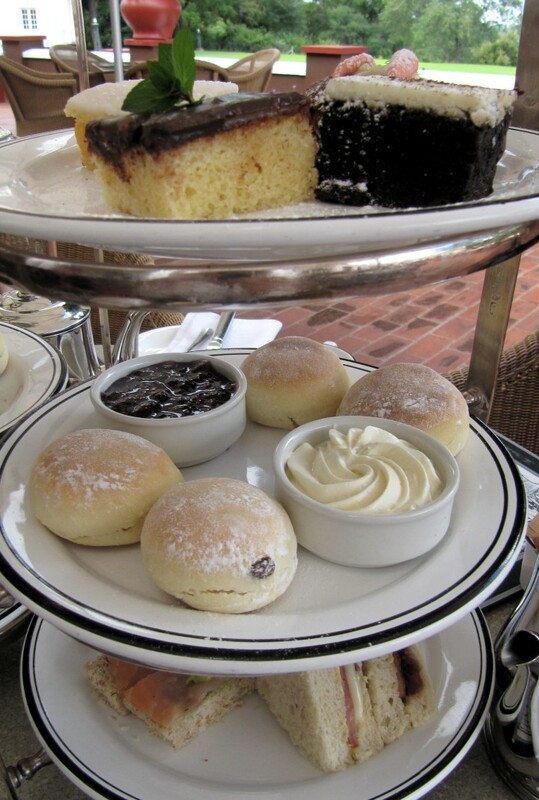 I'm also probably going to head for some "high tea" later at the Victoria Falls hotel. As recommended be several people I headed to the Victoria Falls Hotel for high tea with my friend from Katima, Namibia who was also visiting Vic Falls. We bumped into two Canadians from our hostel who were very early for the high tea (3pm to 5pm by the way) and had been working their way through the cocktail menu for the past couple of hours. The high tea was great and it was amusing watching the cheeky monkeys go for the scones on the neighboring table. There was also a slow but steady stream of different animals that would appear from the side of the building and graze on the lawn. I speculated they kept them in cages round the back and periodically let them out for tourists to photograph. The view was excellent with a rainbow appearing about 4pm and slowly rising above the bridge. We visited the falls again a couple of days later as the sun was shining but it wasn't really worth it. The views weren't any better. If anything they were a little worse. 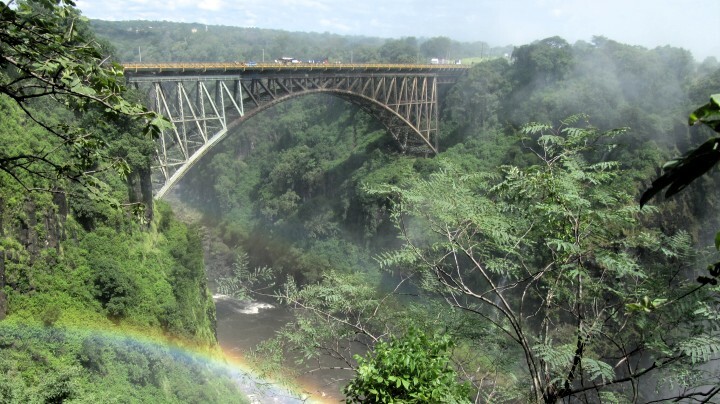 I was getting tired of Victoria Falls town and being offered crappy trinkets and billion dollar Zimbabwean notes so I decided it was time to cross over into Zambia. My 5th Country so far. 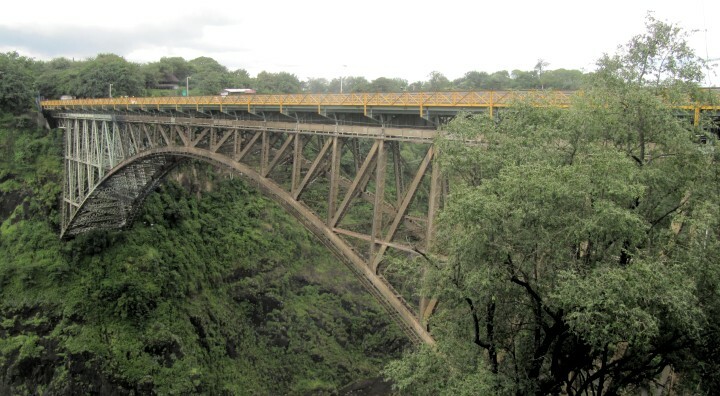 Exiting Zimbabwe was quick and easy and I got to cross the bridge which was cool. The Zambian border post was pretty hectic and as soon as I pulled up I had a few guys hassling me to park here or there but I largely ignored them and parked by the building. Nobody seems to care where you park a motorbike which is good. The Visa was quickly issued and cost me $50 for 30 days (they wouldn't give me 60) then I headed to customs who told me to visit some examiner. I knocked on his door and behind it was a fat man stuffing a huge lump of nshima (maize meal) into his fat face. He was not impressed about having to deal with me so told me to go back and get the woman who sent me. She wasn't interested either so told me to tell him I needed a temporary import permit for the bike. I did this and the guy just stared at me and told me to come back later as he was eating. Fair enough I guess. After about 25 minutes of constantly checking my bike and trying to avoid the "helpers" he came out and inspected my documents. He seemed friendlier now he had filled his fat belly and asked where my South African residency certificate was. Of course I didn't have one although technically I should have had one to have been given my Traffic Registration Number so I just confidently mentioned my SA visa was in my passport and pointed out ownership document. He didn't seem too bothered and issued me my import permit for free. Next I had to pay $20 road toll and 50 Kwacha ($8.30) carbon tax. As I was about to cross through the last gate I was informed I also needed insurance which was purchased from a small building by the gate for 116 Kwacha ($20). Finally I was through! It took about an hour. Not too bad I guess. The guys on the bicycles make the crossing several times a day ferrying orange juice and maize meal across the border to sell for a profit. Some of them seriously load up their bikes. Welcome to Zambia! Except there was no sign to take a picture of the bike next to *Instead there is a commercial advertisement saying welcome which isn't the same. Come on Zambia sort it out! Every other country so far has had one. I headed to Fawlty Towers Backpackers first but this was full so I moved on to Livingstone Backpackers which was only a couple of streets away. The next day was good weather so we headed down to the Zambian side of the falls which was only $20 entrance and better in my opinion*at this time of year. 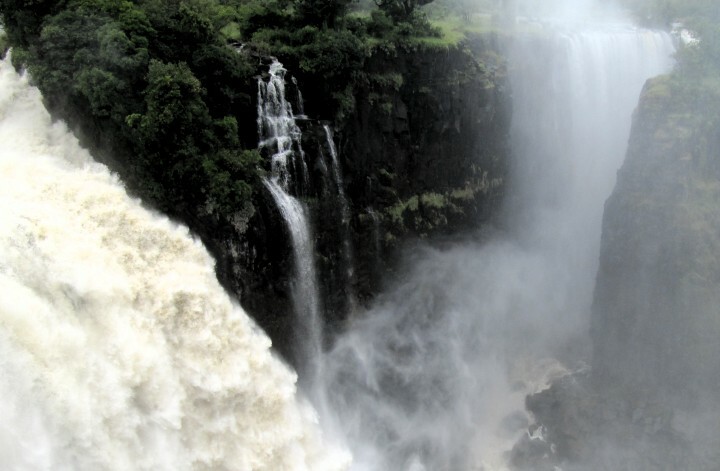 You will get absolutely soaked though as the viewpoints are much closer to the falls. I rented a double layered rain mac and still got soaked. 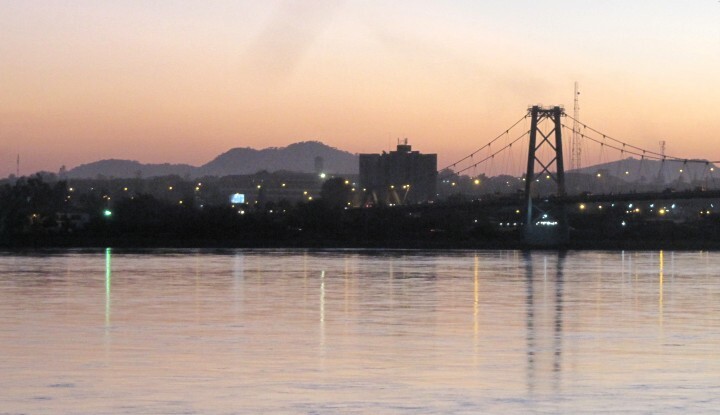 The bridge from the Zambian side. I took my GoPro to try and take some photos but it was difficult with the amount of spray. After my friend left I moved to JollyBoys Backpackers*which has some of the best WiFi I've had since Cape Town. Gives me a good oportunity to backup and pull down some music and videos I've been after. The place is well run and very popular. 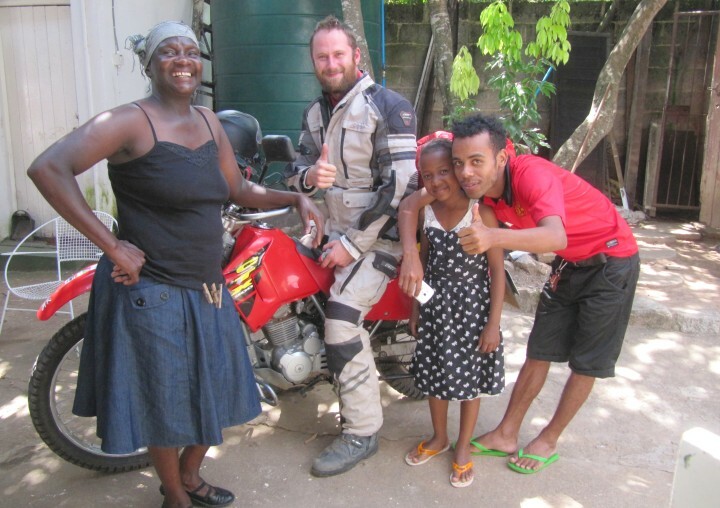 I stayed for 3 nights in the dorm and met Jacob who has driven all the way from Holland on his Africa Twin without a carnet! Impressive. 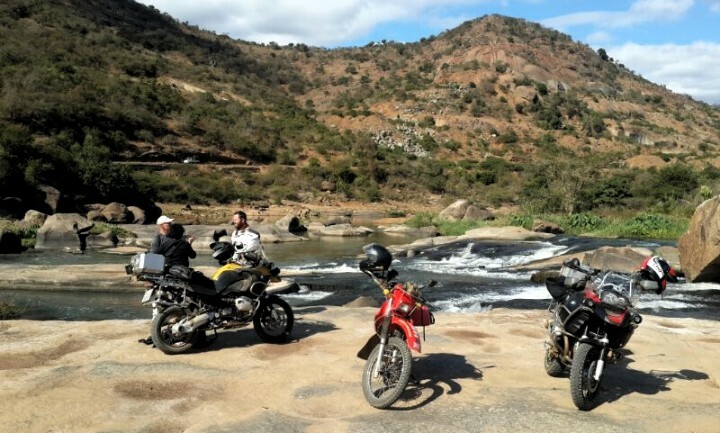 After Jacob left Gill from Belgium turned up on a BMW and we decided to head towards Lusaka together but stopping off on Lake Kariba to break up the ride. The drive was about 280 km's and we set up camp in Sinazongwe at Kariba Lake View for 30 Kwacha a night. The food here is great so we decided to stay for a while and chill. On one of the days we decided to explore some of the area. We ate nshima and beans (10 Kwacha) in a town just outside Sinazongwe and chatted to some locals until the inevitable drunk turns up asking for money because he's hungry. These guys really do my head in. You have a nice chat and a laugh with some friendly locals and then we leave early after the drunk won't stop hassling us for booze money. To be fair the guys we were chatting with did have a word with him. We headed to the lakes edge after following some bad roads but decided not to go any further as the scenery isn't that spectacular and the roads were pretty bad. We came across these fishing vessels. So tomorrow we head to Lusaka to try and get out Malawian visa's as we have heard its cheaper to do in Lusaka than on the border. 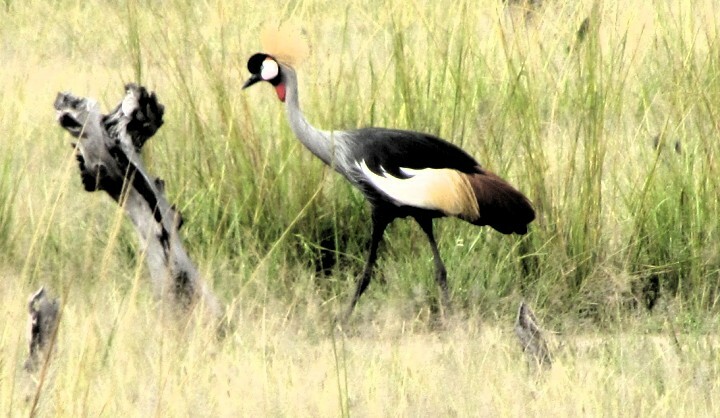 Gill will head south into Zimbabwe and I will continue north east and possibly visit South Luangwa national park and try and do a game drive and see some animals. 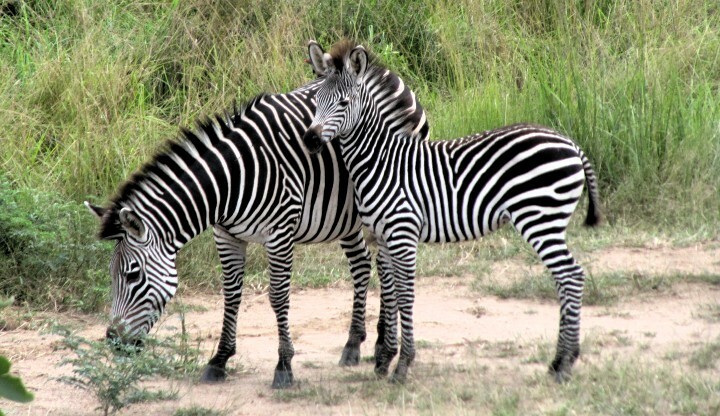 I've heard Zambia has some of the best safaris. I'm not too sure after that. Probably work my way towards Malawi and cross the border in the north somewhere. KM's travelled so far 17,000. Looks like you're having a blast. Enjoy the ride! 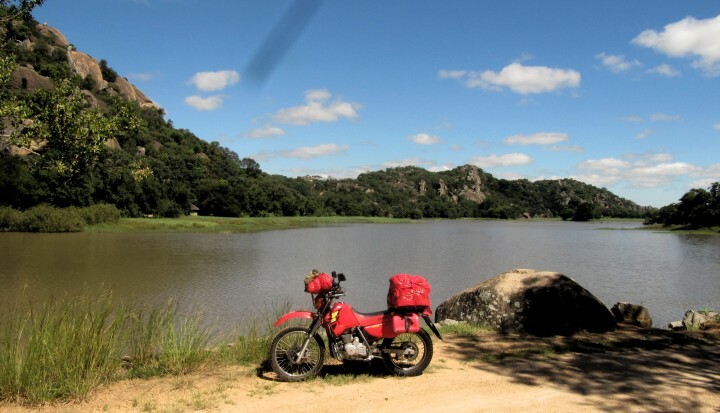 I lived in Lusaka for years and rode around Zambia quite a bit, mostly to the East and Malawi. Lots has changed since then probably (10 years have passed) but I thought I'd just put in my two bits. 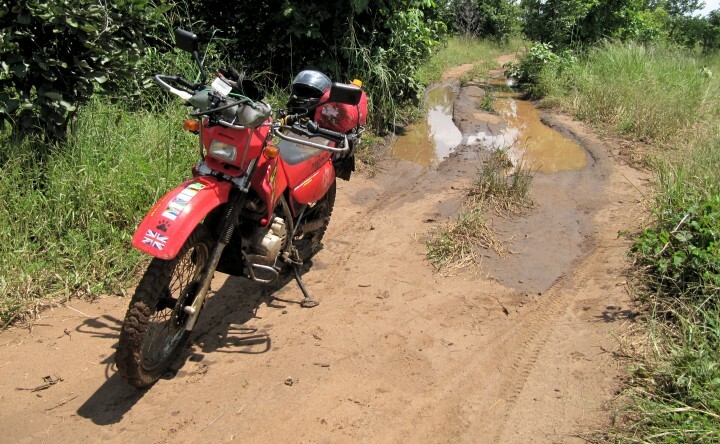 Look into whether its possible to ride from Petauke to Mfue on the back roads. 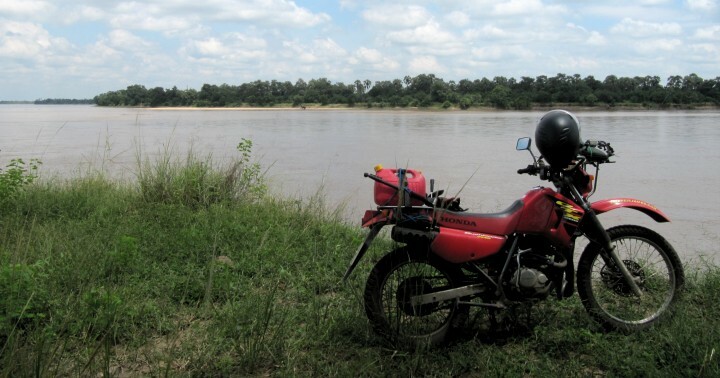 Not sure it is because you're on a bike and it takes you into the S. Luangwa Nat. Park, but if you can do it it would be a trip. 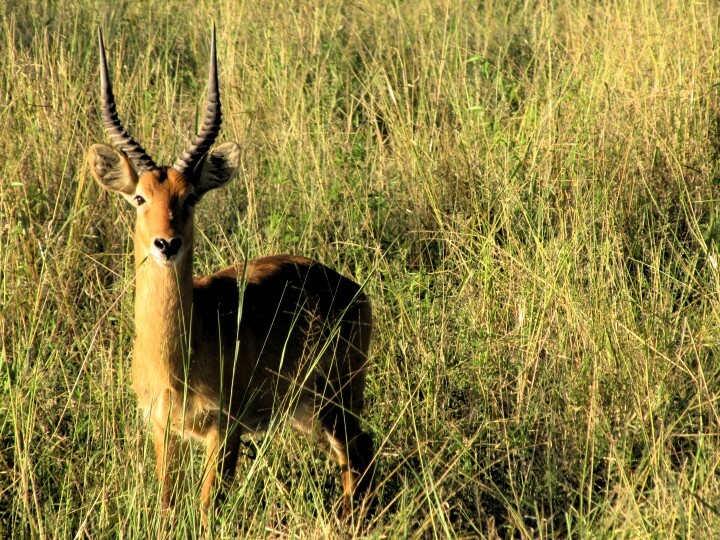 If you do want a good safari, S. Luangwa is very lovely. 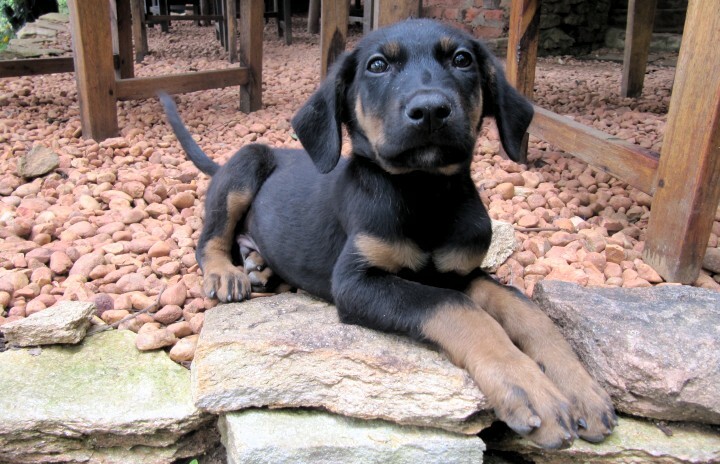 You can camp at FlatDogs. 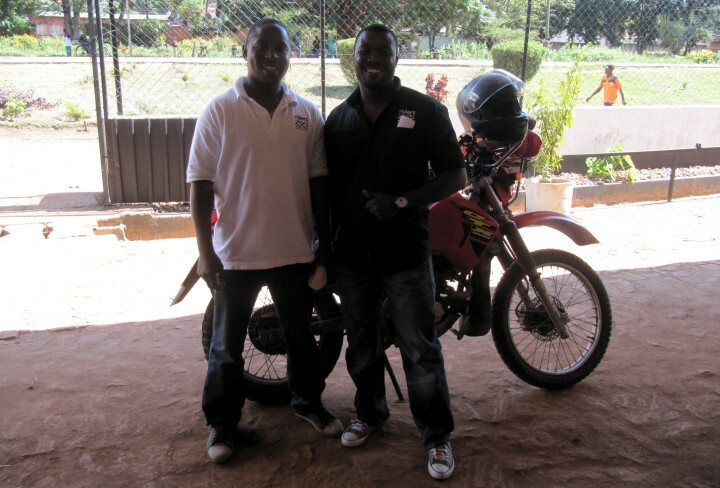 If you need to stay in Chipata, try to find the backpackers run by Nsamwa and Steve. It's new since I was there, but they're good folks and friendly. I'll try to find contact info. 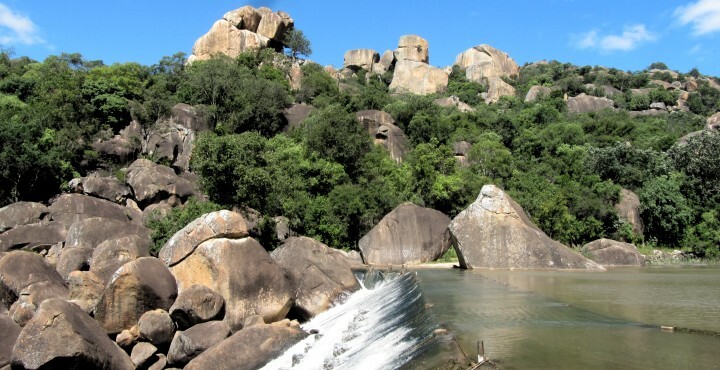 In Malawi there are many lovely spots and places to visit. If you have time to head south, Cape Maclear on the Lake was always a lovely place to unwind and have a few Greens. 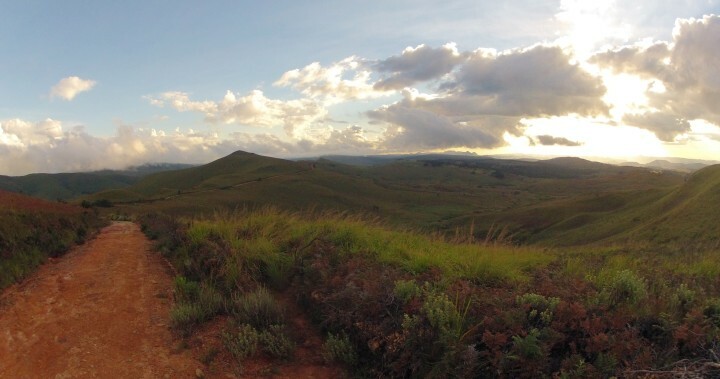 If you want something different, you can ride your bike up on Nyika Plateau among zebras and antelope. You can camp rough and eat at a restaurant there. 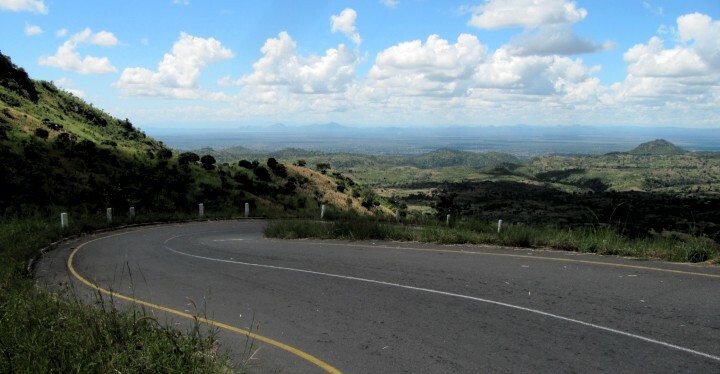 The whole north stretch to TZ is lovely, up to Livingstonia etc. 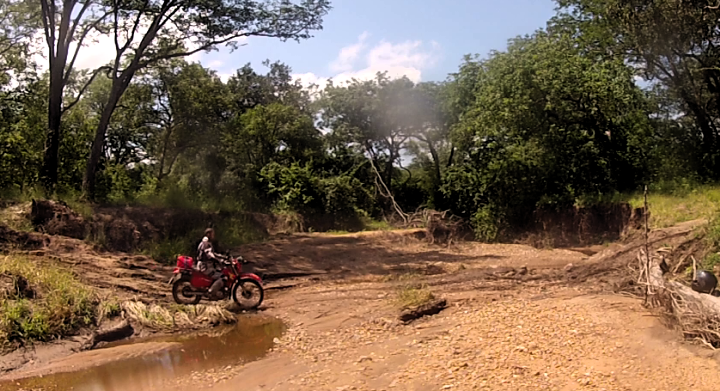 Now for TZ, where I've been for the last 5 years (see the multitude of ride reports I've written), we have a lot of off-road tracks on GPS I'd be happy to share. If you have space, I could just dump them all on you (they're unorganised) or if you know where you want to ride I could try to clip out the bits that are relevant. PM me. Hey Osadabwa :) I certainly am, thanks reading my report and taking the time to write me a message! Your route idea sounds great. 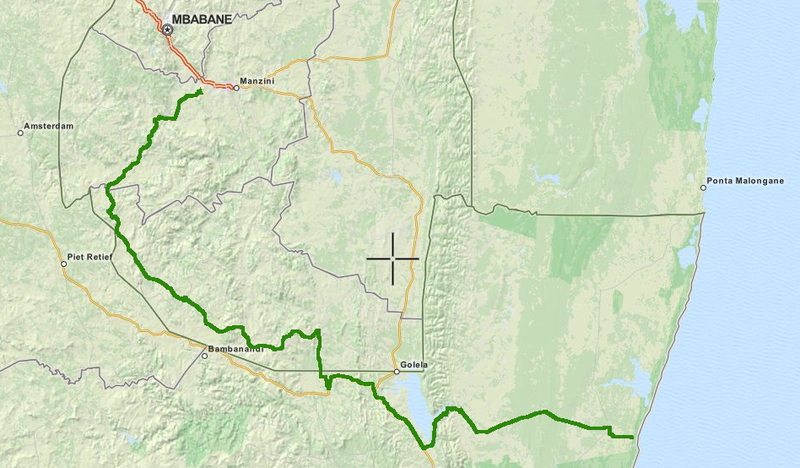 I'm going to drive from Lusaka to Petauke tomorrow (407 km's). Then I'm going to see if its possible to take the back roads like you suggest. I may call flatdogs to see what they advise. Looking at the flatdogs website I'm not sure they allow independent camping any more. Perhaps they have gone more up market. 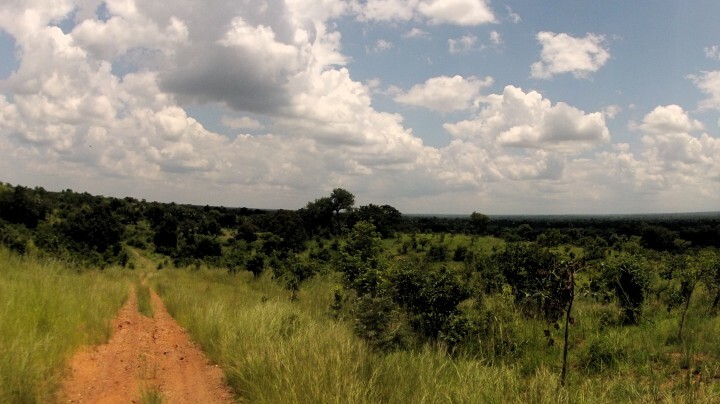 There are plenty of camp sites around Mfuwe so will stay around there and do some safari's and see some wildlife. 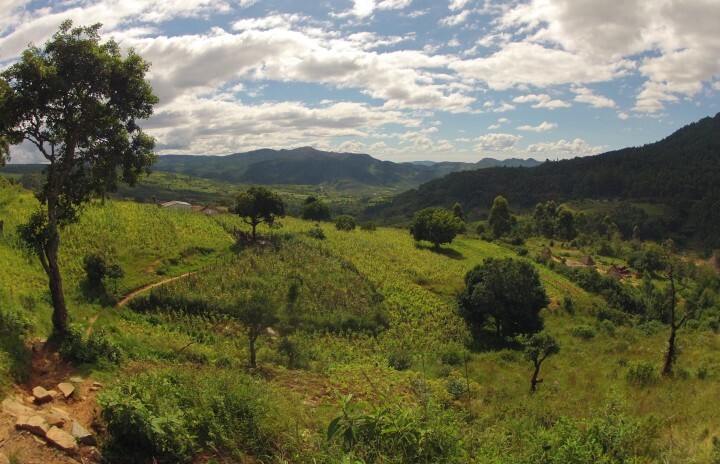 I am looking forward to Malawi. Everyone keeps telling me how great it so lets see :) Unfortunately I'm going to miss out on Tanzania this trip as I'm a very slow traveler and I don't want to rush it. I will come back at some point I'm sure so thanks for the offer of GPS traces I may well contact you when a future trip happens. The drive to Lusaka was about 320 km's but we were low on Kwatcha as our bill of T Bone steaks and camping had cleaned us both out. The ATM's were also conspiring against us. For some reason only Barclays banks work with my Mastercard and the ones I tried were out of service. I was also low on fuel but I found a petrol attendant who would give me a fair rate in dollars for some fuel and gave me change in Kwatcha. Result! I bought Gill and I some Nishima, vegetables and tea for lunch. We were pretty hungry. After arriving in Lusaka Gill and I checked in at Paseli 7 Backpackers*which seemed like the best backpackers in town according to trip adviser. The next morning Gill and I visited both the Malawi and Mozambique embassies to inquire about visa's. Both told us that yes we would need to apply for them but they would take 3-5 days unless you pay a premium so we decided it wasn't worth it and we would get them on the border. I have now learned you don't even need one for Malawi if you are European despite them advising us you did! 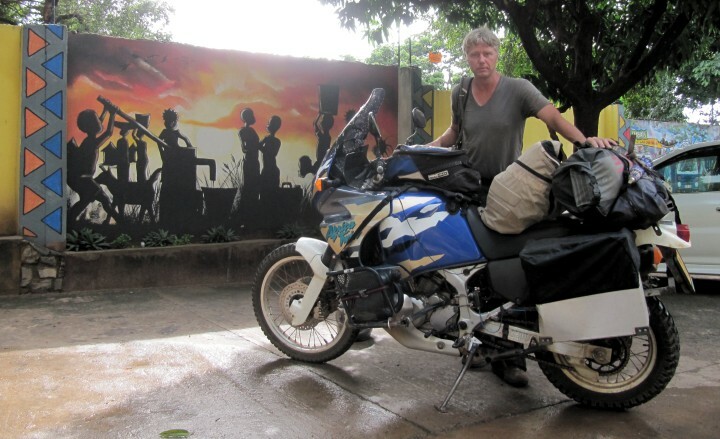 Gill left for Harare, Zimbabwe intending to stop for a quick look at the Kariba Dam on the way. 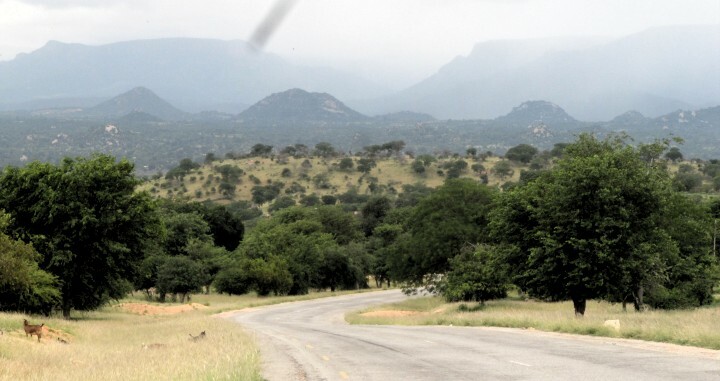 I headed towards*South Luangwa National Park. 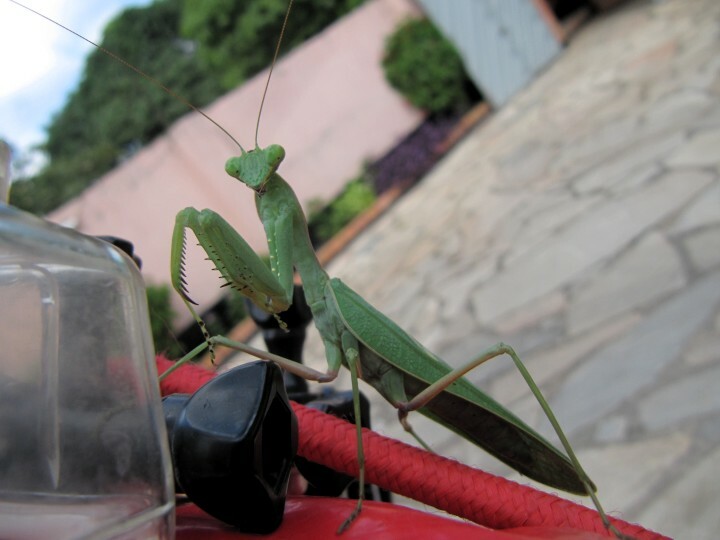 As I got ready to leave I noticed this praying mantis on my luggage. I guess he was headed that way too. 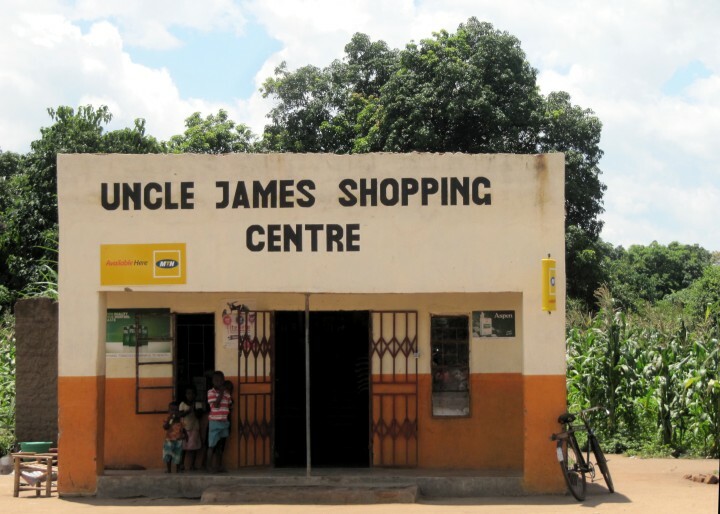 I had a long drive ahead (407 km's) and wanted to get away early but I got a text from my local mobile provider MTN informing me they were going to cancel my SIM unless i registered with them so I stopped off at the local shop to sort it out. It took about 45 minutes which I could really have done without but seeing as I was late I also decided to pop into the Game store and replace my 10 Liter fuel can too. It had been leaking slowly for the past month after a thorn somehow penetrated the plastic. I had tried to repair it many times but it always leaked again after a few days. I gave the old one to a random guy on a bicycle who seemed very pleased despite it being broken. I guess he will repair it properly and perhaps get something for it. I finally got going and expected to have a fuel stop or two on the way but there was none and I was running low so I stopped and asked a lady called Doris who was waiting for a lift to Lusaka. This family provided me with 5 liters for 75 Kwatcha (normal price 50) and I was on my way again. I should really have bought 10 liters as I had to pay 85 for another 5 a bit further on. I was still expecting a fuel stop but there wasn't any. This is the first time I've had any difficulty getting any fuel from petrol stations (or lack of). From now on I am keeping my main tank and extra can full. I also ate some Nshima and fish for 12 Kwatcha (2 USD) in a small restaurant by the side of the road much to the curiosity of the locals especially as I was eating local style with just my hand. Heading off again I crossed this bridge and was going to stop and make a little drive by video on the GoPro when I had 7-8 children descend on me demanding pens. Instead I just pointed at my ignition switch on the bike and one of the kids tentatively pressed the button and the bike fired up. They loved it. Kids get a real kick out of it when I let them start the bike. I eventually made it to Petauke which is the half way point between Lusaka and Mfuwe (the entrance to South Luangwa National Park). 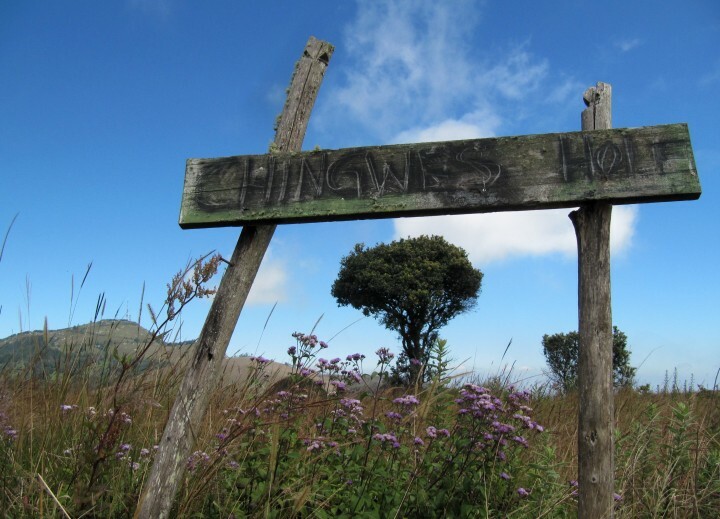 It had just begun to rain so I headed into the first lodge I found which was Chimwemwe Lodge. It's a very well looked after place. Rooms were 300 Kwatcha and I was tempted but decided to go for camping priced at 50 Kwatcha. I waited for the rain to slow and headed to the campsite and unloaded my stuff into the abolution facilities. Whilst I was waiting for it to stop raining again it started to get dark so I decided I would just sleep on the floor in there. 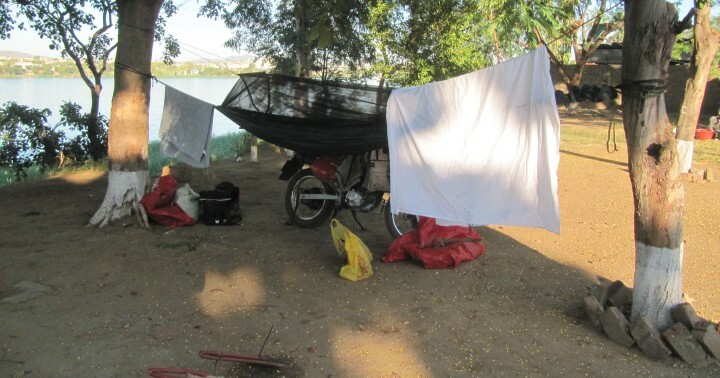 It wasn't the best night's sleep to be honest as I was constantly bothered by mosquitoes but I got some rest. The next morning I ate some bran flakes and used one of my 250 ml long life milk cartons. These things are essential when you are on the road and want milk but don't have refrigeration. I always carry two or three. Great for tea too. The road was pretty good and started become more hilly as I proceeded east. how popular cycling is in Zambia. Arriving in Chapati I filled up my tanks again but the pump broke mid way through so I had to wait until they could get it working again so I could pay. Bit of a pain especially as I attracted the attention of a beggar who kept hassling me for 2 Kwatcha which I always refuse politely (I never give to beggars, ever). He became quite angry and kept pointing at my Honda and then mumbled about how angry I was making him and how he was going to get a gun and shoot me. Crazy guy. The petrol attendant had a word and he soon left mumbling to himself. I had lunch at a Steers branch in town and headed north towards Mfuwe. The road was excellent and had recently been tarred except for a few small stretches. Getting close to the national park entrance where I intended to camp I drove over a hill with a nice view of the land below. I was driving through some small villages about 10 km's from the park entrance when I came across a road block which seemed quite suspicious. There were no police, just a gang of about 20 young men and boys who flagged me down and immediately surrounded me. There was one guy who was sweating profusely and standing right in front of me with a machete in his hand trying to look mean. One of the boys explained there had recently been an accident and they wanted money. I argued that the accident was nothing to do with me but they insisted I needed to pay something. Next a car just drove straight past the road block and I questioned why they were allowed to pass. They told me they had already paid 5 Kwatcha (less than 1 USD). As it was less than a dollar I decided to just pay them rather than risk getting hit with a machete. They were really happy with their money and let me pass. I went fo Flatdogs camp first but they don't offer camping anymore so they sent me to Croc Valley Camp a couple of kilometers away. This time of year their camping costs 72 Kwatcha after they add VAT and their 10% service charge. 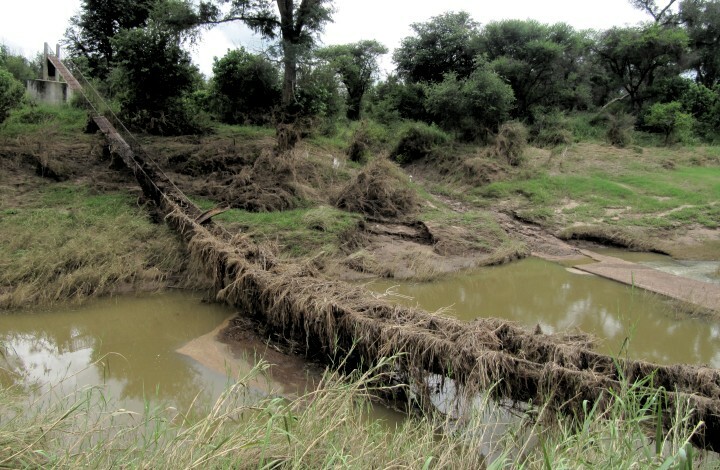 I set up my hammock under the rondaval overlooking the hippo and crocodile infested luangwa river. I had a bench for all my stuff, power outlet and even room to park the bike. Perfect! After some tea and cakes we headed out in a smaller group of 3. Myself and two Swedish backpackers. 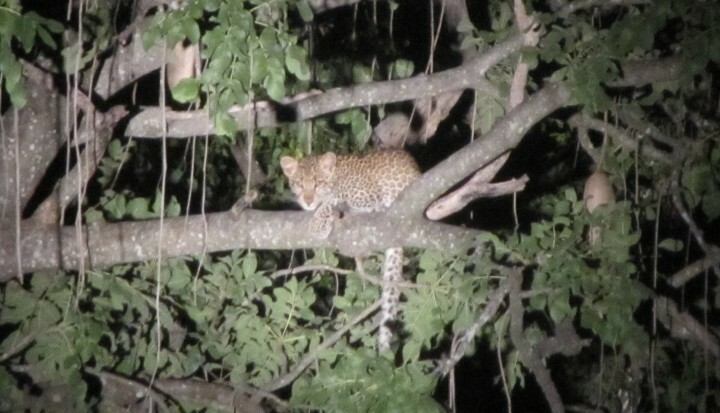 Withing 30 minutes we spotted a Leopard on the road. He was marking his territory as he progressed towards us. He passed right next to our vehicle. We followed him to a clearing and watched him survey the open grass lands for about 20 minutes uninterrupted. Then he moved on towards a herd of Impalas. Eventually a second vehicle (full of the most deadly predators of them all) turned up to disturb the peace. 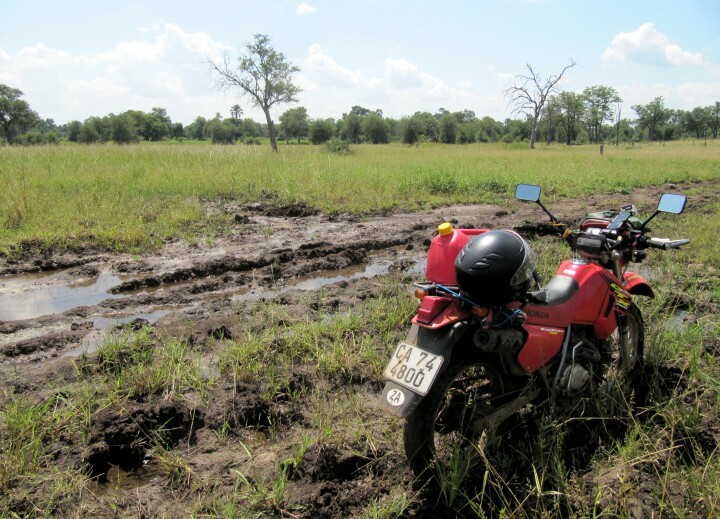 I decided to use the next day to explore the old petauke road which I was tempted to take instead of coming from Petauke via Chipata on the tar road. I was quite glad I didn't as the 40 or so kilometers I saw was pretty washed out and would have been tough with all my luggage. 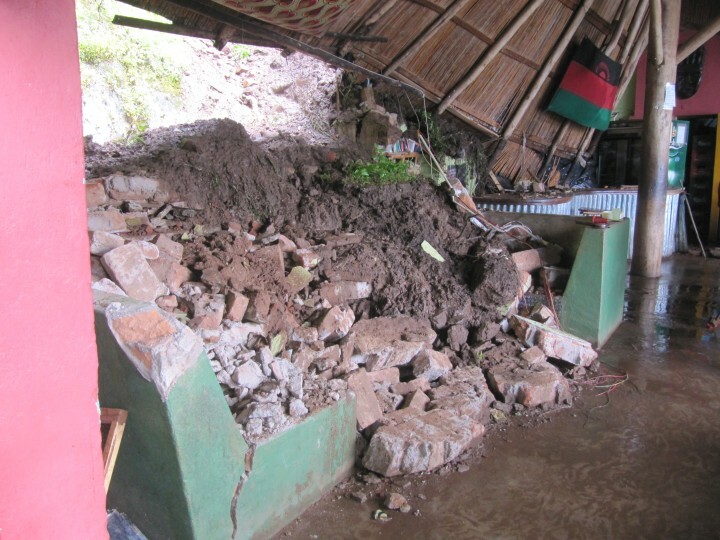 As you can see a lot of the bridges were washed away. The old petauke road follows the river and has some excellent views. I spotted these two elephants on the other side. There were plenty of interesting tracks on the way too. After driving about 40 km's I decided to turn back as I was considering a second night drive. I was also told by some locals that the next 40 or so km's was just boring bush driving with the possibility of angry elephants. 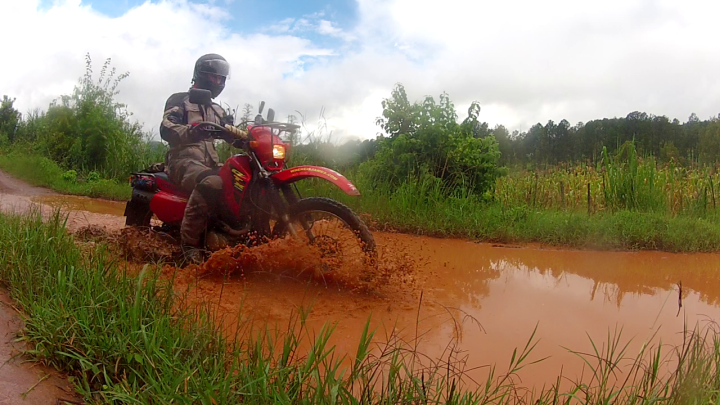 I managed to fall off into this mud puddle by spending too much time looking out for elephants instead of keeping my eye on the road. Apart from a few patches the road really isn't too bad and rises up every now and again to give excellent views of the park. 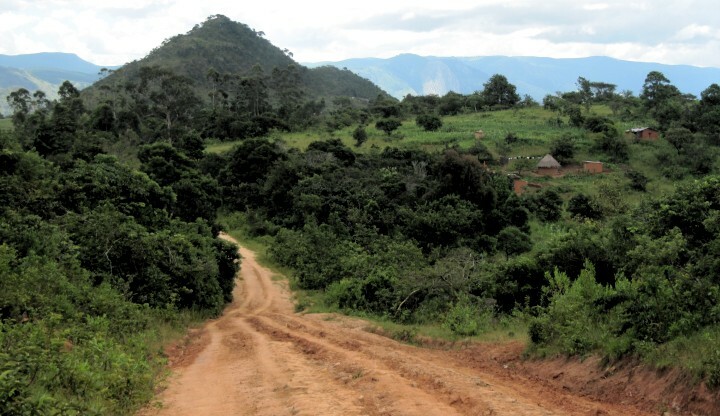 The road was really fun to drive and I imagine being able to travel the whole length in the dry season is awesome. 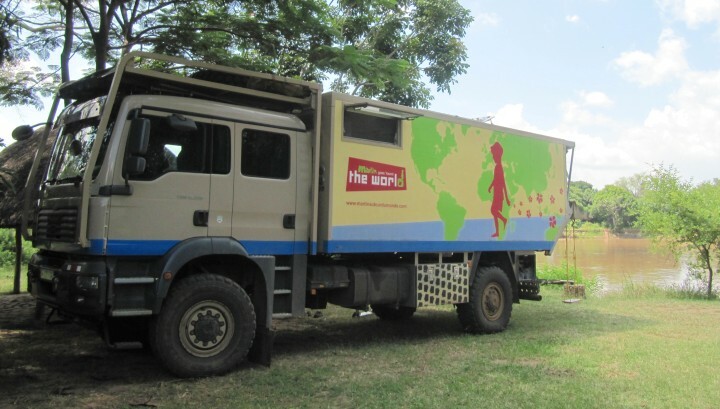 Just before we were about to head back we heard from another truck that there were lions ahead! 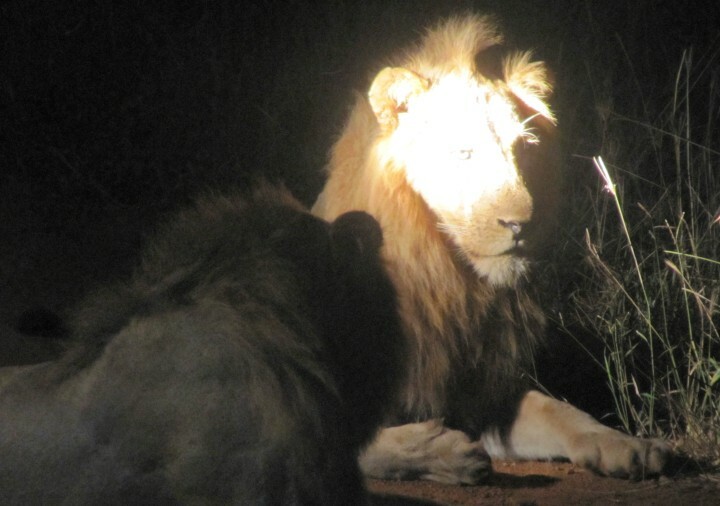 A herd of about 15 were on the road and finally I got to see a wild lion. This is the best picture I took as inevitably the batteries run out on my camera. hmm! bit annoying but still impressive to see. They were so close to us. I got within meters of this male as we drove past. Today I cross the border and head to Lilongwe, Malawi. 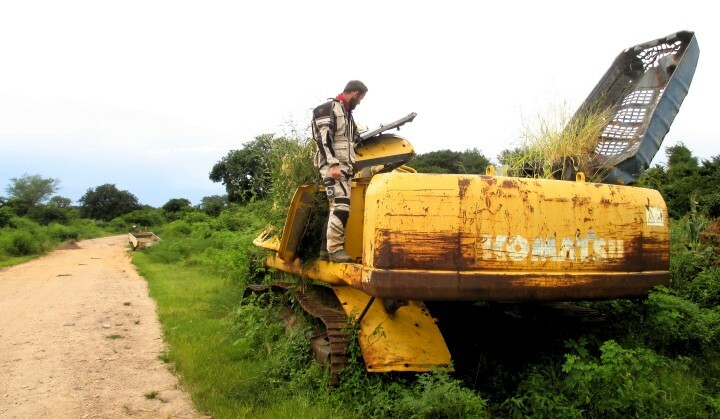 Checking out nature reclaiming this digger near Sinazongwe. 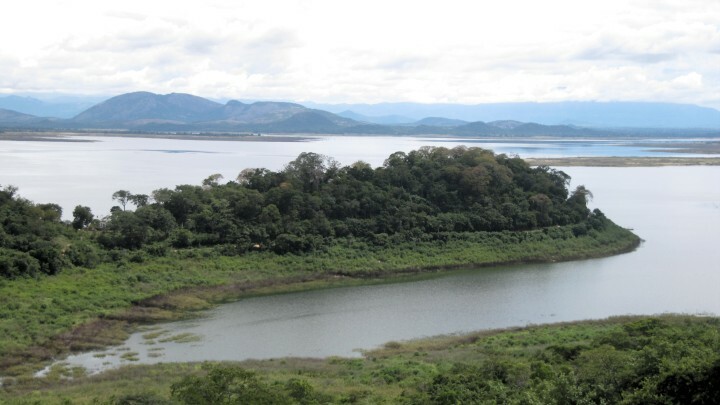 Our camp by Lake Kariba. You can see my foot poking out from the hammock. Enjoying some "Africa TV" with fellow traveler friends in Lusaka. 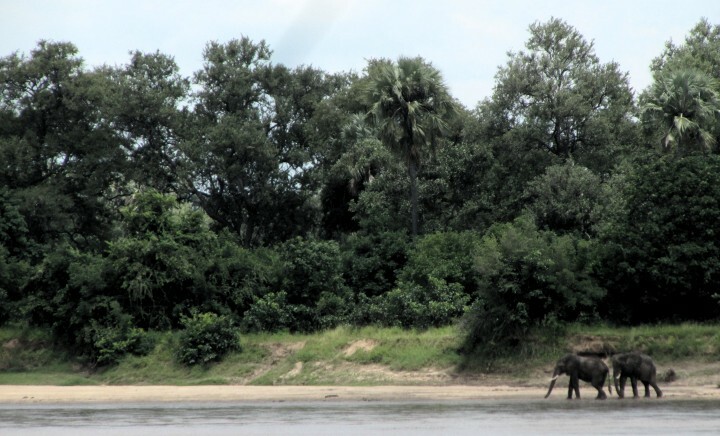 Glad South Luangwa didn't disappoint. 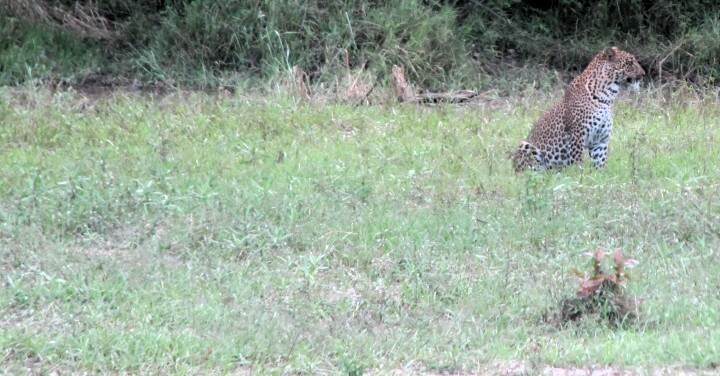 That's the place I've most consistently seen leopards, and it's lovely to go on a game drive in a riverine environment. Very annoyed about the guys with the panga hustling you for Kwacha. Next time, a boot to the head with those buggars... (easy to say, sitting at home... tough to accomplish solo on 2 wheels!) 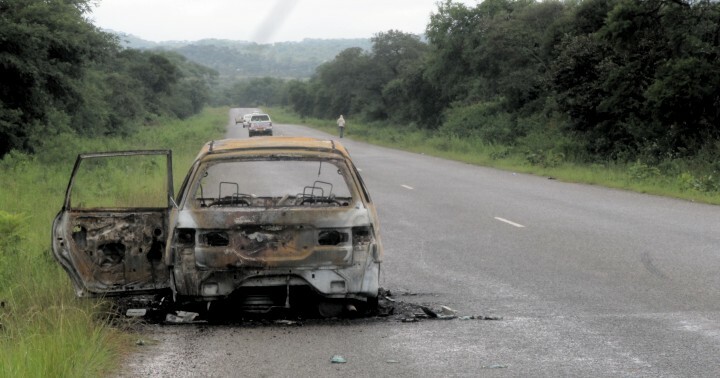 Zambia's gotten a bit rough around the edges it would seem. I'm feeling sheepish for not warning you about the fuel situation too, but what the hell, you don't need petrol from a pump anyway! 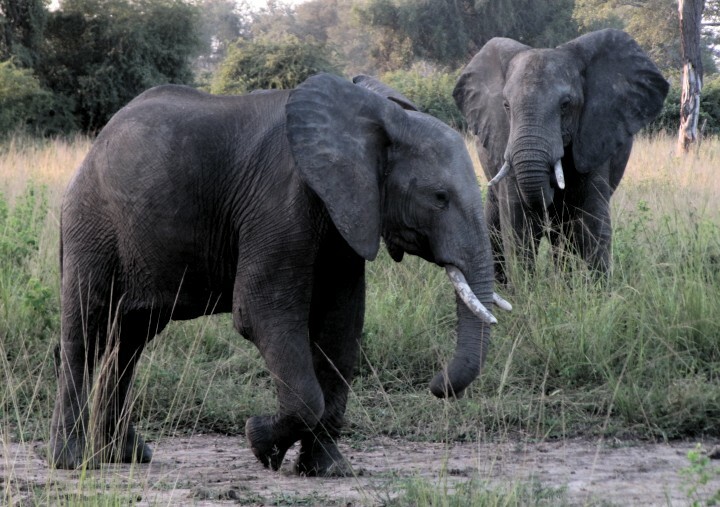 I feel future game drives won't match up to South Luangwa. I do still need to see a Rhino before I've seen the big 5. I saw one in Nepal before but not Africa. 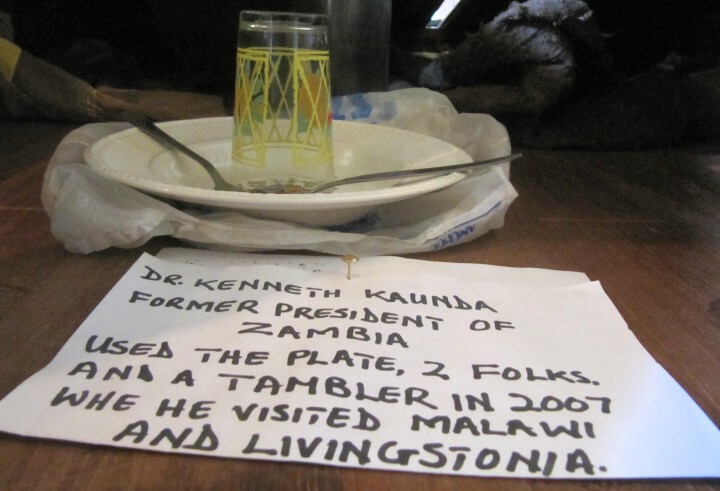 Its so random and not indicative of Zambia at all. Just one of those random things on the road. Makes for a good story though! Just wish I had turned on my GoPro and caught it all on film. Don't worry about the fuel situation. It made for some very nice encounters with locals sourcing the black market stuff. :) Thanks again for the advise. I really appreciate it! 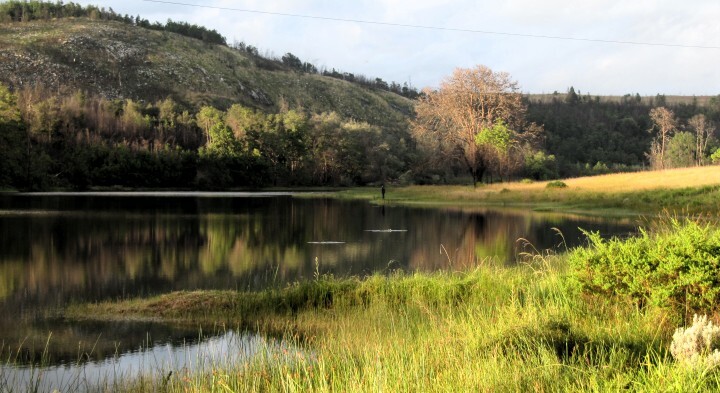 Here's a picture of my camp at croc valley just before packing up. I really like it when there is a thatched area I can just string my hammock under. All the better if it has power, water and a bench like here. I forgot to mention in my last report but whilst I was on the old petauke road I hit a rock which pinged off one of my side sand springs into the bush. 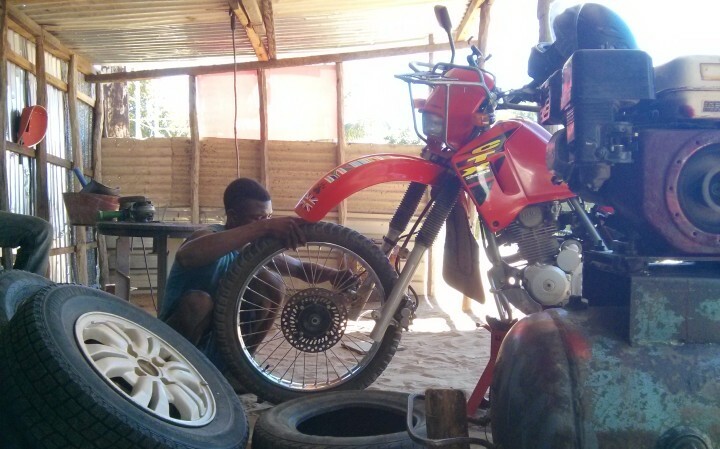 I spotted a workshop in Chipata run by an organisation called riders.org so I popped in to see if they could help. One of these two gentlemen sourced me a new one in 20 minutes flat and even installed it all for 15 kwatcha. Very nice guys indeed! I also forgot to mention that whilst on the old petauke road I met a retired British policeman called Steve who was off to collect his canoe. He said to pop by his place on my way back for a beer which I did. 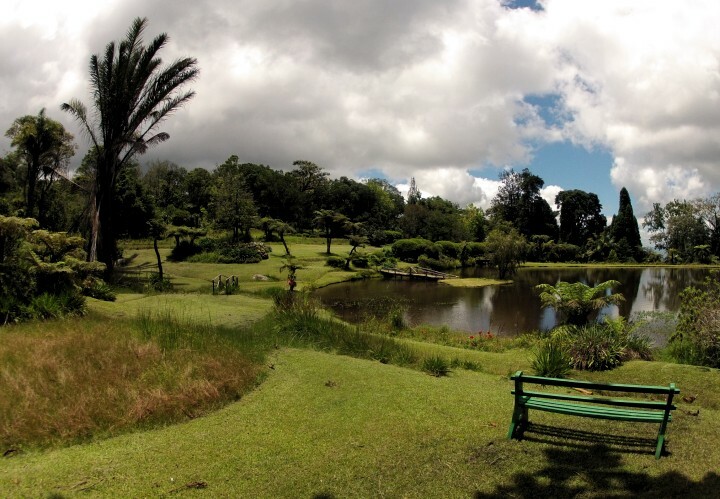 He and his wife Anna run a Wildlife Education Trust called Chipembele just off old petauke road. Steve showed me round their impressive place which includes a pet Hippo called Douglas, a rescue monkey called Doreen and a few other animals. 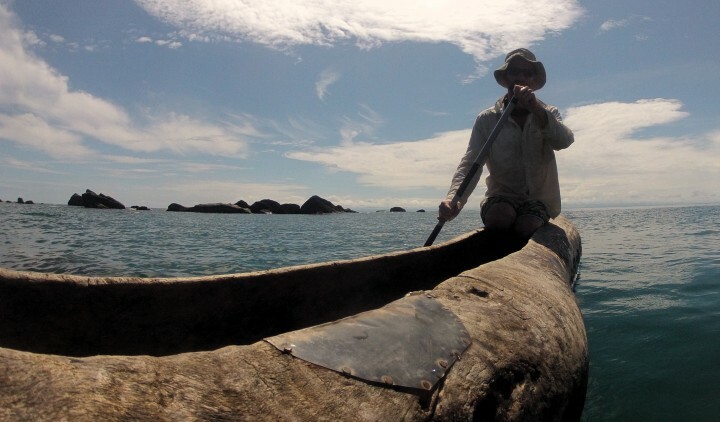 Steve also showed me his canoe which had a hole in it. 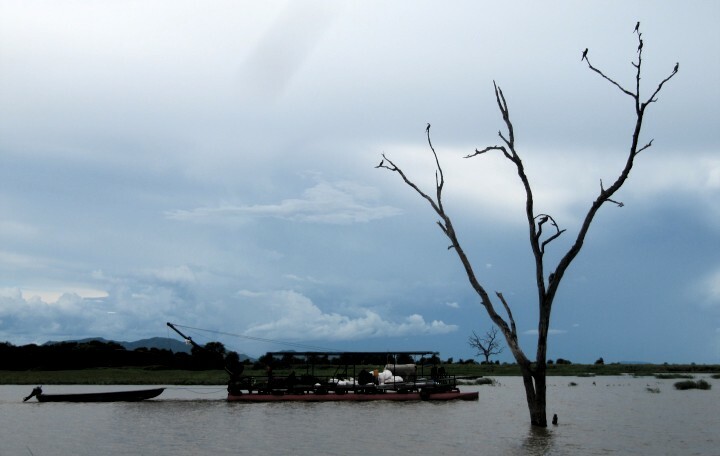 He explained he was on a 12 day trip along the upper luangwa river when all of a sudden a crocodile grabbed the back of his canoe and tried to shake him out. Steve then said everything went in slow motion as he lent forward, grabbed his hand gun and turned around to fire two warning shots in to the water. The crocodile then slid back into the river. Pretty scary stuff. He said another canoeist had a similar experience but without a gun and he abandoned his trip soon after. I imagine the constant worry of capsizing it pretty nerve wrecking. Anyway, after having my spring fixed and grabbing a burger in the Chipata Spurs I headed to the border to cross into Malawi. On the way I passed the usual queue of trucks parked up waiting to cross in. The crossing went pretty smooth and took about an hour. Nobody was in a hurry and I got my first taste of the Malawian's laid back nature. The visa was free and as usual the Temporary permit was free. I did have to pay 5000 MWK (about 11 USD) road fee. 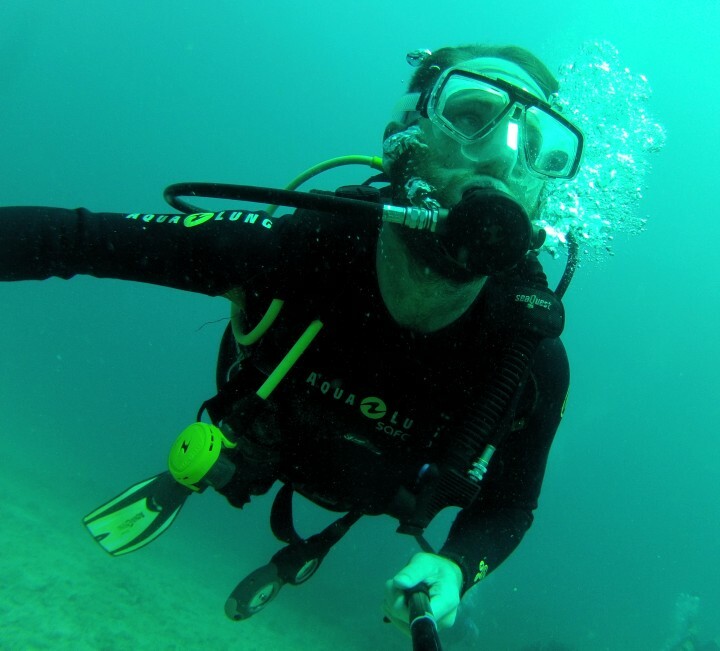 I also had to buy insurance for 30 days which was available 100 meters down the road and cost about 8 USD. Pretty cheap crossing all in all! It rained heavily whilst I was sorting everything out but fortunately stopped on my way out. Below is a picture of the river coming down the road. 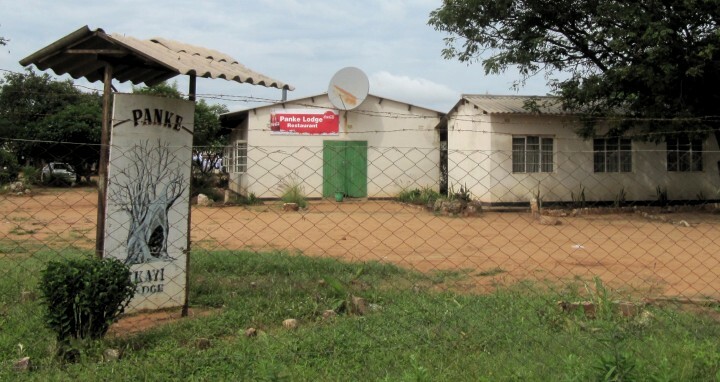 I set off for Lilongwe and took a dorm bed at Mabuya Camp*for $10 per night. I bought some supplies from the local supermarkets and filled both my tanks with petrol as I wasn't sure how many stations I would find here in Malawi. I also picked up an extra 1.5 liters of oil from the Game store and changed my oil that night. The next morning I headed to an Indian barbers for a much needed haircut and shave. It was the full works including head message and cut throat razor. In my experience having haircuts and shaves around the world the Indians always do the best job. 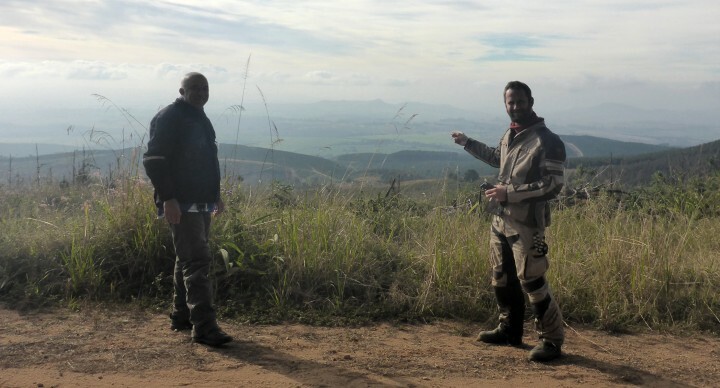 Later that day two Italian bikers called Andrea and Umberto turned up at*Mabuya. They had*driven down from Italy. Nice guys! 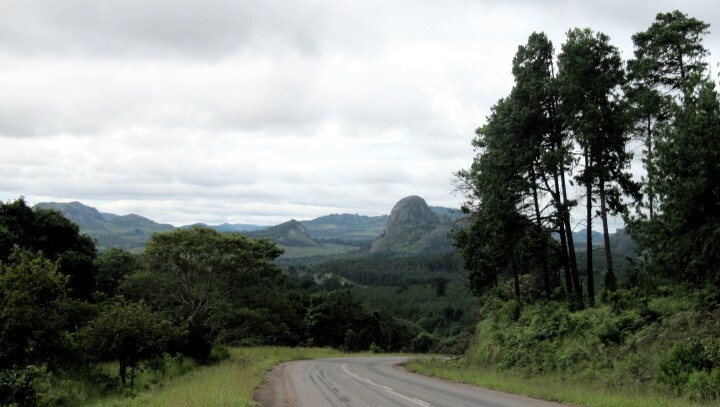 Not wanting to dwell too long in he capital I headed north to Mzuzu along the hill roads and was very glad I had the extra fuel as the only pump on the way was broken. 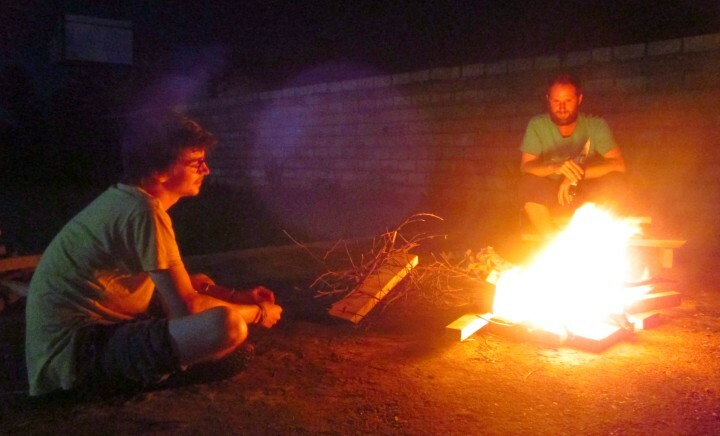 I spent the night at the*MzooZooZoo*which to be honest is in dire need of renovation but the people made up for it with interesting conversation that night by the fire. Not wanting to waste time I topped up my fuel and headed north again the next day. 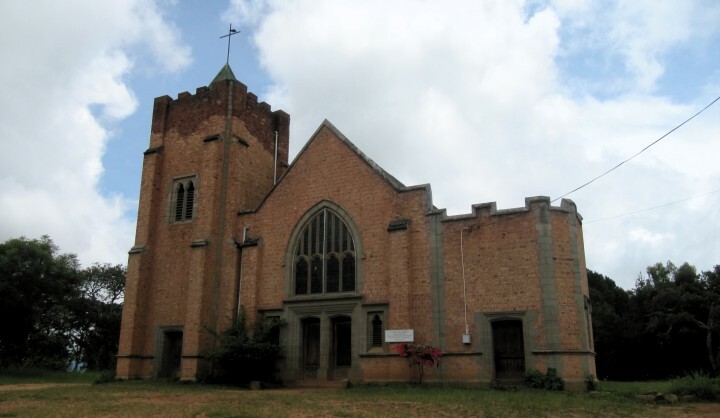 I drove straight past the turning to Livingstonia the first time. Considering it's a fairly famous town I didn't expect the turn off to look like this. 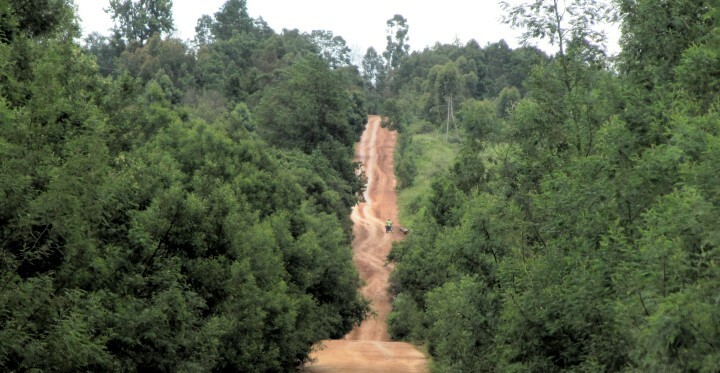 The ascent is about 15 bends like this which is great fun on the bike. 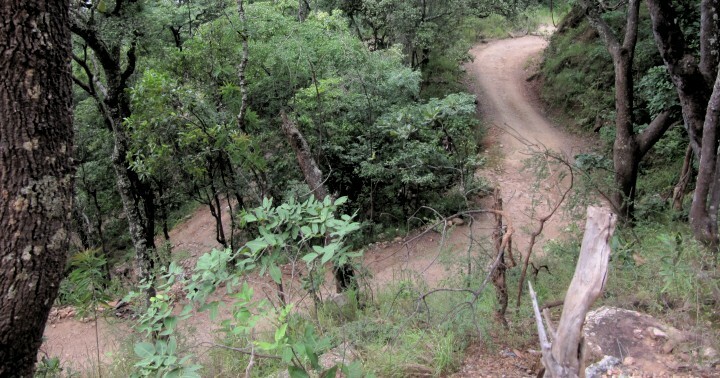 Most of the road is gravel but some of the steeper corners have been sealed. 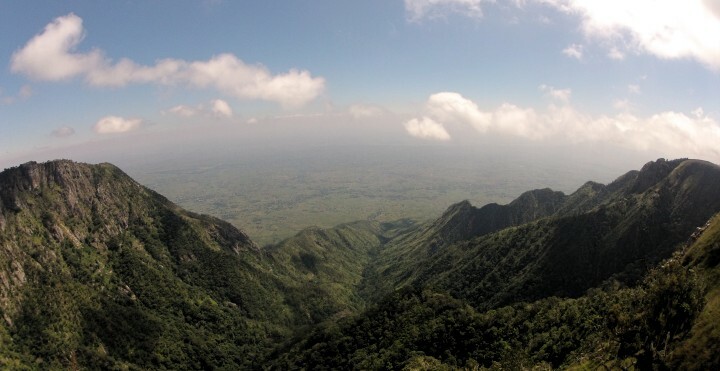 The next morning I headed up into Livingstonia itself. 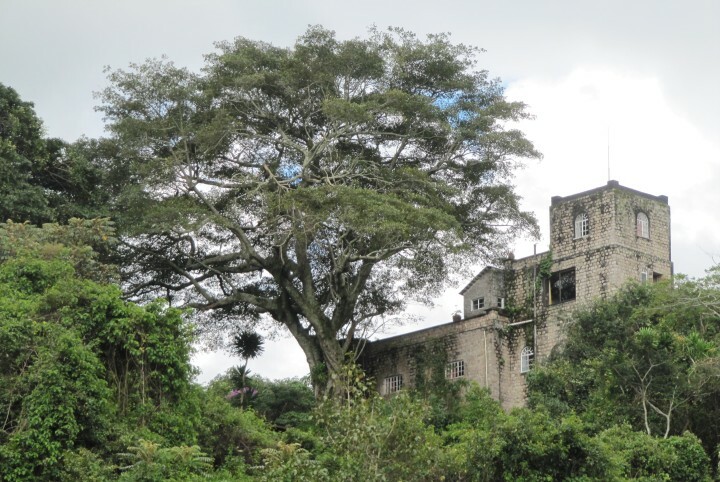 Its a very strange to see all these old colonial buildings so far from civilisation. I grabbed a tea from the local coffee shop and chatted a bit with the very friendly locals. Here's the very quiet town center. Next I headed into the Stonehouse Museum which is probably the smallest museum I have visited on my trip so far. Entry was 500 MWK with a 200 MWK supplement for photos. Here's the pretty impressive church. I can't imagine how hard it was to build all this in such a remote place. Quite a drop too when you stand above it. I didn't want to get too close especially with the drunk kid nearby. I was a bit disappointed with my young drunk guide but paid him anyway and decided to visit the cave behind the falls with a group of 5 boys who spoke much better English and weren't drunk. We had some interesting conversation about BK (Bible Knowledge). They were quite surprised when I told them of that Christianity wasn't as popular in Europe as it was here in Africa. I then tried to explain why I believed in evolution rather than creationism. To be fair they listened and seemed interested enough. I do find it a bit ironic that after all the missionary work done by Europeans in Africa in the past that we no longer believe so much any more. 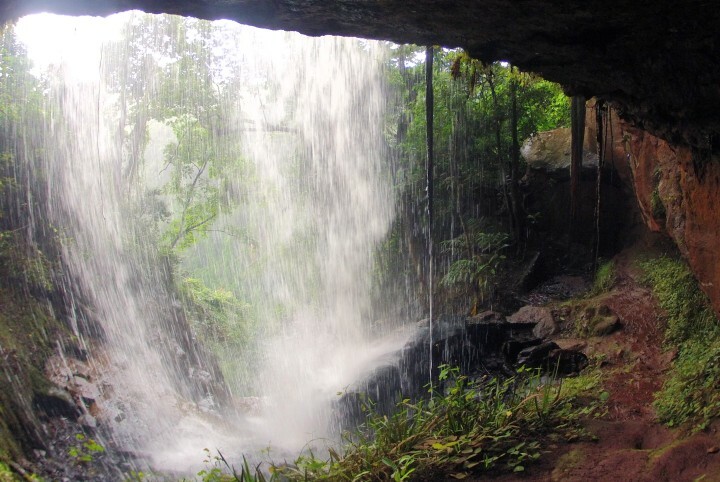 Here is the cave behind the waterfall. Apparently the locals used to hide here from the slavers when they came to town. I paid the boys 100 MWK each for their time which worked out at about 1 USD in total for all 5. It had been raining a little and on my return to the bike the local drunk who had recommended the drunk kid had covered my bike in plastic. He was demanding 200 MWK for guarding my bike. I was not impressed as I had told him when I left that my bike didn't need looking after. We had a "debate" for about 15 minutes which attracted a few locals who were curious what the muzungu was up to. I offered him 50 MWK which to be honest was more of an insult than anything. Of course he didn't accept it. I made a few digs that while he's out drinking his sachets all day I was working hard back in the UK to afford this trip and I'm not going to waste my money having my bike guarded by drunks. In the end I just left giving him nothing with most of the locals laughing at the drunk who made an empty threat that we would "meet again". meh, whatever. I don't like confrontations like this but after a while you get tired of it all and decide to stick to your principles and argue it through. In all honesty though its not worth the hassle and headache for 200 MWK (less than half a dollar). 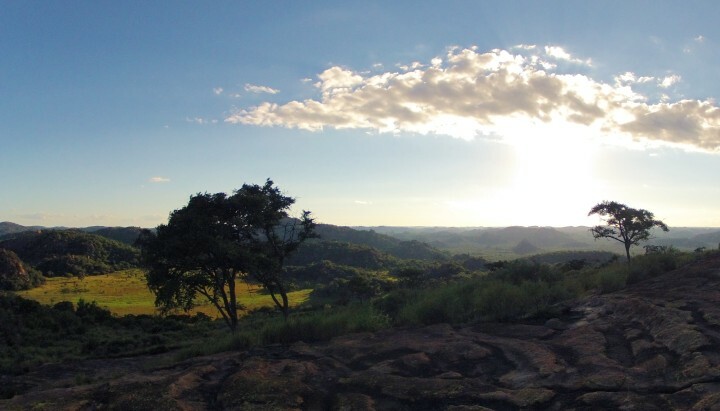 On my way back to Mzuzu I took this panoramic on my phone. It's a beautiful drive with the smell of the tobacco fields as you drive by. 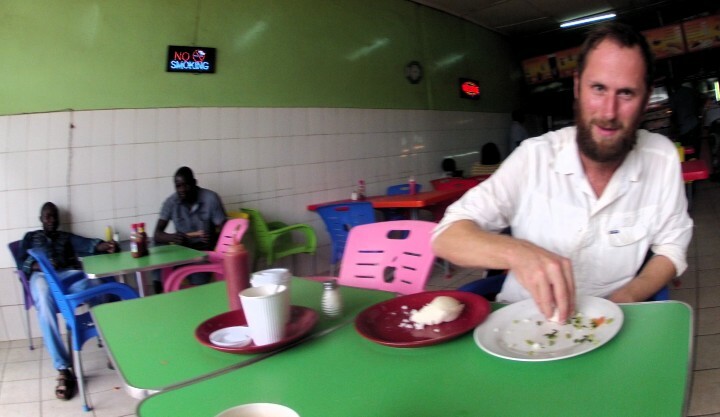 I popped into the Mzuzu Zoo again to say hi to Graham, Chad and Jim and had a BLT lunch. 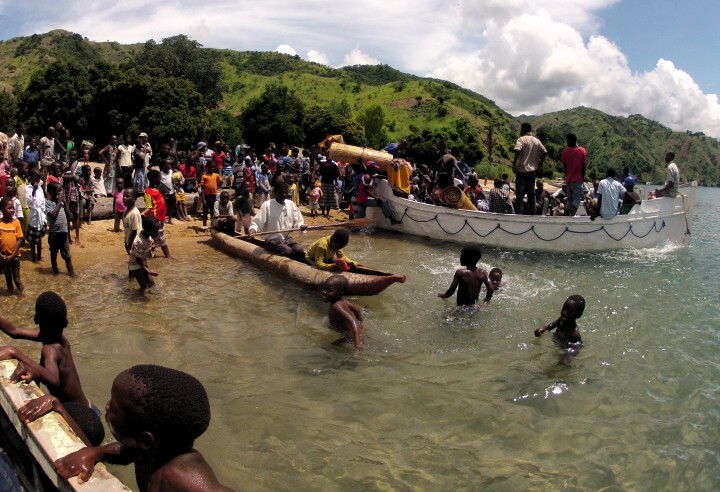 I then headed down to Nkhata bay. I checked out the Butterfly Space but it was a run down and dilapidated place. When looking around I got hassled by a couple of artists to check out their work. Not a place I wanted to stay if I could avoid it. Next I checked Mayoka Village which was much better. This is certainly a place where you could get stuck for a while! Me, Jimmy (also from the UK) and Haroula from Canada took a local boat out for a spin (quite literally). Despite me looking like i was in control these things take some controlling and tend to spin on the slightest over paddling or wave. Good fun though. Not the most comfortable either. You end up with a dead leg after not too long. 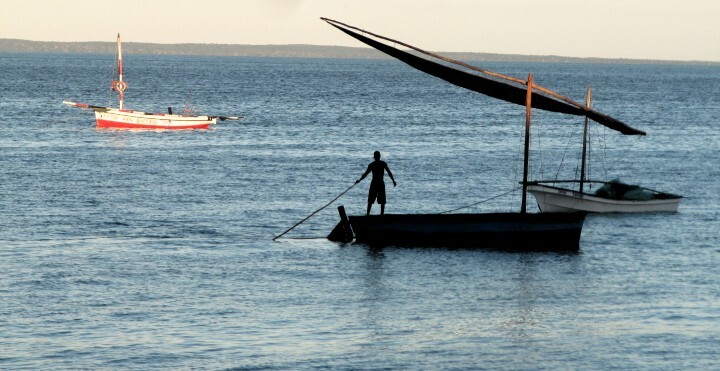 Every Tuesday at Mayoka they offer a free boat trip which is a nice touch. 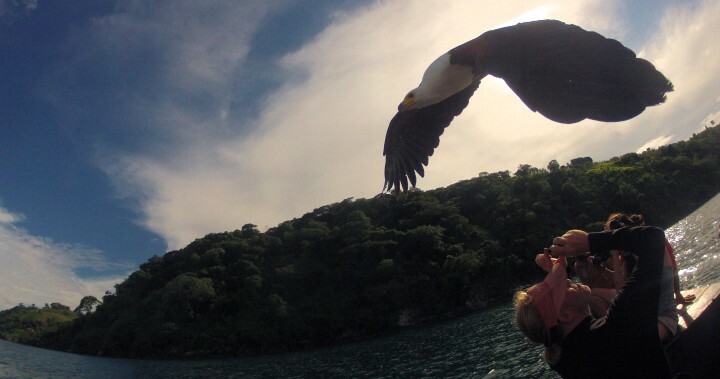 First we fed the fish eagles. 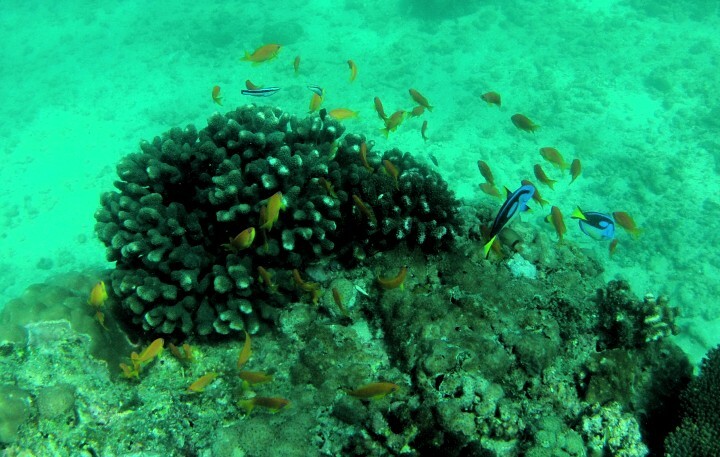 I got these shots with burst mode on the GoPro. That's Gill right below the bird. 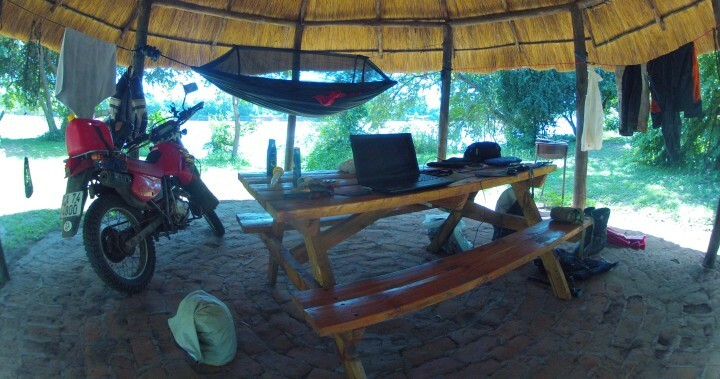 You'll remember he's on the GS1200 and we spent a few days camping on the Kariba in Zambia. I think this shot is pretty cool. Lastly we landed on the beach of a small fishing village. This is everyone banding together to pull the net in. I was interested to the result of all this effort. 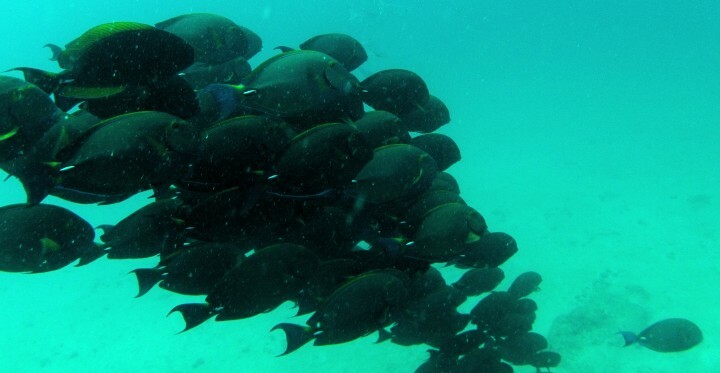 Unbelievably there were only 15 or so tiny fish! You can see in the distance what looks like smoke. 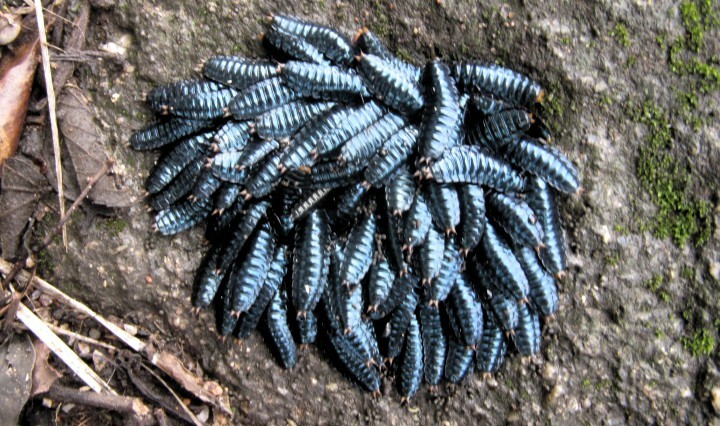 Its actually a swarm of small flying ants. When they come ashore the locals catch them and make them into burgers (I'm not joking!). Life was very relaxed at Mayoka and time flies easily. I decided though that I needed to get move on so I took the Ilala ferry up to Ruarwe. 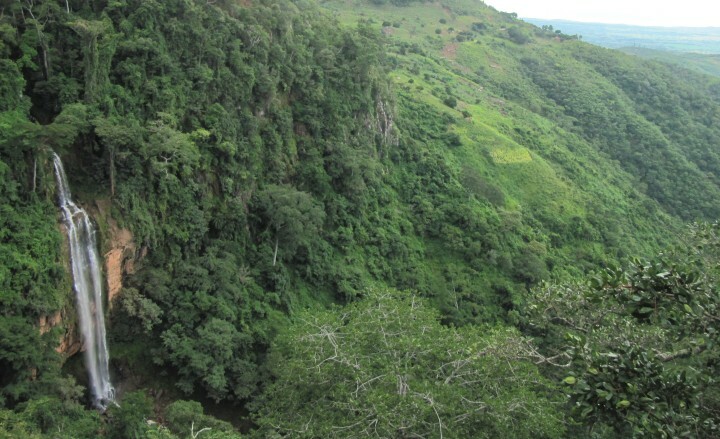 There's a lodge up there called Zulunkhuni River Lodge run by Charlie and Rosa who I met at the Muzuzu Zoo. The ferry took about 6 hours. 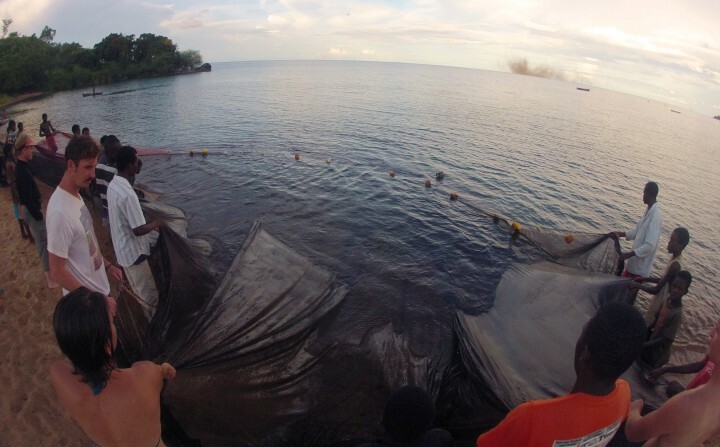 Two of which were spent uploading maize meal to Usisya on the way. 2nd class cost 5200 MWK and was comfortable enough. 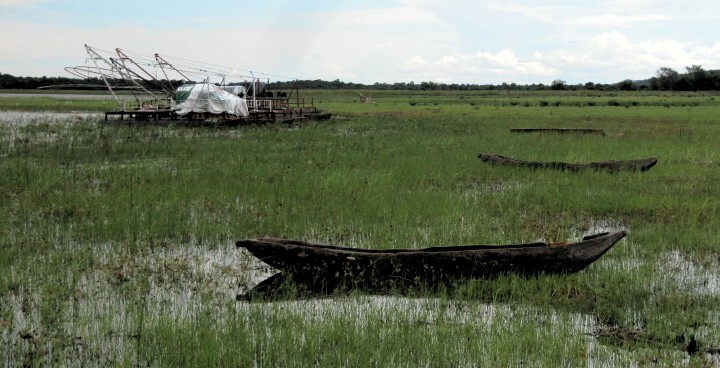 We were met by Charlie on a smaller boat and stopped to collect some luggage before heading to the lodge. This picture really shows the excitement and chaos of the twice a week arrival of the Ilala ferry. The lodge has a waterfall of ice cold water right next to it and a nice swim and a jump off some of the rocks there was an enjoyable end to the day. The next morning I woke up with a bit of a headache which was not normal for me. I never get headaches. I mentioned this to Charlie and he recommended I take a Malaria test just in case. I haven't taken any anti-malerials on this trip and suspected at some point I may get malaria. That time was now. Two lines for positive. Unfortunately I had left the treatment I had bought back in Nkhata bay with the rest of my main luggage. Charlie had some treatment at the lodge which was lucky. It was actually a child dosage and it was out of date too. I started the treatment immediately and took it easy for the rest of the day. I started to feel worse as the day went on and after managing to get to sleep that night I woke at about 4am with a bad fever and was vomiting. I felt really rough and was up for a couple of hours. I managed to fall back to sleep and spent the next day taking it easy again. I didn't know what to expect and didn't feel too comfortable being 6 hours by a once a week boat from civilisation. What if I got really bad ? The Ilala came back in the opposite direction the next day so I decided to take it despite feeling a bit rough. The journey wasn't too bad and the treatment seemed to be working well. I had also stopped taking any paracetamol after I read it can prolong the recovery time. I did have an interesting conversation on the way back with a gentleman named George who shouted everything he said so that everybody in 2nd class could hear. He also occasionally spat in my face as he spoke. He didn't seem to mind too much that I had malaria and had his conversation anyway. I was sweating a lot by this point with the effort of remaining politely interested in the conversation. Fortunately after about 20 minutes he moved on to shout and spit at someone else. He was a nice friendly guy but just difficult to deal with at that time with the malaria. I'm becoming more and more conscious that my trip is going to end. I'm over two thirds through now and really need to get a move on towards cape town. There's so much to see on the way and I only have 10 weeks left and that includes the time I will need to sell the bike. 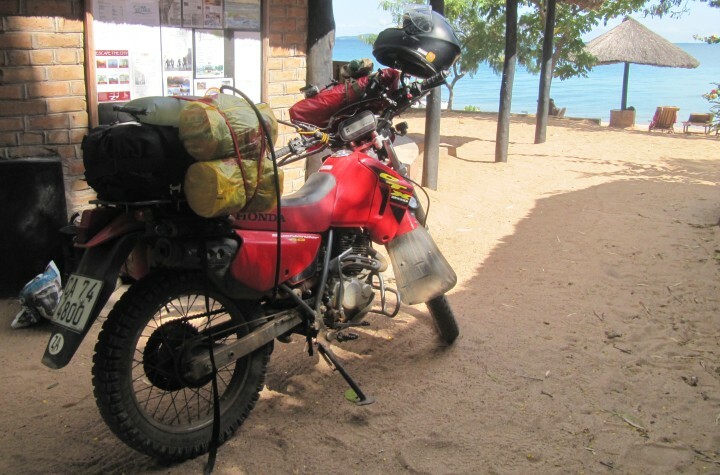 My front tire was a little flat and there's not one electric air compressor in Nkhata bay. This lad used his bike pump and the promise of 300 MWK to sort it out. 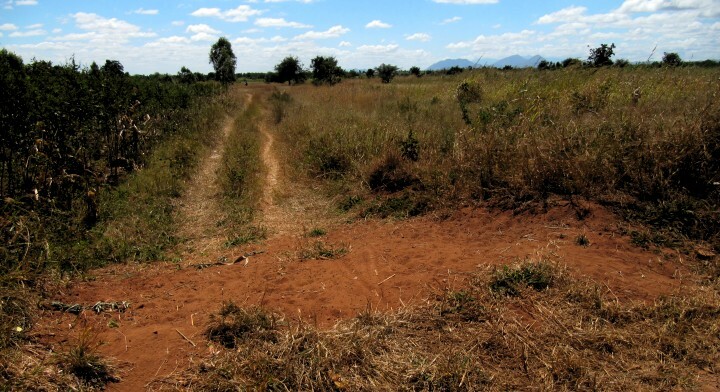 I paid my bill said my goodbyes and headed south down the lake side road towards Lilongwe. 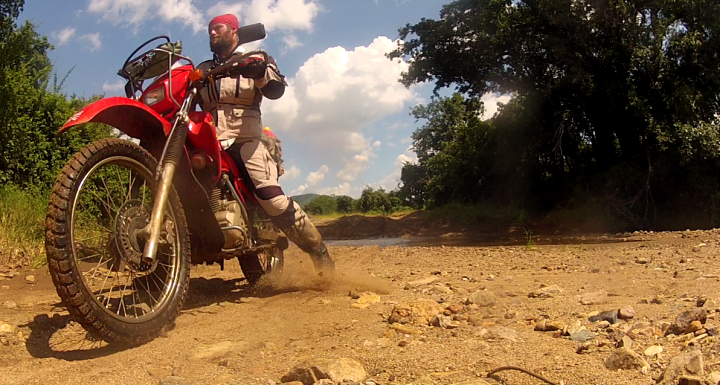 After about 300 km's I reached Nkhotakota. I rocked up at a place called fish eagle bay. For 4000 MWK i strung my hammock up under some thatching right on the beach. The food there was excellent and I had some perfectly cooked fish and rice and settled in for the night. It was incredibly windy that night and I ended up re-orientating the hammock so it faced the wind head on instead of side on. Made for a much more comfortable nights sleep. 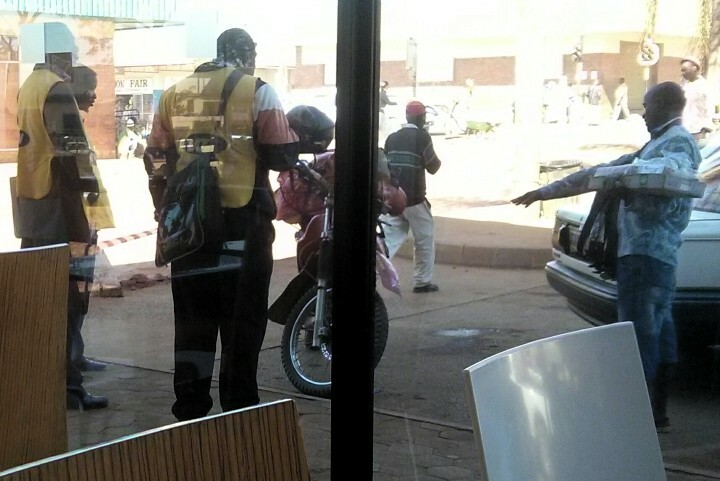 I then set off for Lilongwe and made it in time for lunch at Chipiku supermarket using my bike as a table I ate outside the supermarket for about 1000 MWK. I then checked into Mabuya Camp like before and took a dorm bed. This morning I drove to the Mozambican embassy to apply for a visa but was told to come back tomorrow. My plan is to try for the visa tomorrow and if its available the next day I will stay. Otherwise I will head to Monkey Bay and stay for a couple of nights. I only have 9 days left on my visa so I have to be careful. 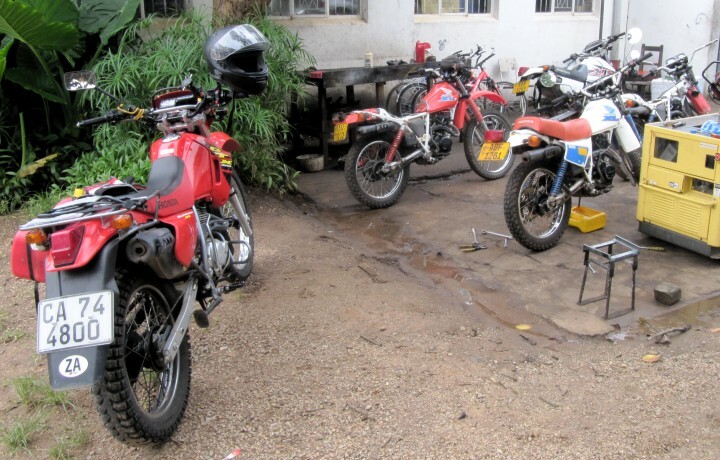 I may try and get the bike serviced in Blantyre. They also have an High Commission there where I can try for the visa again if I need to. I can probably get the visa on the border but I would feel better having it in advance just in case but I'm not waiting around for it. If it takes too long I will just try for it on the border. I plan on crossing over at Zobue and heading to Tete. 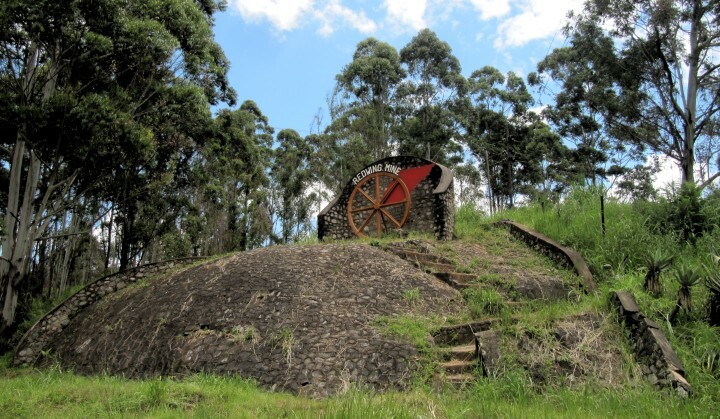 Next I'm going to make my was down to Vilanculos via Chimoio. 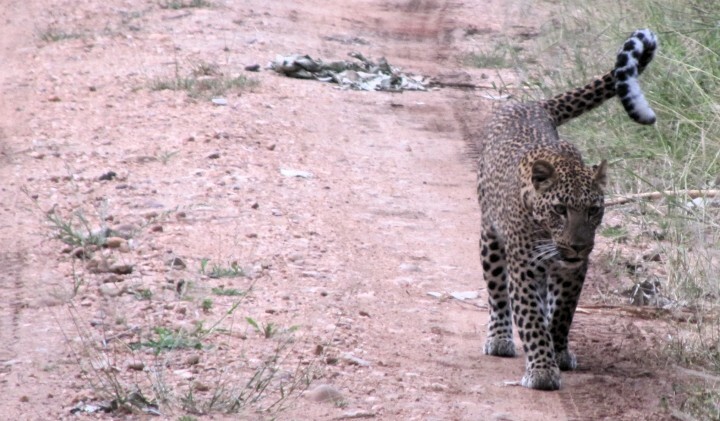 I may only spend two weeks in Mozambique as I know there's a lot to see still in South Africa. 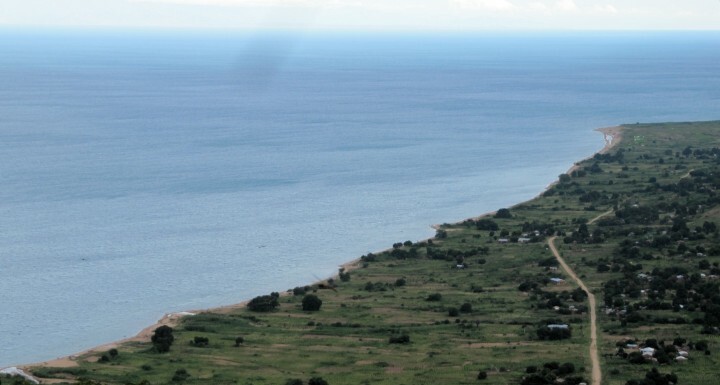 After unsuccessfully obtaining a visa for Mozambique I decided to head down to Cape Maclear. It was only about 300 km's and the route across the hills is a particularly nice ride. Lots of twisty roads and amazing views. I got some great video on this drive too. 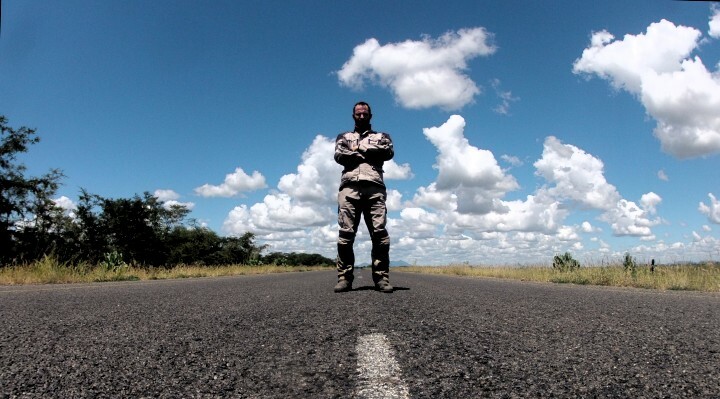 There's so little traffic on the Malawian roads I decided to pose for a photo to take a break. 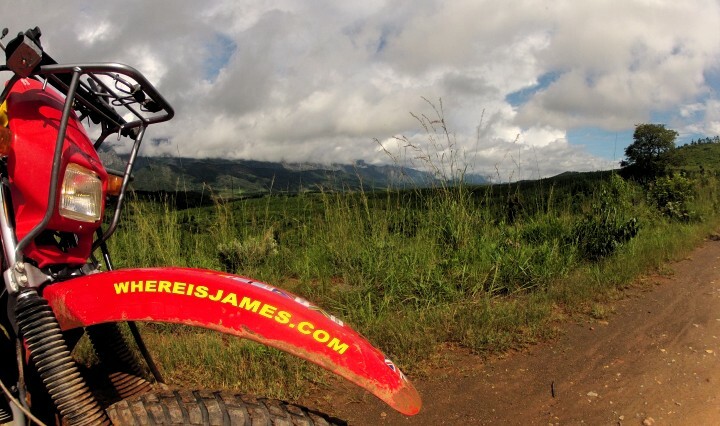 I arrived at Cape Maclear and on a recommendation decided to stay at Fat Monkeys. Its a really nice, well run place with dorms literally next to the beach. I hung out with two Scottish guys for a couple of days and just chilled. 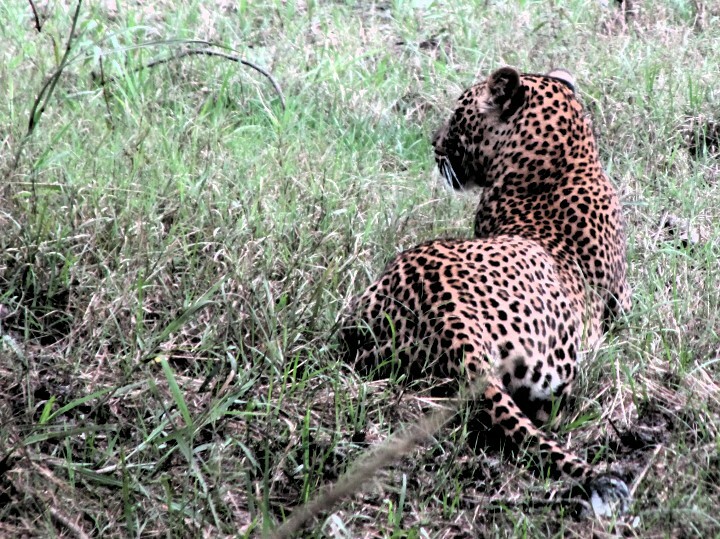 Next I headed south again to*Liwonde National Park and stayed at Liwonde Safari Camp. 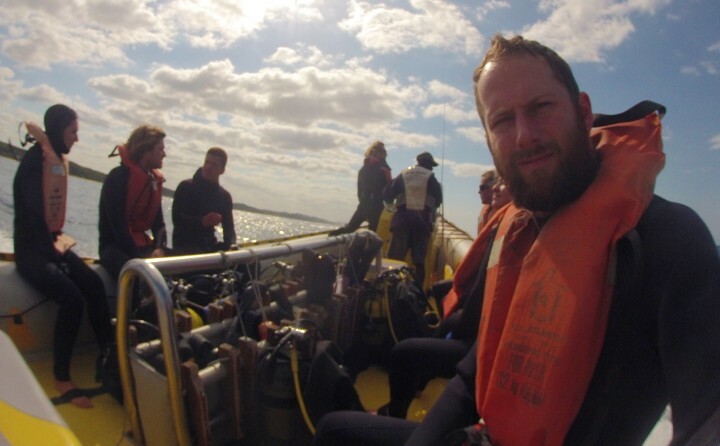 I went on a boat safari but it wasn't that great. I saw 3 elephants from a distance and a few hippos. Perhaps it was the wrong time of year or something. 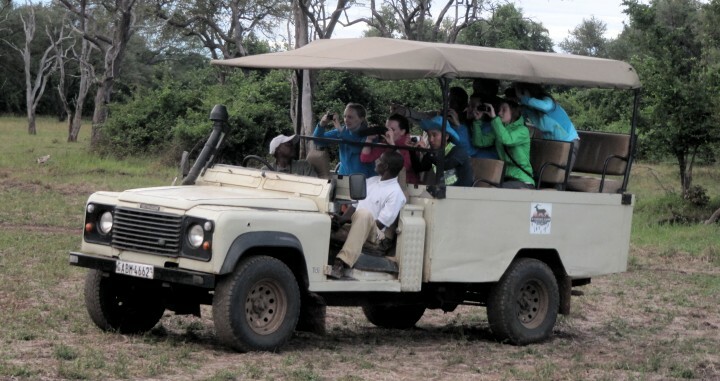 I also think I was spoiled by the excellent safaris I did in Zambia. I also found the prices at the safari camp to be quite expensive too. Dinner was $15 for a buffet with no other options. Here's my hammock camp. Feeling a bit better I left my stuff at the backpackers and drove up to the Sunbird Hotel on the Zomba plateau and had a cup of tea (very British of me). The drive up was excellent and I heard that the hiking was good up there so I drove towards the waterfall thinking I might just hike up and see it. 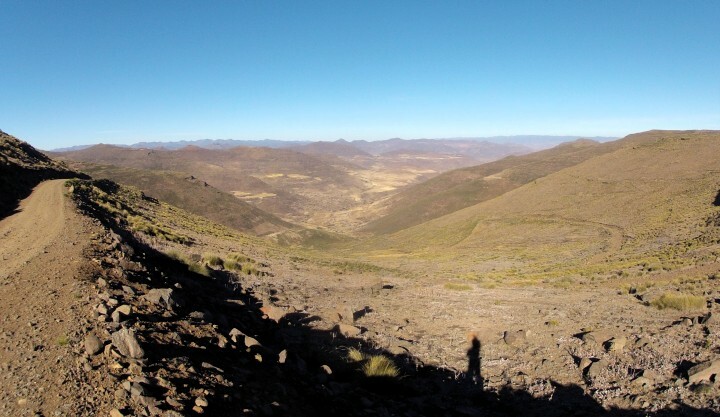 To my delight there was a full on 4x4 trail in a loop around the plateau with stunning view points. 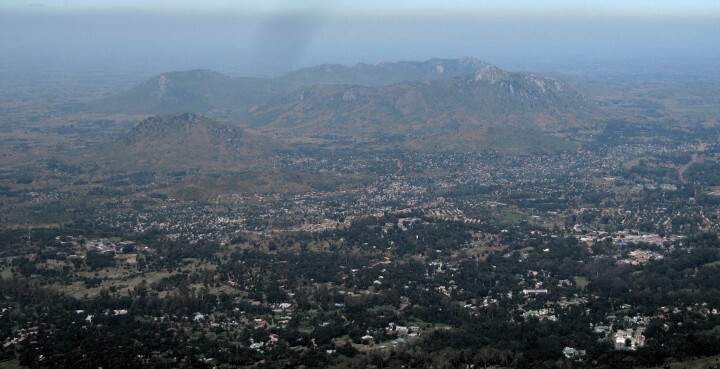 That's Mount Mulanje you can see in the distance with Zomba city in the foreground. About half way round the loop is Chingwes hole which is a deep cave system where apparently the local chief used to throw lepers and mad men. Move impressive in my opinion is the view from there. The road was pretty crap but easily handled by my trusty CTX 200. 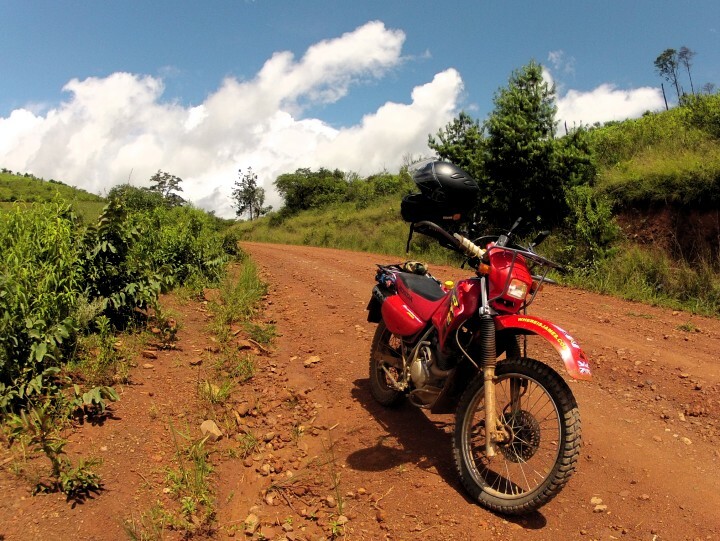 I was really happy to have had a surprise few hours driving round the plateau and really recommend it to any other bikers heading up to Malawi. Next I drove to Blantyre and checked into Doogles Lodge. I only had two days left on my Malawian visa so I didn't bother trying to apply for a Visa and went straight to the Honda dealership the next morning. Fortunately the guys managed to fit me in and do a same day service for the 20,000 km's. Whilst in the showroom *i noticed they were also sending a brand of bike simply called "Tough". The following was written on the tank! "Read Owaner smanual carefully before driving"
Later that evening I went out to dinner with some volunteers. Malawi is FULL of "volunteers" by the way. 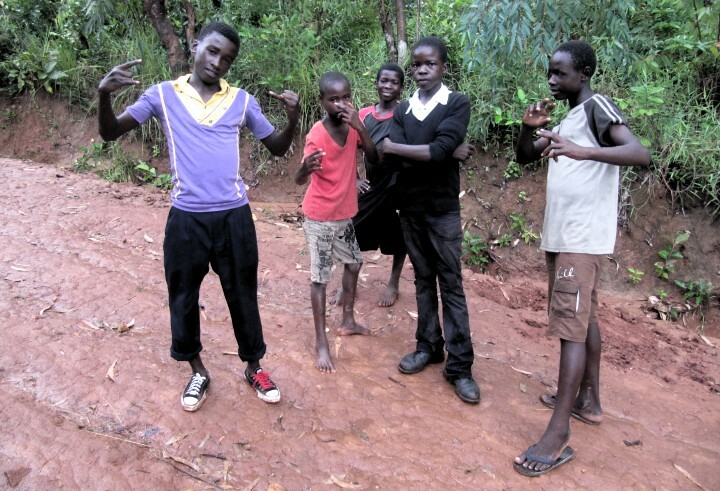 I didn't actually meet that many travelers / backpackers whilst in Malawi. We walked to a nice Indian restaurant in town and had a good meal. I brought up that we should get a taxi back as it was late but the volunteers brushed off my suggestion despite me insisting it was a dangerous move. On the way back I was proved right when a guy cut the bag strap from one of their bags and ran off with her camera, phone and purse. The camera's photos hadn't been backed up either. The local's who saw it all happen asked what the hell we were thinking walking around at night especially in that area. I resisted the obvious "i told you so!" but it was definitely a wake up call for them. 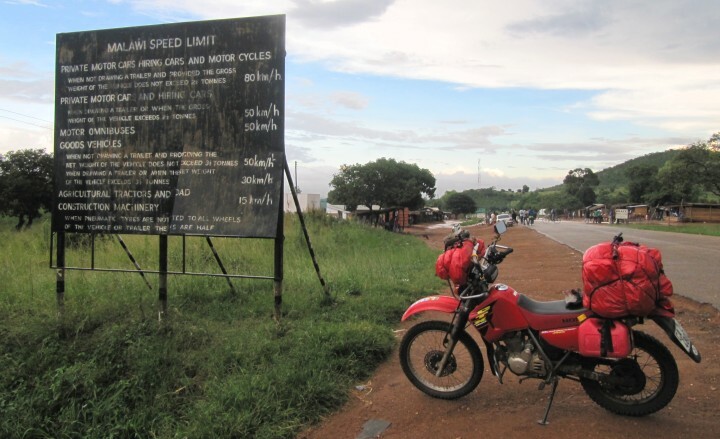 I got up fairly early on the last day of my Malawian visa and headed off for the Zobue border. I was following my GPS but forgot to double check the route (it sometimes sends me in odd directions because i tell it to choose the shortest route). It turns out I was being routed a more direct route which I realised when I was sent down this path. Fortunately I was only 20 km's off track and corrected myself. $75. I had my photo and finger prints taken! I also paid $30 for "insurance" which included the temporary import permit. I think this was too high for bike insurance but the "help" already filled out all my forms and had them processed so I just paid it and was relieved to have made it through. 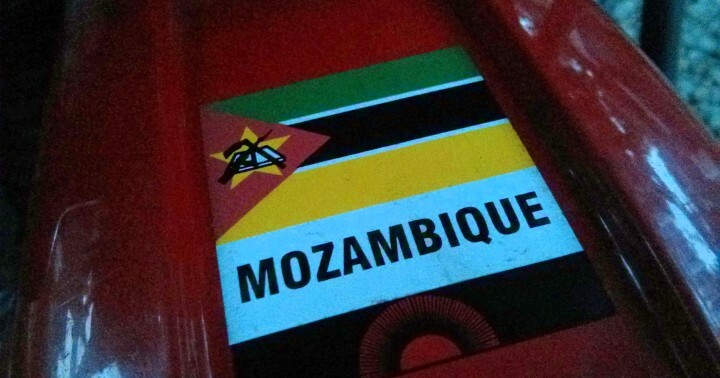 Welcome to Mozambique! My 7th sticker on the bike. The roads started out generally quite good. The problem was being constantly run off the road by trucks overtaking each other and not caring if there was any oncoming traffic, especially a motorbike! I arrived in Tete and found it difficult to find any accomodation. I also couldn't locate a Vodacom office so I could get my sim card and data plan setup. 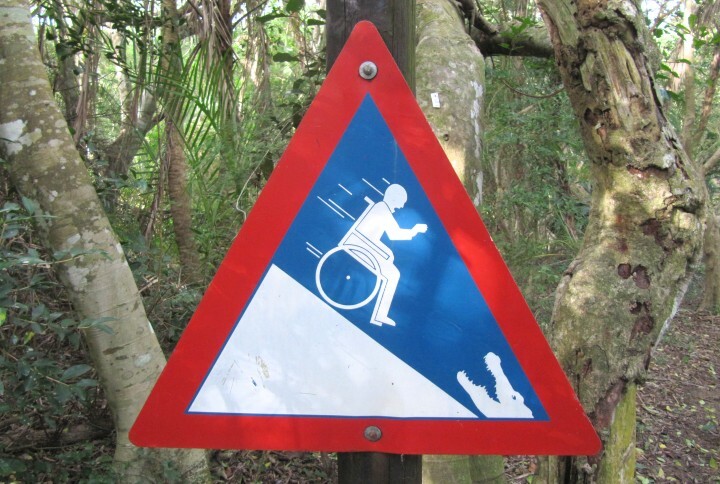 I did notice some signs to a camp site and followed them instead. 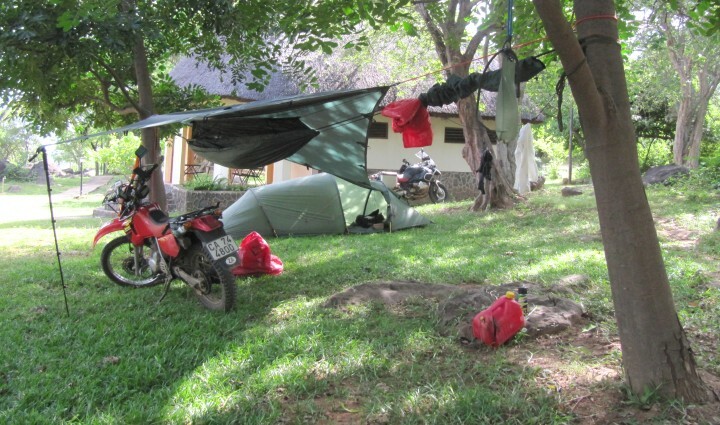 The campsite was called "Jesus E Born" and was essentially some family's small plot next to the Zambezi river. 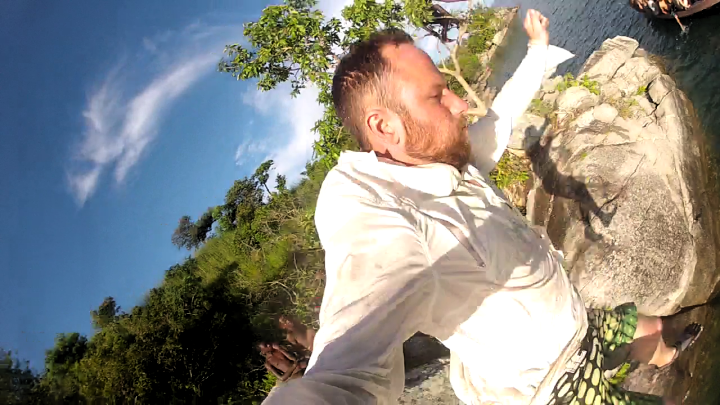 I paid 200 Mets for the night and had a bucket shower in the evening as the shower was broken. I later found out that this camp site used to owned by some sort of religious man (hence the name) but was sold and now not very trust worthy. Apparently some dutch campers had their tents slashed and stuff stolen in the night. Security was pretty non existence there and there was not much of a perimeter fence. This is why sleeping in a hammock is nice... I can keep an eye on all my stuff beside me with just a glance. Here's the view of the bridge and Tete as the sun was going down. 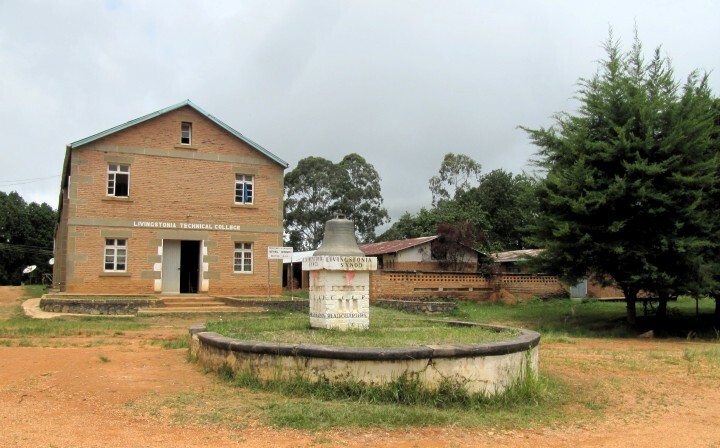 The next morning I got up early and set off for Chimoio. It was a long drive and mostly uneventful apart from being run off the road by the odd truck just to keep me on my toes. After arriving in Chimoio i found a Vodacom shop and got my sim and data plan. This mean't I could then look up where the Pink Papaya Backpackers was located so I could check in! Having the internet on the go is such a useful thing its one of the first things I try and organise when I enter a country. The Pink Papaya is a nice homely hostel run by a German called Anya who is very helpful and full of local knowledge. 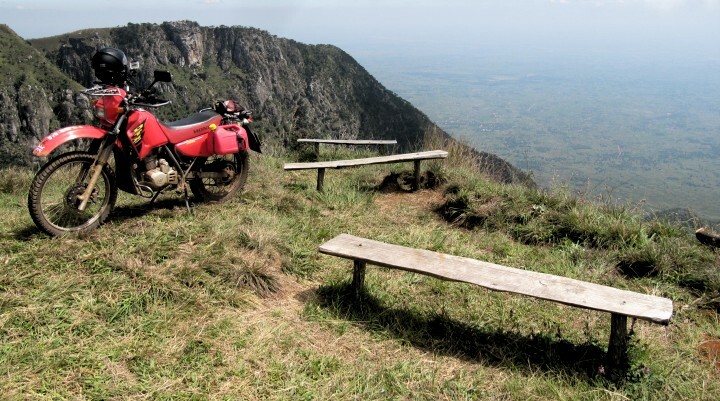 She recommended I go on a day trip around Lake Chicamba where she has sent some bikers before who enjoyed it. Unfortunately it rained quite heavily for a few days so I holed up and waited until it cleared and set off. I ate a nice fish lunch at one of the restaurants overlooking the lake and continued my ride. To be honest the Zimbabwean side was more impressive. As the weather had cleared up nicely I headed down towards Vilanculos. On the way I had to join the military convoy which I just about caught 10 minutes before it left. We passed without any gun fire or other incidents which was good although I did hear that a bus was shot at and several people injured a few days later. Beautiful coloured water and dunes. 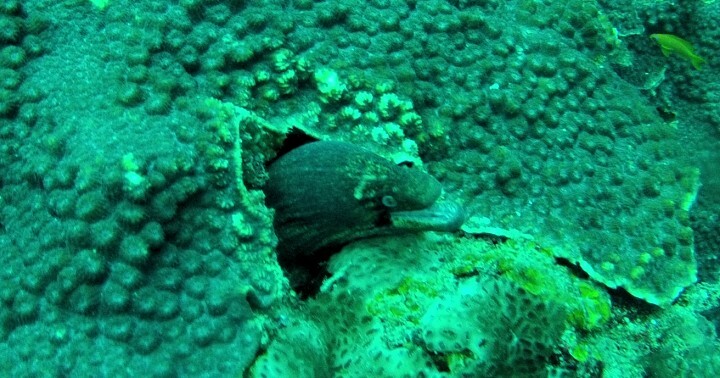 I did two dives (my first in Africa) on the two mile reef. Finally I get my first puncture! The value was ripped from the tube so I just replaced the whole tube for 250 Mets. I did try and get the tyre off myself but I just couldn't get it off and I was starting to damage the tyre so I gave up and this guy did it for 75 Mets. A view *of the beach from Casa Barry. After only two nights I headed south to Maputo. It was a long slog or a ride. 500 km's. I left at 9am and arrived 5:30pm. 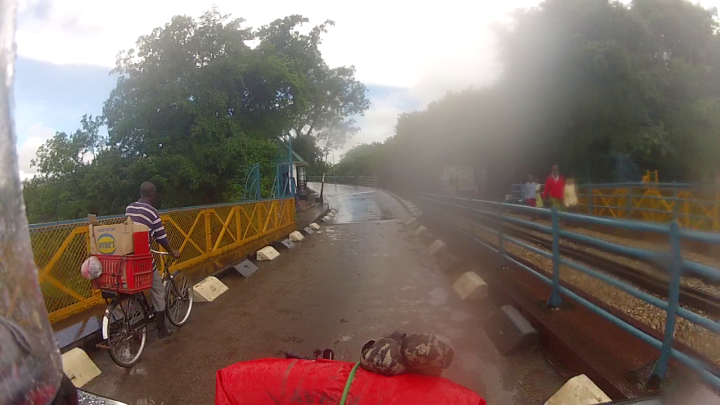 It was mostly continuous riding and just to set me up for the day I got soaked by heavy rain about 50 km's out of Tofo. It took about 300 km's before I finally dried. Nice! 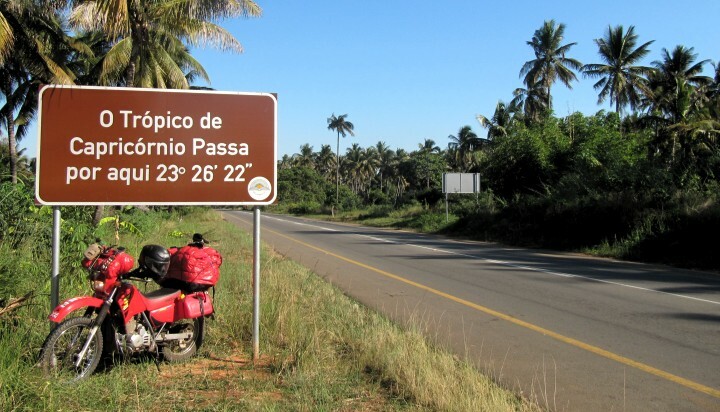 Also about 100 km's from Maputo I noticed my speedo started malfunctioning. Something I need to work out along with the fact I have just run out of chain lube. Most of the police waved me on during the day but one guy stopped me took a closer look and just pointed and said Go! I didn't hang around... Another one went through all my documentation with a fine tooth comb and let me proceed because he couldn't find anything out of order. He did question the fact my driving license expires in 2051 which was a weird mistake by the UK DVLA who issued the license. The traffic into Maputo was terrible. I arrived at rush hour and combined with all the road works going on it was a nightmare getting to "Base Backpackers" where I checked in for a couple of nights. I spent today trying to buy chain lube. I went to the main Honda dealership and they didn't have any idea and just told me to go to Game which I did and as I expected they didn't sell any. Tomorrow I will try Mica and the Yamaha dealership. I also took the front tyre off today and inspected the speedo gear. As I thought the guy who replaced my inner tube didn't seat the gear correctly and its worn down part of it. The guys at Honda will take a look tomorrow. They have CTX's and XL 200's so they should have the part. If not I will get it sorted in Swaziland. Ideally I would like to leave for Swaziland tomorrow but will see how I do for time. I don't mind Maputo as it seems like quite a nice city with plenty to do. 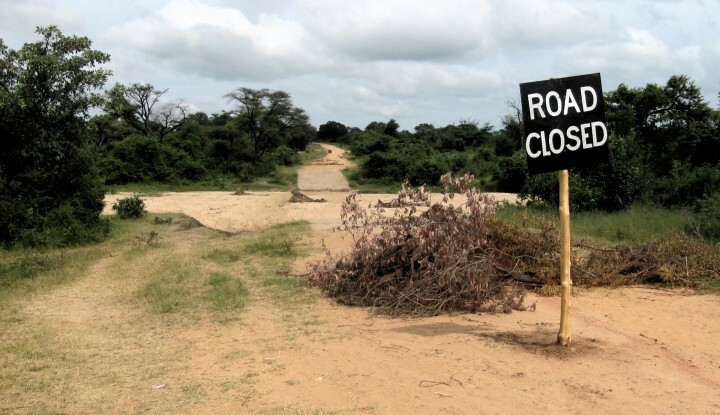 I plan on crossing into Swaziland via Goba and heading for wither "Sundowners" or "Sondzela". 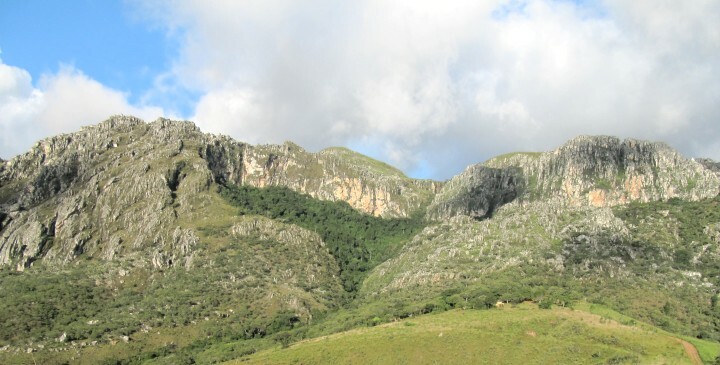 I reckon I will setup a base at one of those two and spend a few days exploring Swaziland in loops. Its such a small country it should only take a few days to explore. Most excellent reading. Well done.
. Just caught up with your ride! Nice job! Ahh yes could well be. I'm slowly getting familiar with their names. There are just so many! The guys at Honda Maputo were pretty useless and didn't have the part or any chain lube and couldn't tell me where I could buy any! Do they not lube their chains at all ? Anyway I left Maputo and headed west through Matola. I popped into the Yamaha dealership and managed to buy some chain lube there. Leaving Mozambique was quick and easy. 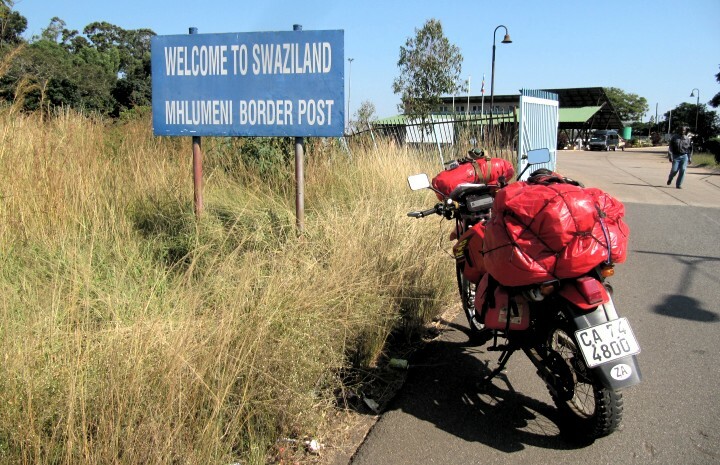 Entering Swaziland was even easier! They didn't even require a TIP or check any of my documentation. I paid 50 rand road tax and that was it. 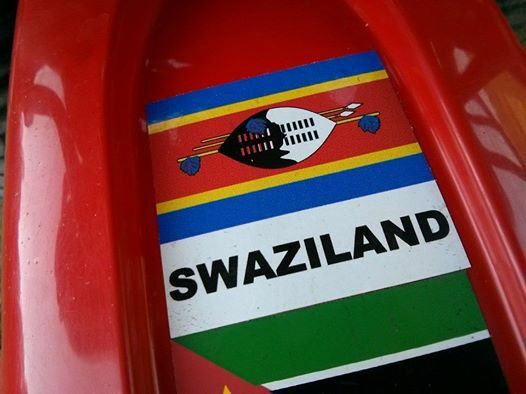 The guys watched as I stuck my Swaziland sticker on the bike too. I had lunch in Sideki and sorted out an MTN sim card. MTN are the only provider in Swaziland on account of the king apparently owning a 30% share and banning all competitors. 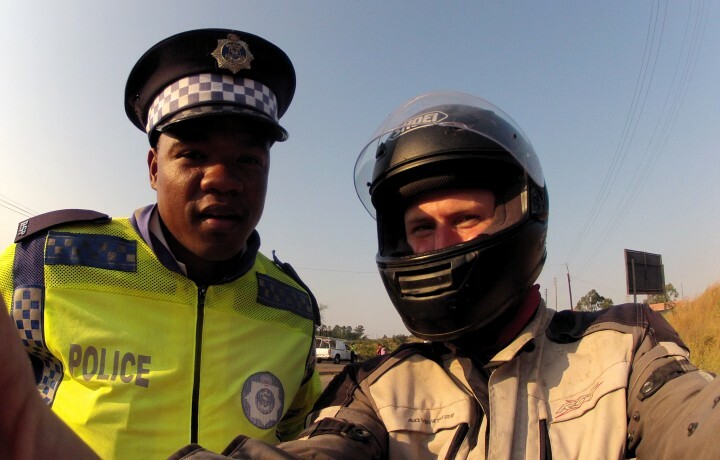 On my way to Manzini I was stopped by the Swazi police for a license check. He was curious about my GoPro so I managed to get this picture. 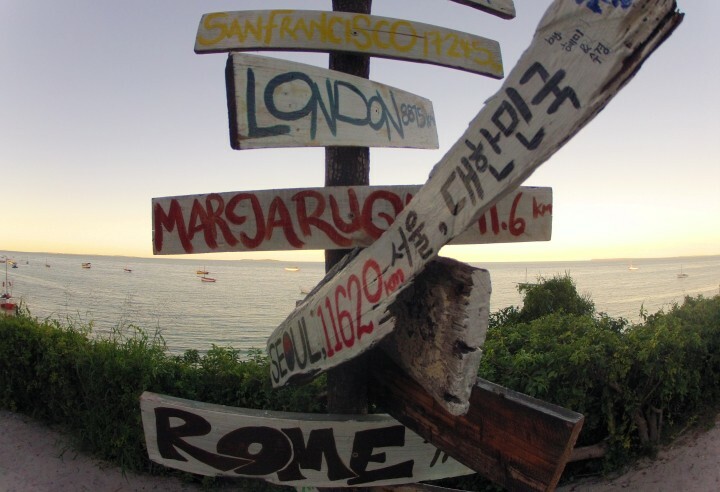 I headed straight for Sundowners Backpackers*and checked in late afternoon. 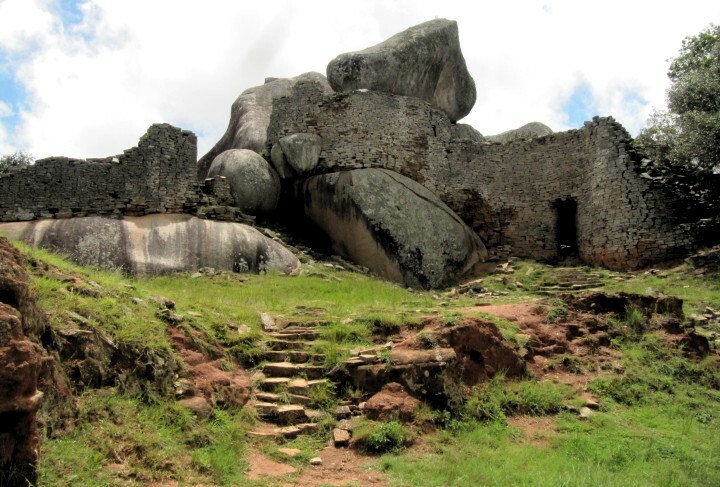 Its a really nice and comfortable place to base yourself and I heard from some of the peace corp volunteers that its the best backpackers in the country. I was still having trouble with my speedo and noticed Carson Motors just outside Manzini so I popped in the next morning and they replaced the special washer inside for 90 rand. *Below is a picture of the old one. You can see how its worn away where it wasn't seated properly. Unfortunately though this didn't totally fix my problem. The speedo is fine when you are accelerating but when you engine break or cruise it's all over the place. I'm due a service soon so will have it sorted properly then. I reckon the park this washer meshes with is worn too. The guys in the dealership were very helpful and pretty amazed that I had taken the CTX so far. 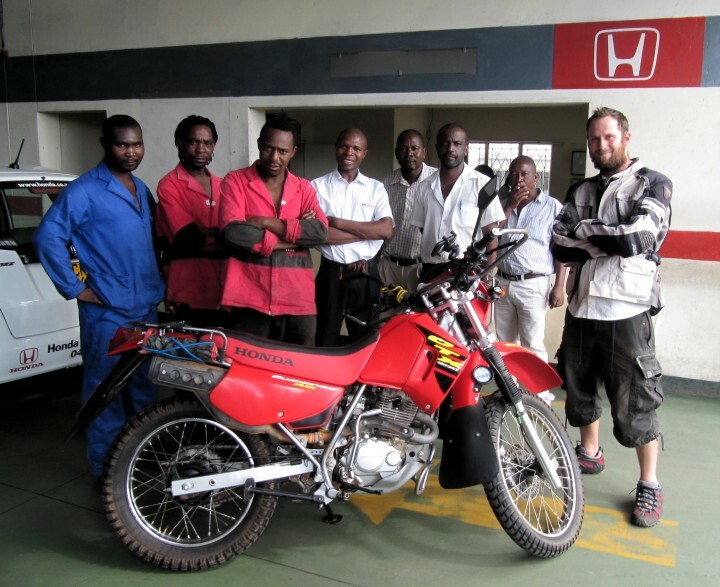 They have a lot of them in Swaziland so they know the bike well. 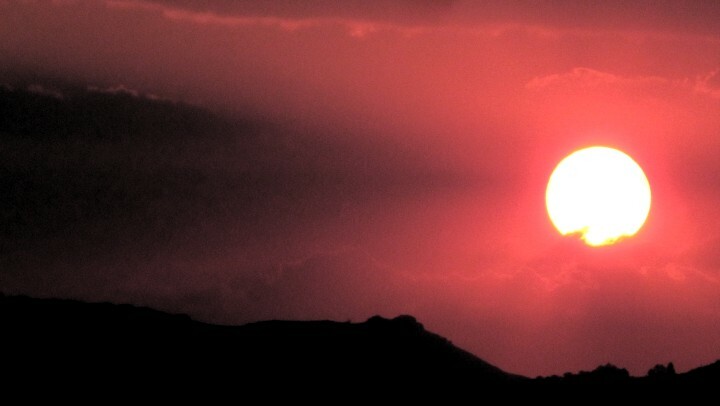 That evening I drove up the hill behind the backpackers and watched the Swazi sun set. I also got a nice time lapse video of it too. That evening I had a few beers and a chat with Sergio the owner who rides a GS 1200. 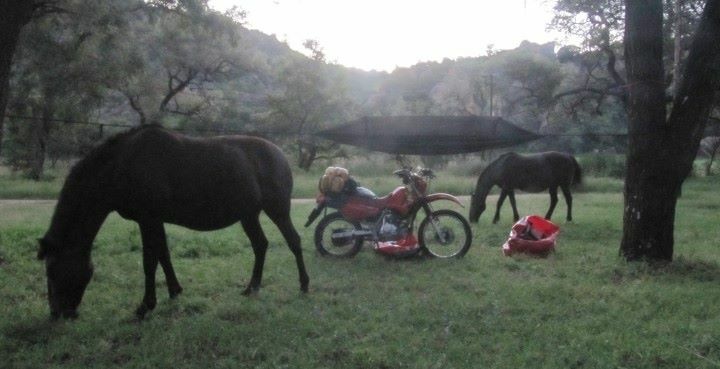 Also staying at Sundowners was Max who rides a KLR 650. 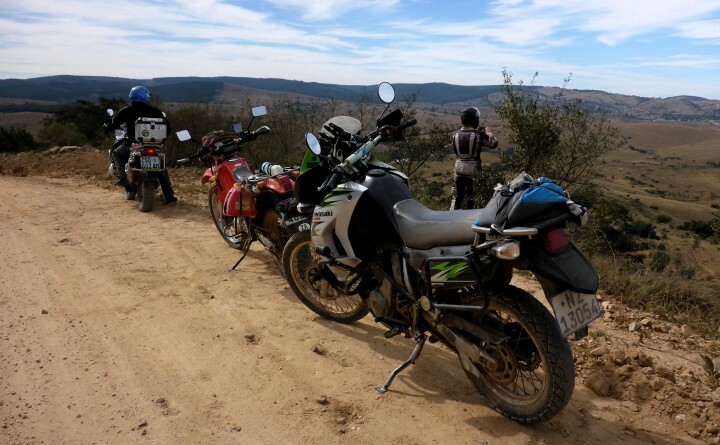 We all agreed to head out the next day to explore one of Sergios routes in the South West of Swaziland. 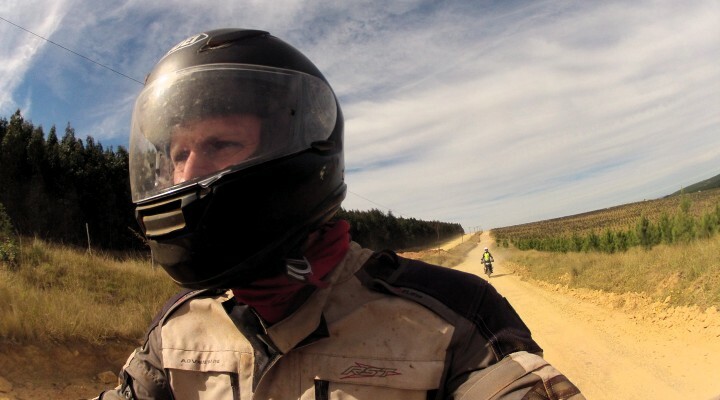 You can see Max behind me on the KLR. Stopping for a few pictures. Awesome view point behind one of the cell towers. Nice trails through the forests. You can view or download our route here (in GPX format). Being very aware of the end of my trip looming and after 5 days in Swaziland I decided it was time to head back into South Africa. Here's the route I took as suggested by Max. Mostly tar but with around 20 km's or gravel it was a scenic route towards the border. 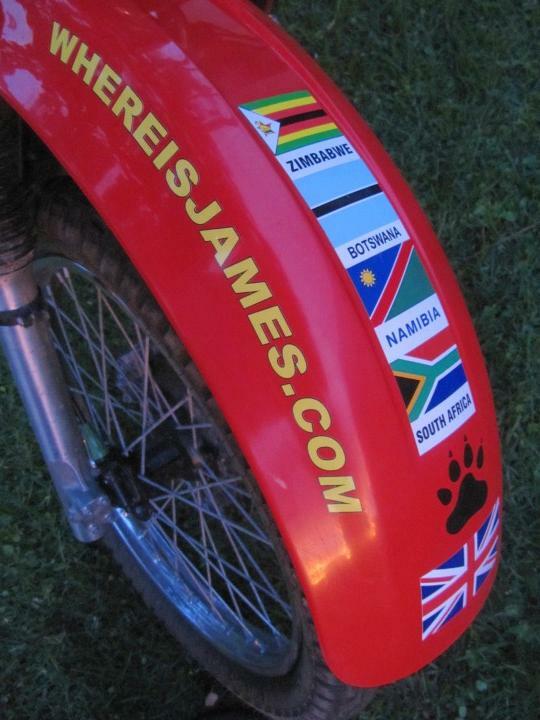 Now the flags are building up on the front of the bike people often stop for a look and read out loud all countries I've visited so far. Here's a picture of four guys talking about my bike. The border crossing itself was pretty straight forward. The fact I had already been in South Africa did cause them a little problem but I have a flight booked for the 30th of June which put them at ease. The police also wanted to check my passport and then driving license but when he saw we were the same age (32) he didn't care about my license any more... weird. 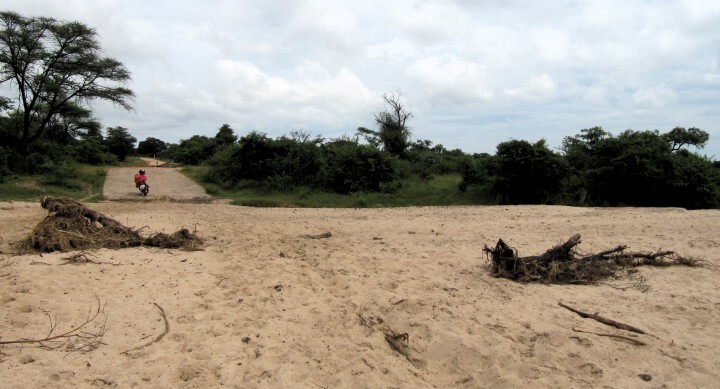 The road beside pongolapoort dam. I shouldn't really have left it so late to leave as the sun was starting to set and I still had 50 km's of gravel to drive before I made it in to Sodwana. Still I made it just before dark and checked in to Natural Moments Backpackers and got a room for 150 rand per night for two nights. 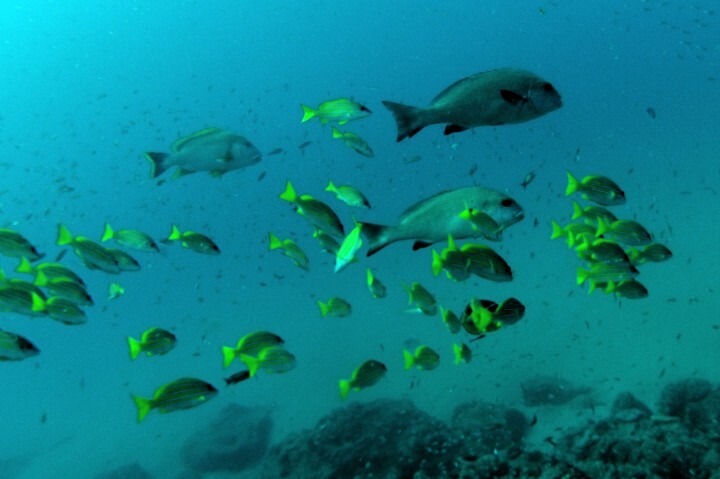 The next morning I headed next door and managed to get on a lunchtime dive to the Stringer dive site on the 2 mile reef. Including this Potato bass who was very friendly and curious. 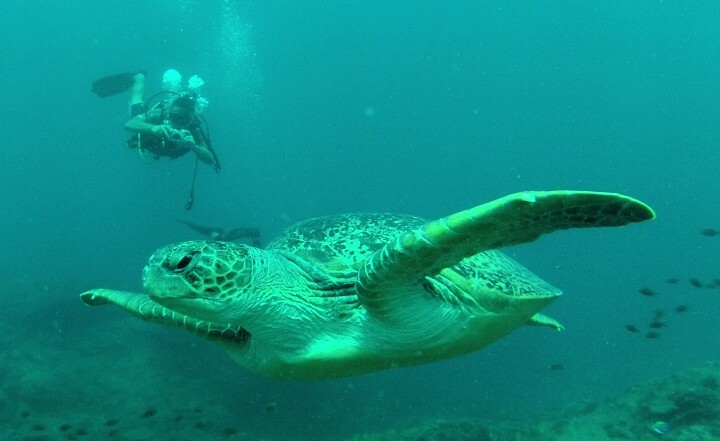 I've never seen one before but one of the divers was banging on the floor and it came right up and was very interested in what he was doing. Amazing. 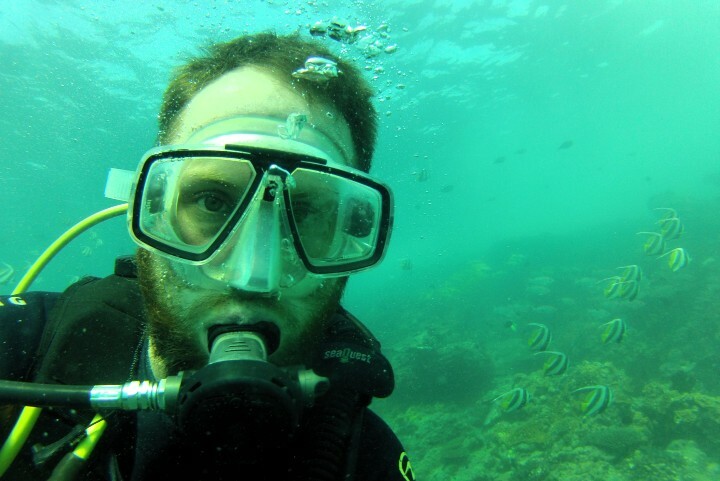 The next morning I headed down the coast to St Lucia and checked in to Budget Backpackers. Being low season I have a whole dorm to myself for 150 rand a night. 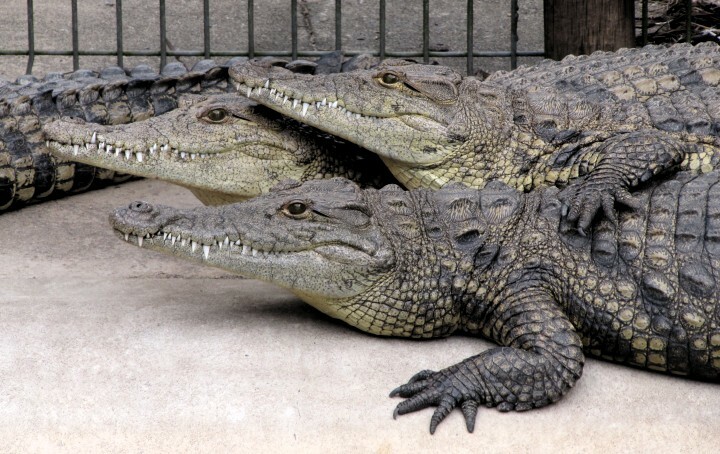 I plan on going to the crocodile center and visiting the beach today. Not exactly sure where I will go tomorrow but I may pop in to Durban to get the bike serviced on Monday. As always if there are any suggestions I'm all ears. I drove down to beach in St Lucia and had a walk around for a while. Its a really nice long beach and almost nobody there. After a drive around the town and lunch at the yacht and boat club. I headed to the crocodile sanctuary. I got chatting with the owner who was also a biker. Nice guy. I don't remember learning this one for my theory test! The next day I drove to Durban and checked in to Gibela Backpackers Lodge*which wasn't cheap at 240 rand a night for the dorm but its a very well run place. I guess you would call it a "flashpackers" rather than a backpackers. I got in contact with "The Badger" on the forum and he suggested we go out for a ride in the valley of 1000 hills. We met up Sunday morning along with EssBee and his wife and headed out. The weather was great and the views stunning as we weaved off road through the hills. Taking a tight corner a bit too fast I managed to lowside and my foot got trapped under the bike as I fell forwards. I didn't actually fall over but must have twisted my ankle under the bike. It didn't feel too bad initially so we kept on riding. 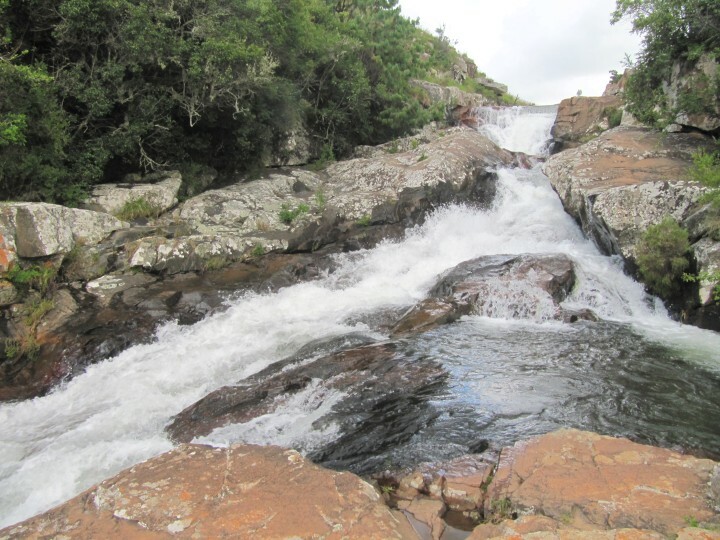 Stopping for a rest by this cascading river. In the distance were some "plastic bikes" (as The Badger called them) riding up and down the side of a very steep hill. Impressive stuff. 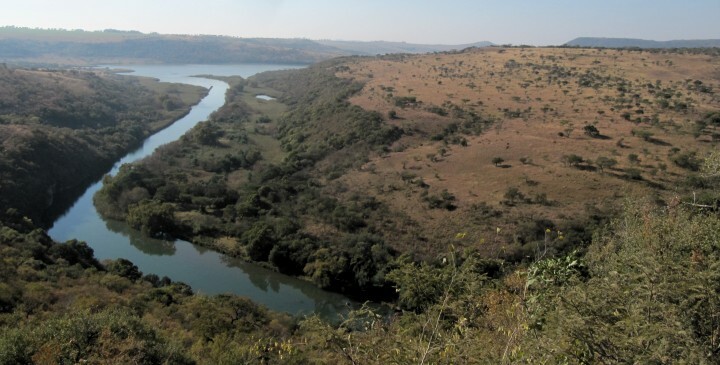 We finished up the rider about lunch time with the awesome view of the Umgeni river. Here's a panoramic my The Badger. We headed down to The Badger's house where his wife kindly made us some lunch and we sat around chatting for an hour or two. After sitting down for a while my foot began to hurt more and by the time I made it to the backpackers it was really quite painful. Here's the bruise that was starting to form a few days later after the swelling had gone down. Ouch! After resting my ankle for a few days in Durban I could nearly walk again so I booked my bike in and got it serviced at the Honda dealership in Pinetown. It cost me 1330 rand! I had got used to cheap services on my travels and this was a bit of a shock but they did a good service and drove me around which is was being serviced. 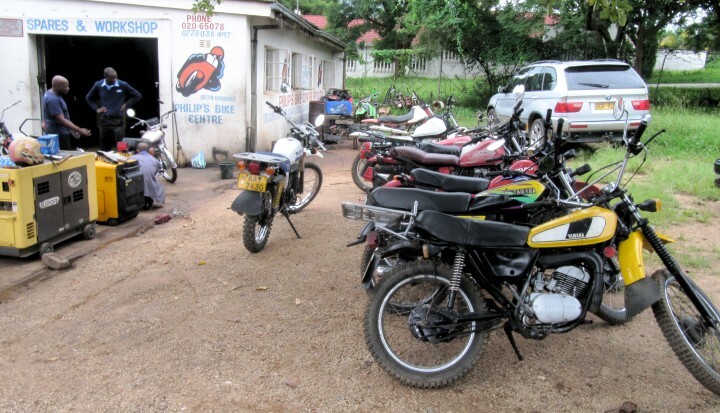 In fact I'm not entirely sure that the Honda dealerships in Malawi and Zimbabwe were official dealerships just because they had Honda painted on the wall outside. Ohh well. 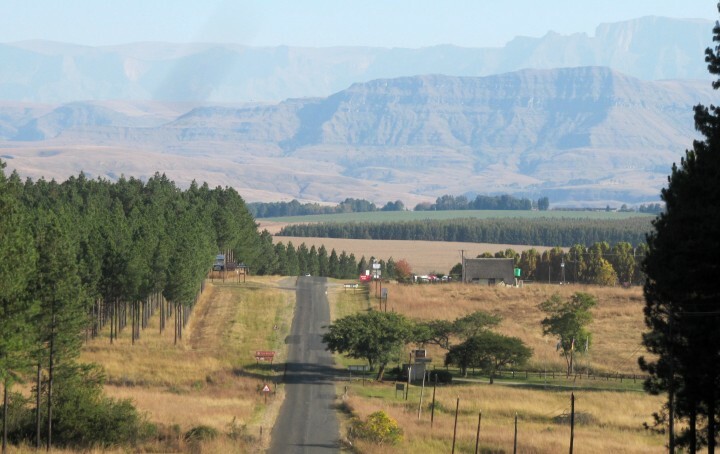 The next day I was feeling better and decided to head off to the Champagne Valley in the Drakensburg. After taking the motorway about 2/3rds of the way I set my GPS to avoid motorways and took an R road and then some dirt roads the rest of the way. 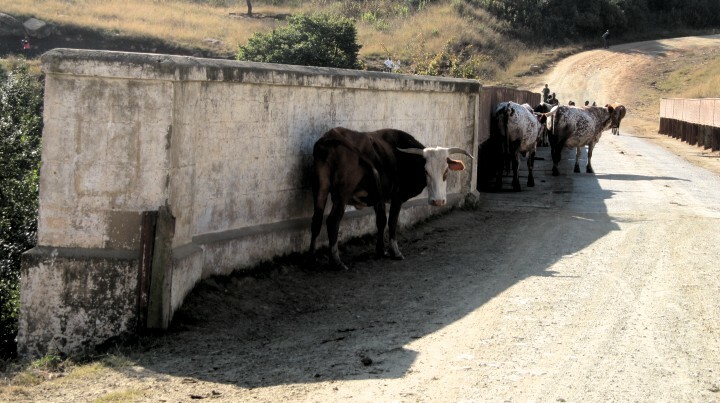 I came across this bridge full of cows. As it became for hilly I could tell the scenery was going to only get better as I got deeper into the mountains. The mountains in the background as you drive into the Champagne valley. This morning I decided that I should probably go and have the ankle x-ray'd just in case it was broken and needed treatment. I hopped on the bike drove 5 meters and noticed I have a flat front tyre! Noooooo! This is really not what I need right now. Its Sunday too and nobody is about to help me out so I soldier on and manage to get the tyre off and with the aid of some washing up liquid I managed to break the bead and inspect the inner tube. That crappy repair I had done in Mozambique was back to haunt me again. 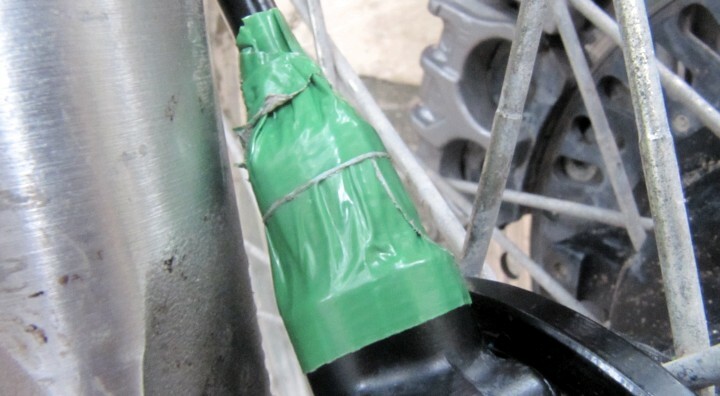 The rubber band that protects the tube from the spokes had snapped where he had bodged it together with glue and thread. Its a lot colder now so I wonder if that was what made it break now as opposed to earlier. I managed to get some thread, glue and gaffa tape and repair it. It seemed to hold and was a bit of a pain to get on the rim again as its much smaller than it was originally. I must replace it soon before it goes again otherwise I will probably have to make one with an old inner tube. I decided to use my new spare tube instead of patching the old one as its a slightly better brand and will hopefully last longer. I managed to get the tyre back on again with the aid of more washing up liquid only to pump it up and realise I had pinched the tube. Grrrrr.... So again I remove the tube and repair it and replace it. Guess what ? I pinched it again! Remember I'm trying to sort all this out with a really sore potentially broken ankle. Not my best of days. I carry on though and repair the tube again. This time I pinched it twice. Very happy with myself after 3 hours of hobbling about and 4 patches later I have fixed both inner tubes and finally put the tyre back on the bike so I can get myself to Ladysmith for an x-ray tomorrow. 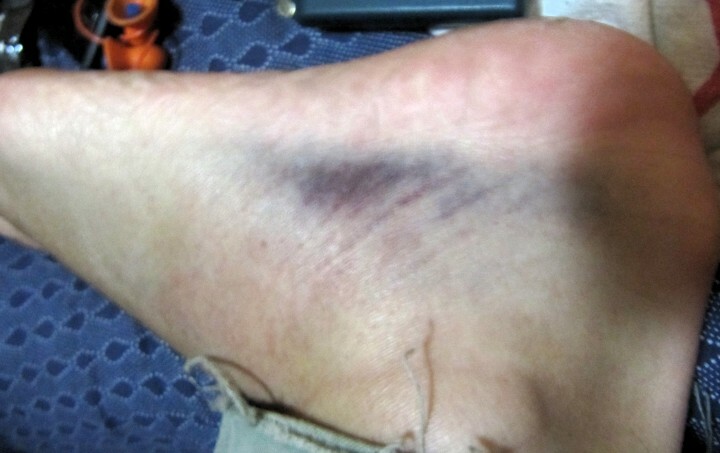 I notice this evening that my ankle if feeling better than yesterday and the bruising has gone down a lot. I think I will see how I feel tomorrow. 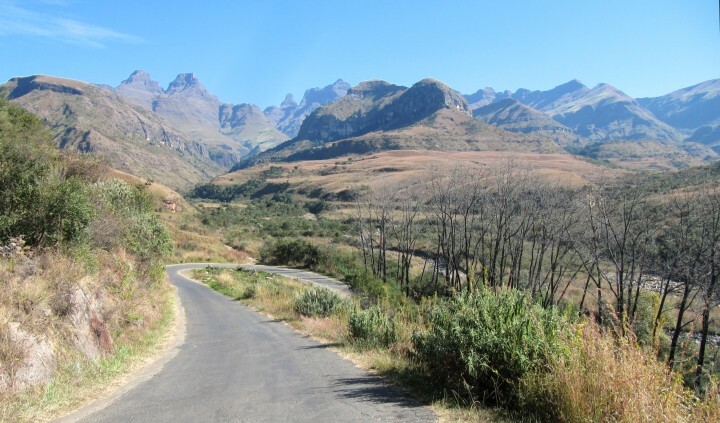 I'm hoping to explore the Drakensburg and then drive the sani pass soon so I hope to get better sooner rather than later. Absolutely brilliant. Can't believe its taken me so long to find your RR. Fantastic pics. After leaving the hospital happy that my ankle wasn't broken I was greeted with another flat tyre. That bodge repair I had made on the rubber band that that protects the tube from where the spokes screws must have given way. Luckily there was a petrol station close by so I got them to pump it up again temporarily which gave me just enough air to get to a local motorcycle shop. They replaced the inner tube and the rubber band for me while I had lunch at Wimpy (Dagwood and chips, nice!). Unfortunately I must have dropped or left my gloves somewhere in all the mayhem as they wern't with my helmet when I picked up the bike. That's my second pair lost now! Doh! I blame the relaxant / pain relief they injected me with before the scan. 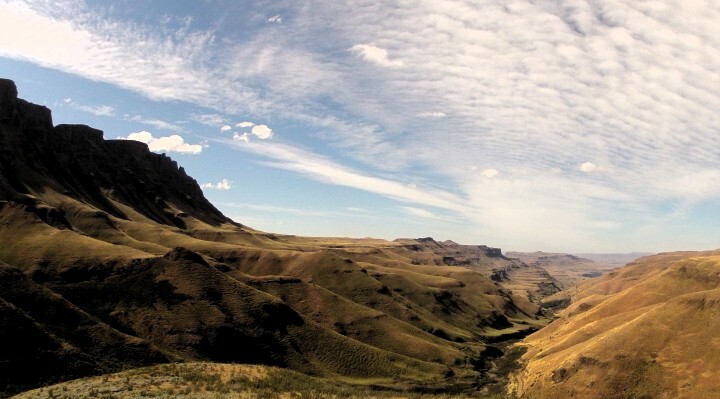 I popped in to the Amphitheater Backpackers for some lunch and then looped back round to the northern Drakensberg. I came across the graffiti on the way and had to stop for a picture. 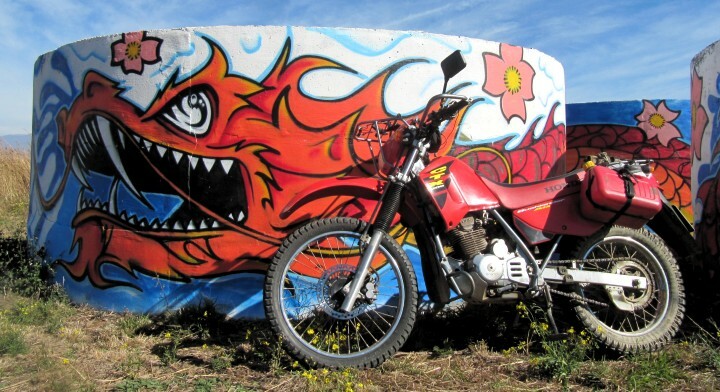 Always makes the bike look cooler when there's some colour matched artwork behind it! 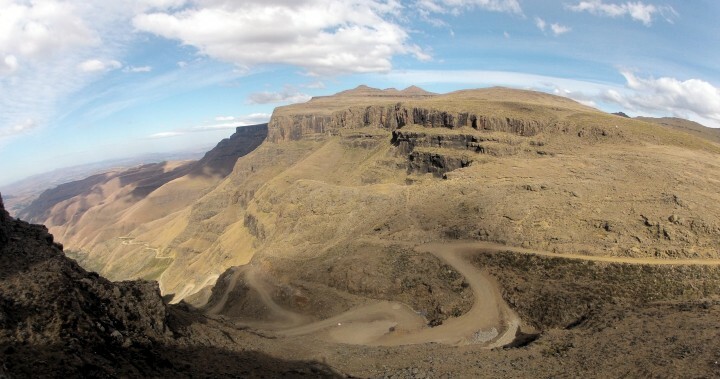 Time was getting on so the next day I decided to head towards the Sani pass and drove across some pretty remote windy gravel roads. On the last stretch with the sun setting I came around a corner with the sun in my eyes and just about saw a truck at the last second parked at possibly the worst part of the road with no warning triangle. I hope the next drivers that come along see the truck in time! I checked in to Sani Lodge Backpackers where I spent the night in one of their dorms. In the morning I set off down the pass and got stamped out of SA no problem and began working my way up the pass. The scenery really is spectacular here. The view from about half way up down the valley. As I was working my way up I noticed a guy walking down and as I got closer recognised him. 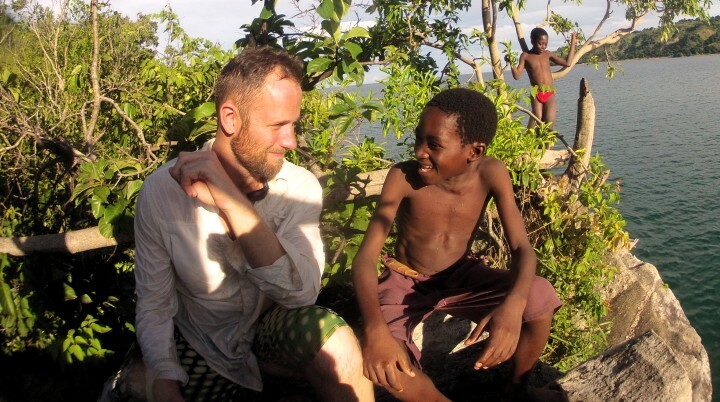 His name was John from Ireland and we had met in Malawi at Nkhata bay so we chatted for about half an hour and swapped details. Small world! Next I tackled the end of the pass with its tight hairpin turns. Doing it on the CTX200 was actually pretty easy if I'm honest despite my tires not having so much grip left in them. 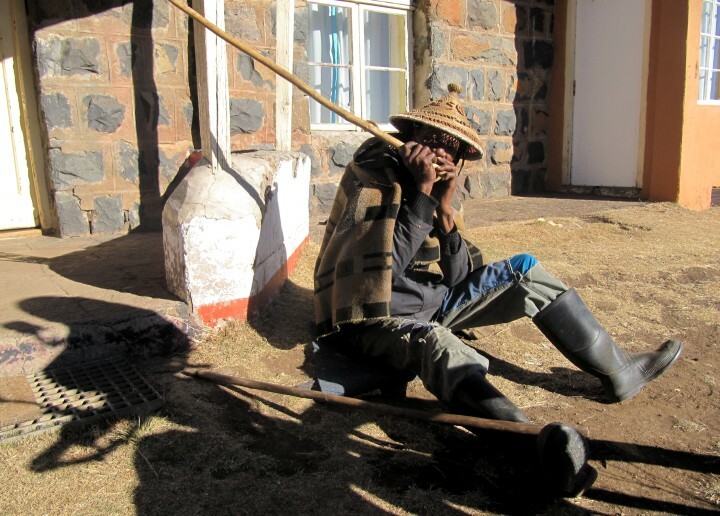 The Lesotho immigration was pretty run down but quick and efficient. I had to pay 30 rand for the bike and that was all. 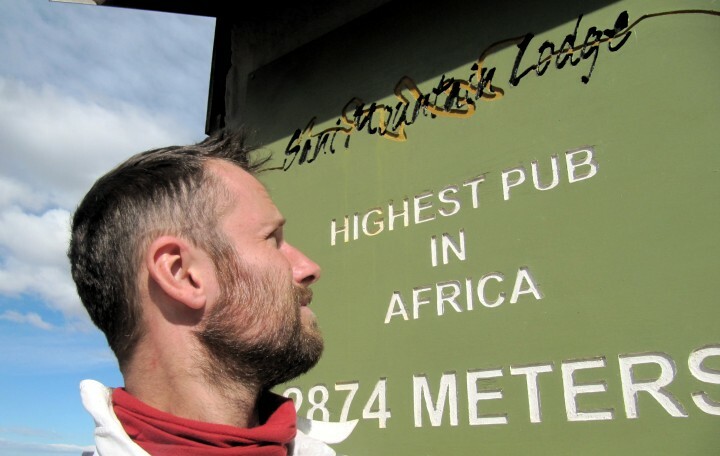 I popped into the highest pub in Africa and had some lunch where I met some other tourists who were very interested in hearing my story after they heard how long I had been on the road. 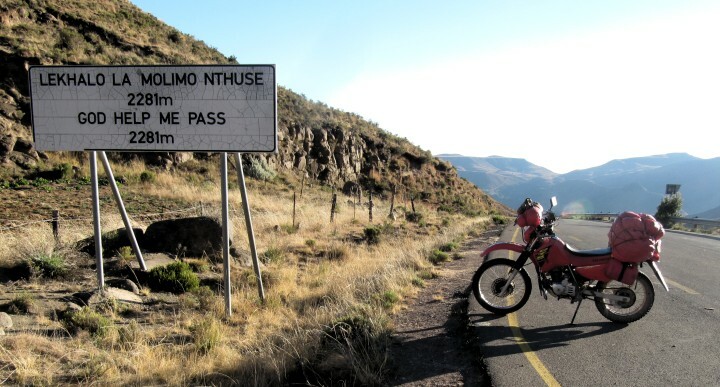 One of these characters was a south African called Rudy who gave me some pointers on a route and explained about Prince harry's involvement in Lesotho and his motorbiking across it quite frequently. Interesting. It must have been about 3pm by the time I left the pub and headed off to try and find some accommodation. 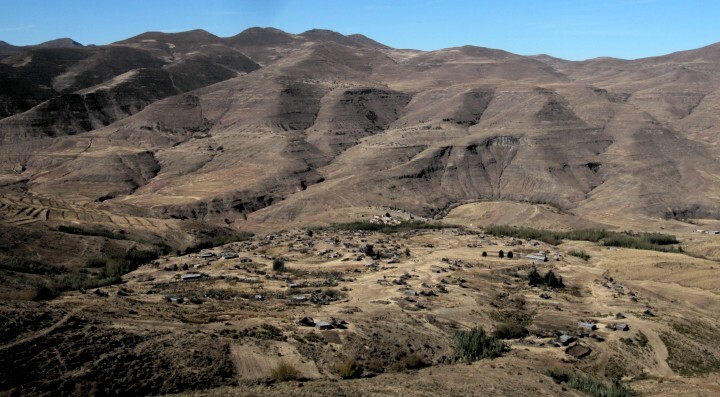 I couldn't find very much information online about Lesotho so I was relying on a poorly drawn map I had been given by a guide at the last backpackers. I made my way down the very rocky roads and wondered, at the pace I was going, whether I would actually make it somewhere before dark! 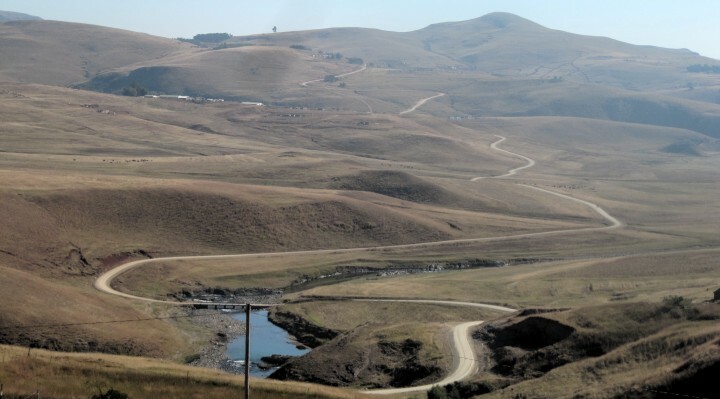 I took a turning just before Mokhotlong and after about 10-20 km's reached a turn off to a lodge that was on my hand drawn map. The locals pointed me down a terrible road which lead to some stone houses. The guy in the local shop showed me the hostel / lodge that was 150 rand a night. I was the only one there but glad to have found a bed for the night. It was freezing cold and there was no heating or electricity of course. I cooked up some baked beans and tuna and made myself a cup of soup to warm up. Luckily I had my sleeping bag the duvet and 3 blankets to keep warm. I slept pretty well and had my breakfast then went outside to check on the bike and came across this guy who I thought was a night watchman. He didn't speak any English nor I Sotho. He seemed to be pointing at some sticks so I just nodded and gave him the thumbs up which is pretty standard when you can't speak the language. After breakfast I began packing up the bike and he started to play one of the sticks which have a really weird sound. It was pretty interesting and entertaining while I packed the bike so I gave him 10 rand which I think was perhaps too much. He was so pleased he tried to kiss my hand! The road was in pretty bad condition and my ankle was still a bit sore so it made it tough going in places. Looking at the distance involved and my lack of accommodation options I was again a bit worried I had bitten off more than I can chew. Still the scenery was amazing! Another village up in the mountains. One of the rivers winding its way through the mountains. Spectacular. 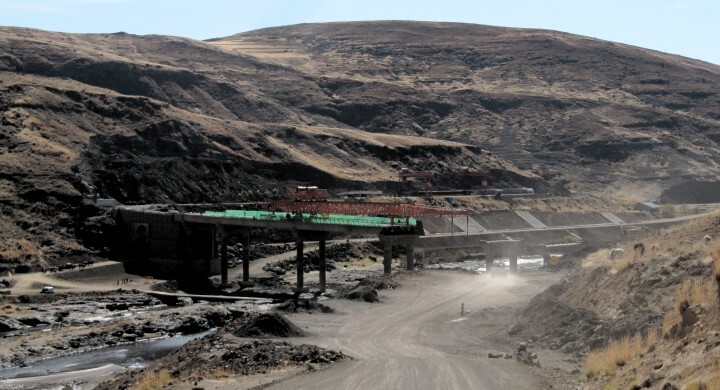 They seem to be working on extending the roads towards the Sani Pass and I wonder how long it is before its tar all the way! 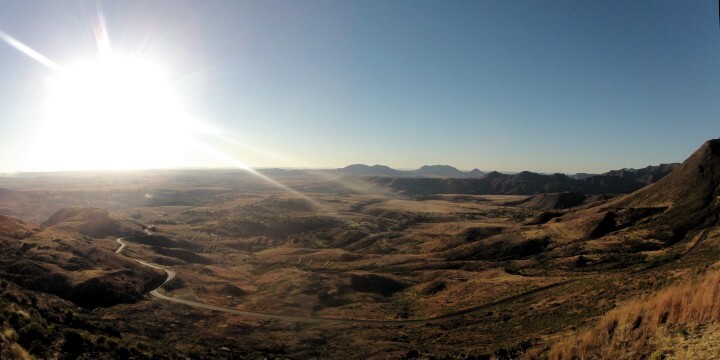 After averaging 20 km's an hour (with breaks) I made it to Thaba Tseka and that's where the proper tar began. They also sold fuel there which was a relief as I wasn't sure at all on how easily obtainable fuel would be. 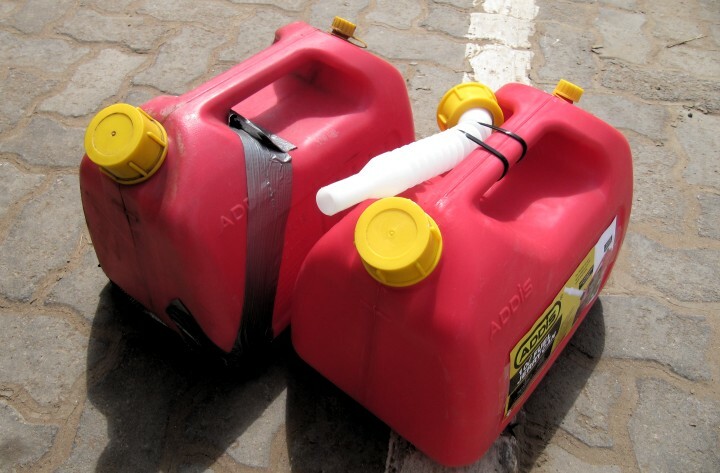 I had been carrying my extra 10 liters of fuel just in case. I had some lunch and then headed off towards Roma where I planned to spend the night on the advice of Rudy the previous day. If I had more time and my ankle was a but better I would have liked to have perhaps explored up to the Dam and stayed there for the night. I worked my way through the many mountain passes including this interestingly named one. 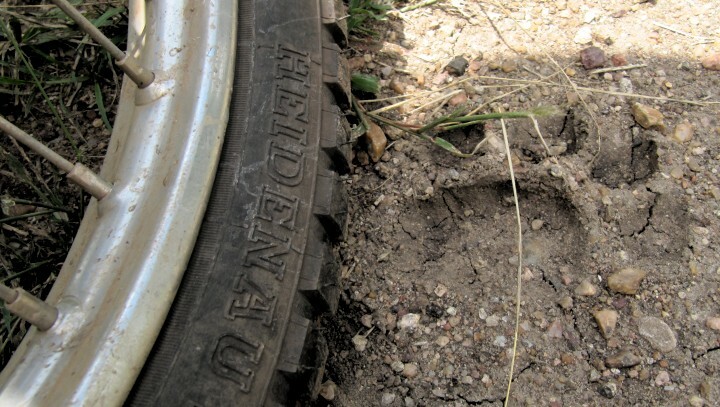 Must have been tough back before it was paved! The decent down towards Roma was impressive too. Nice twisty roads to ride along. 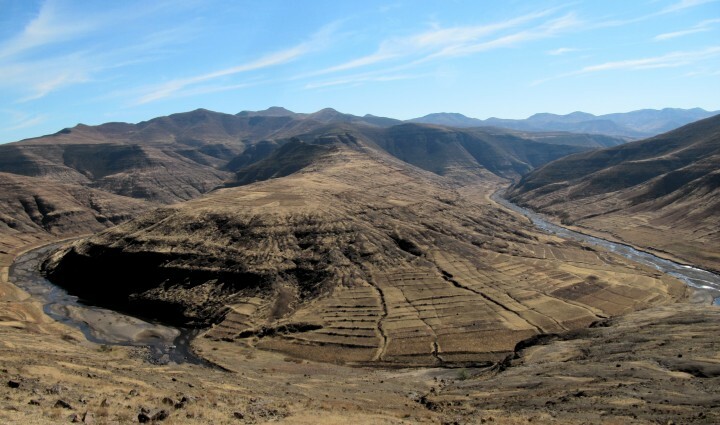 The landscape become less mountainous the further west you travel through Lesotho. As I drove into Roma I came across this rock jutting out of the ground next to the church. 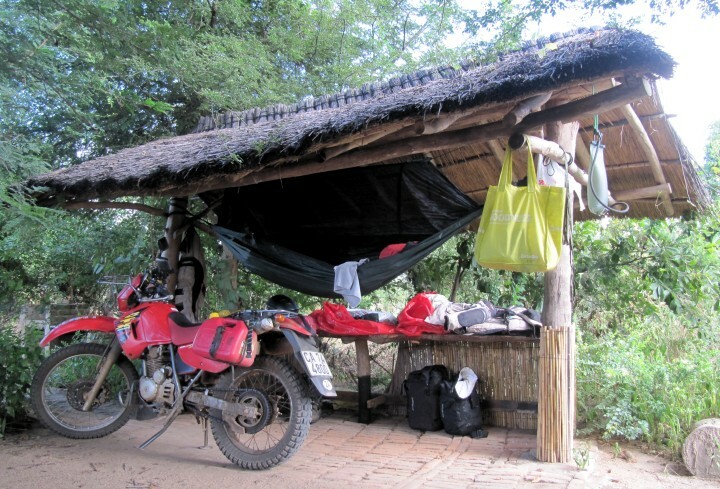 I stayed at The Trading Post Lodge which I gather is where they start the Roof of Africa race from. I met a really nice Canadian couple who were adopting two local orphaned boys. One of them sat on the bike with my helmet on for some photos. Kids do love motorbikes. The next morning I headed for the border. 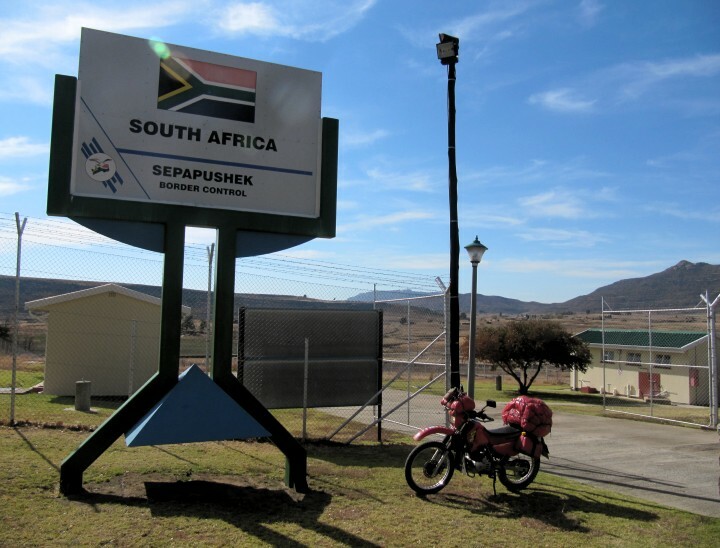 I avoided Maseru and headed south exiting and entering SA at Sepapushek. I do prefer small border crossings as I find they are quicker and friendlier like this one. I didn't really have a plan so I headed towards east London and met another biker on the way called Johan from Bloemfontein so we stopped at Wimpy and I had some lunch while he had a coffee and some ice cream. I left it a bit late to make it to East London so ended up staying at a small B&B in Queenstown. 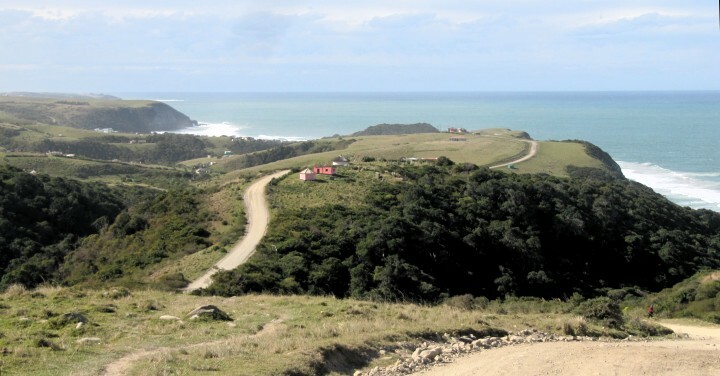 That evening I released I had missed the "Wild Coast" area. 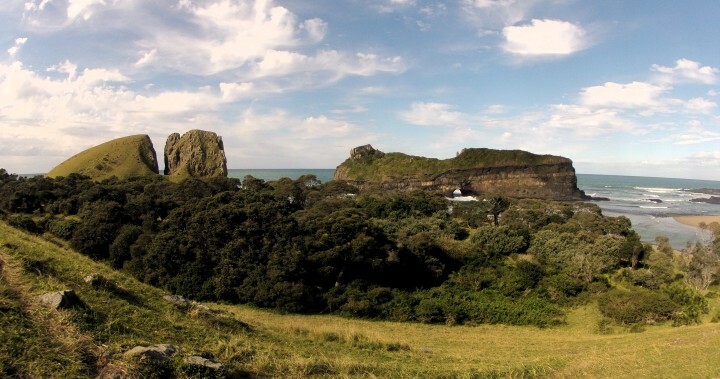 "The Badger" had recommended Port St Johns to me so rather than heading to EL I headed there the next day. Port St Johns was OK I guess. 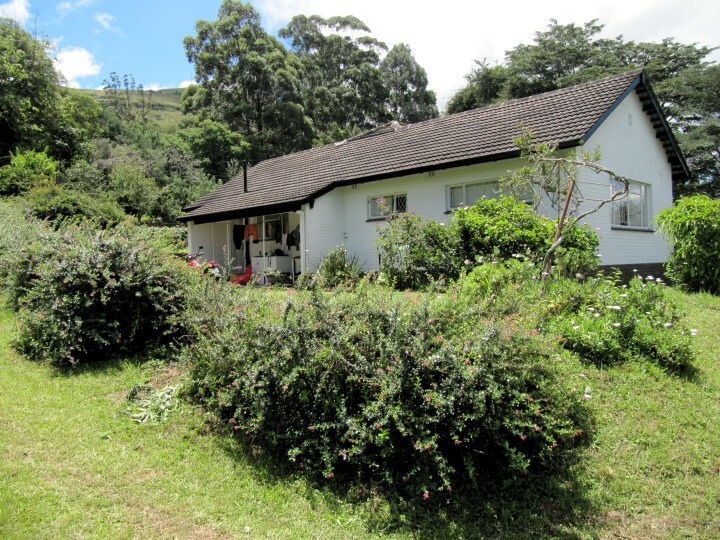 I stayed at Amapondo Backpackers*for a couple of nights as I needed some rest. I usually like to spend at least a couple of nights at places because its getting quite tiring getting everything ready each day and also it allows you to actually experience some of it rather than rolling on through. 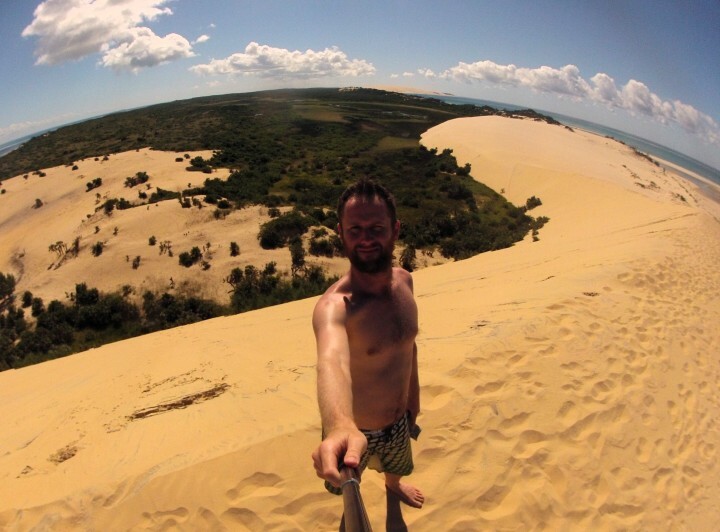 Some backpackers I met recommended that my next stop should be Mdumbi instead of Coffee Bay so I checked it out. Here's a picture of the river joining the sea on the way in. 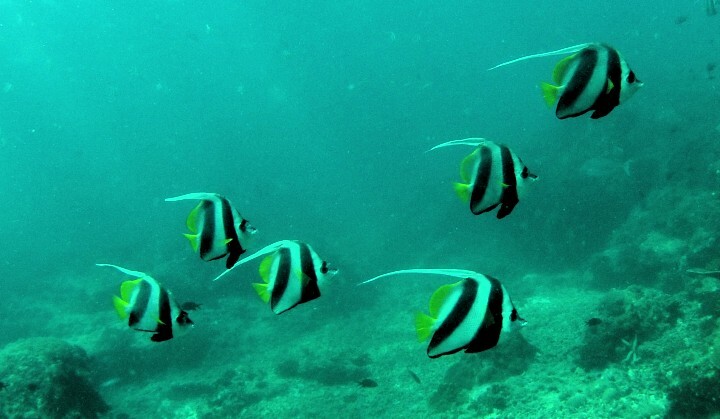 Mdumbi beach. There were a few surfers staying at the place too. Seems like a popular spot. On my way back I was riding a gravel corner when a cow ran in front of my bike at the last minute. I grabbed a fist full of front brake and fell off again on the same bad foot. Damn! I swore at the stupid cow that ran off and expected more ankle pain. Fortunately for me it wasn't crushed under the bike and it didn't seem to do much damage so I was lucky and drove a little slower round the cows on the rest of the way back. I get most of my travel advice from other travelers. Its the most up to date information and almost always a good choice. I was recommended to stay at Buccaneers Backpackers in*Cintsa as my next stop instead of heading into East London. 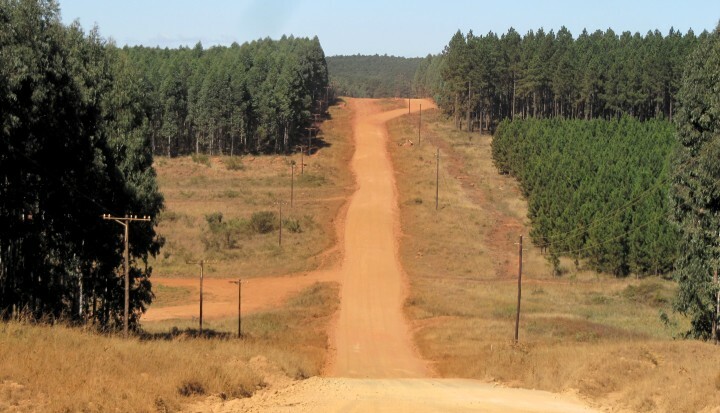 I drove a lot of gravel through the hills and eventually popped out on the N2. 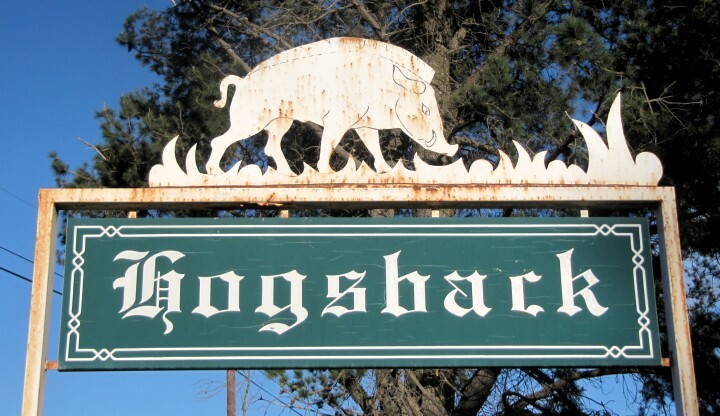 The next day I headed to Hogsback and checked in to Terra Khaya Eco Backpackers. Its an interesting off the grid eco farm with very friendly people. I managed to snag myself a room for 100 rand as their dorm is full of laborers working on some new buildings. They even have an out door bath which is pretty cool to use at night looking out at the stars above. 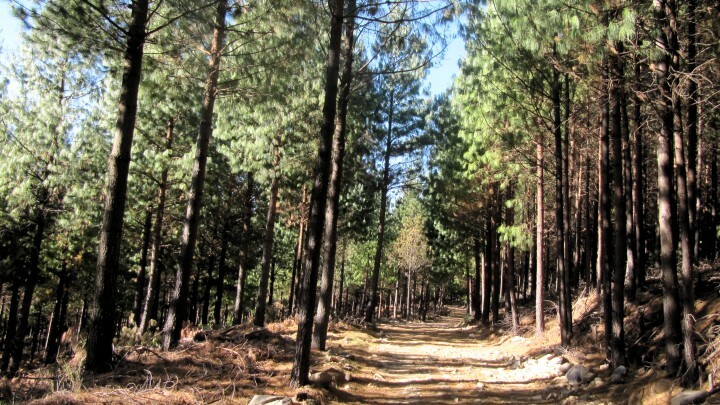 I spent the next day exploring 60 km's of the forest trails around the area. I rode across the side of this hill which I guess looks a bit like a hogs back (?) and round the back. Really nice trails. Tomorrow I'm probably going to head off somewhere else. I haven't decided where though so lets see what happens. Just over 2 weeks until I want to be in cape town giving myself a week to sort things out and sell the bike. I also need to begin looking into selling the bike. I've just put an advert up in the Wild Dog small ads section so check it out here. I'm very interested in any help selling it so if you know anyone who might want it or if you yourself want the bike let me know by PM. All the details are in the thread there. I'm also interested what you think about the price (22,000 rand) and description etc.. I plan on listing it on gumtree soon but thought I would try here first.